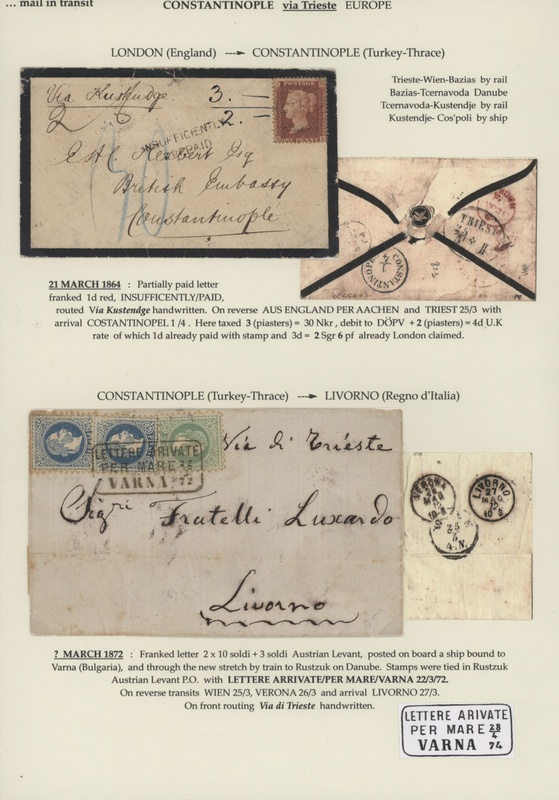 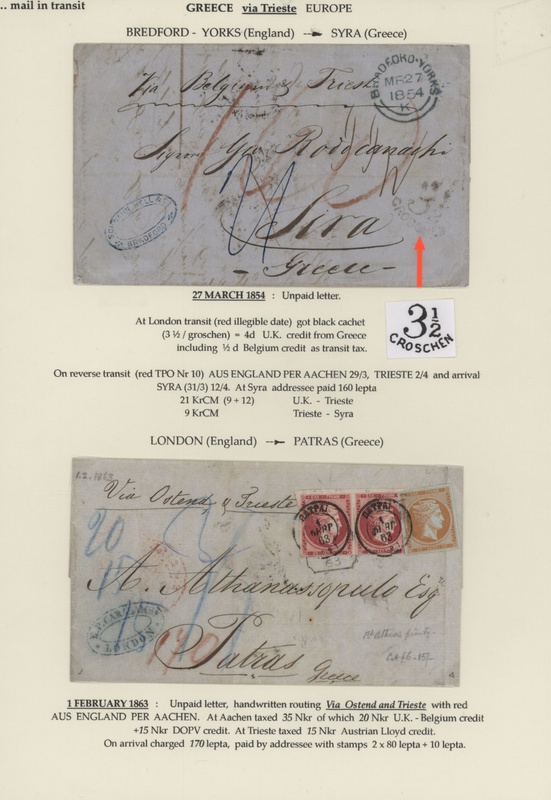 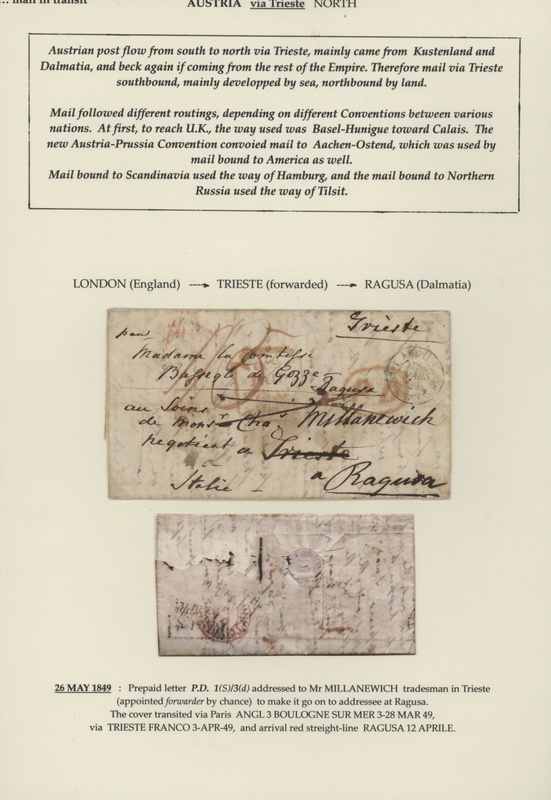 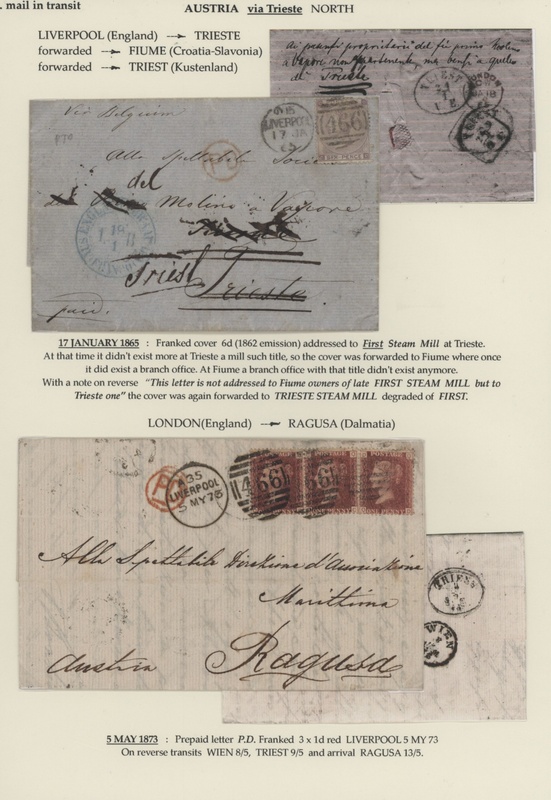 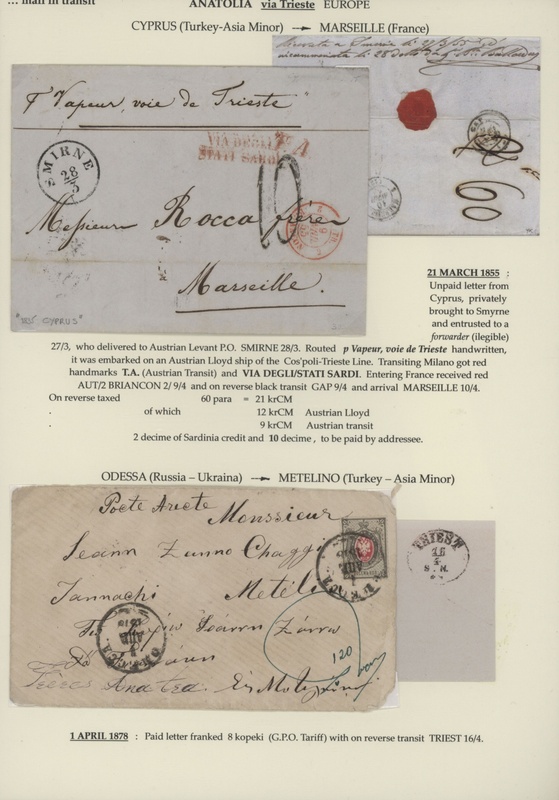 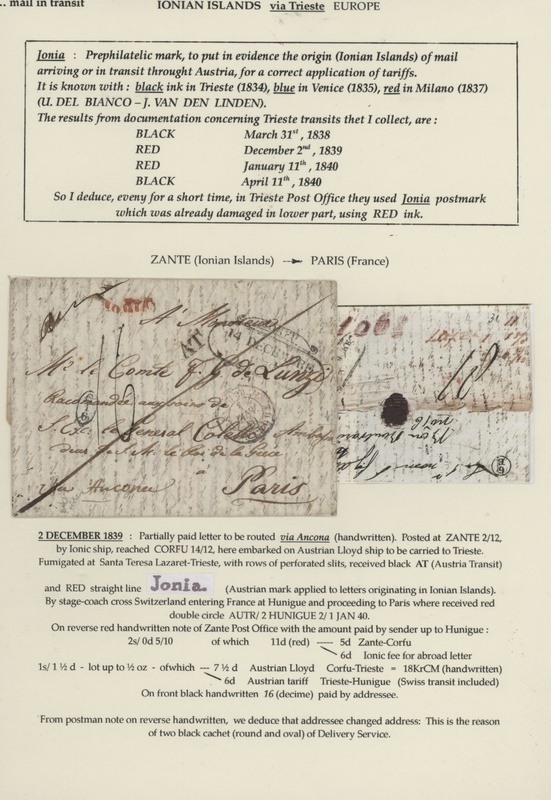 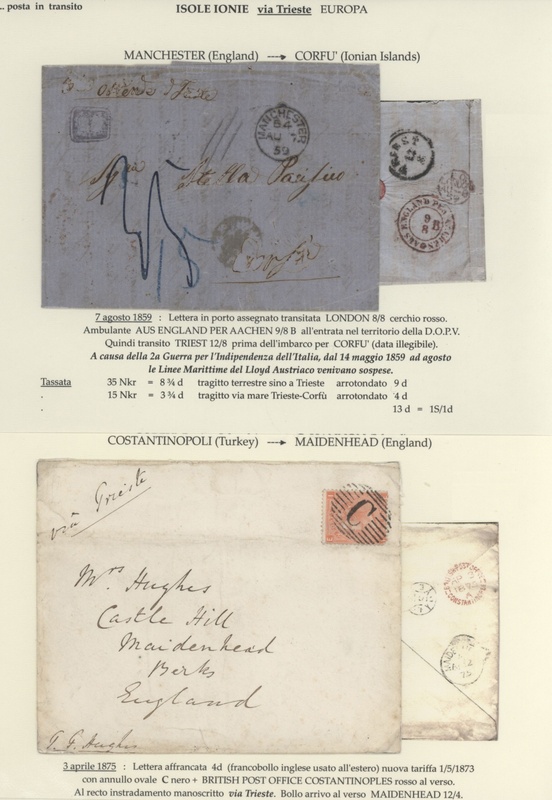 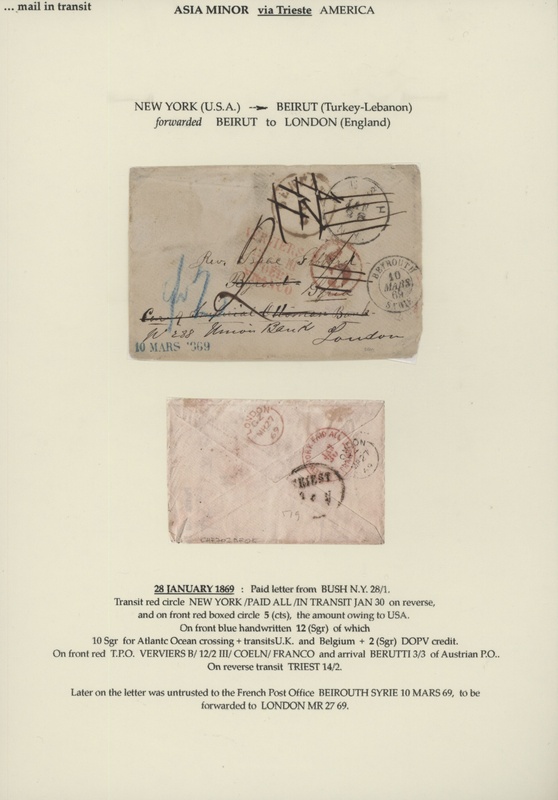 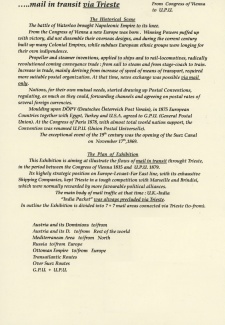 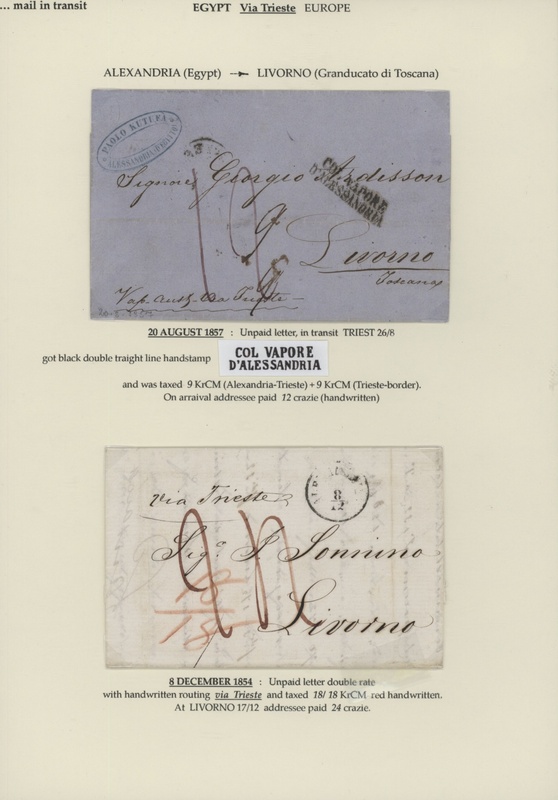 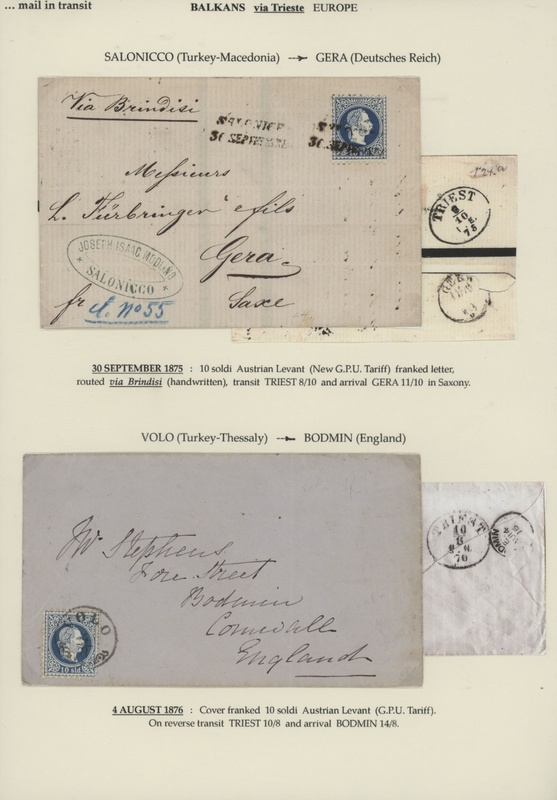 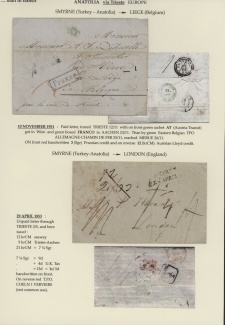 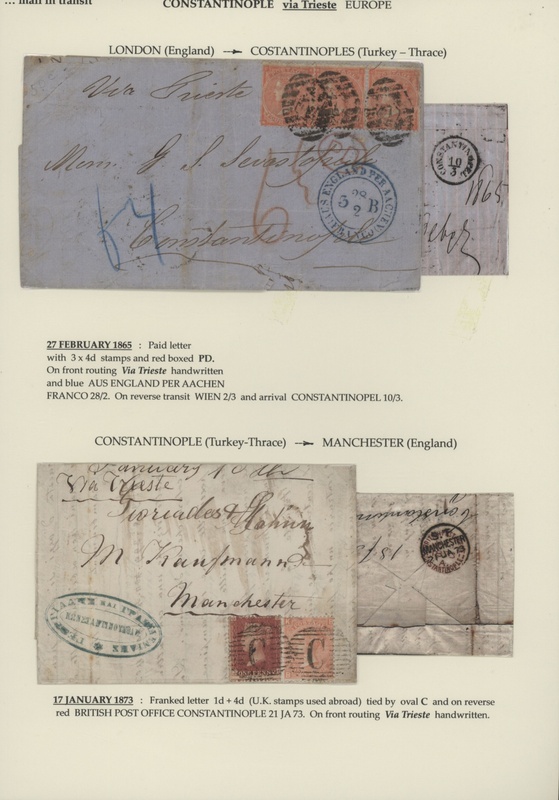 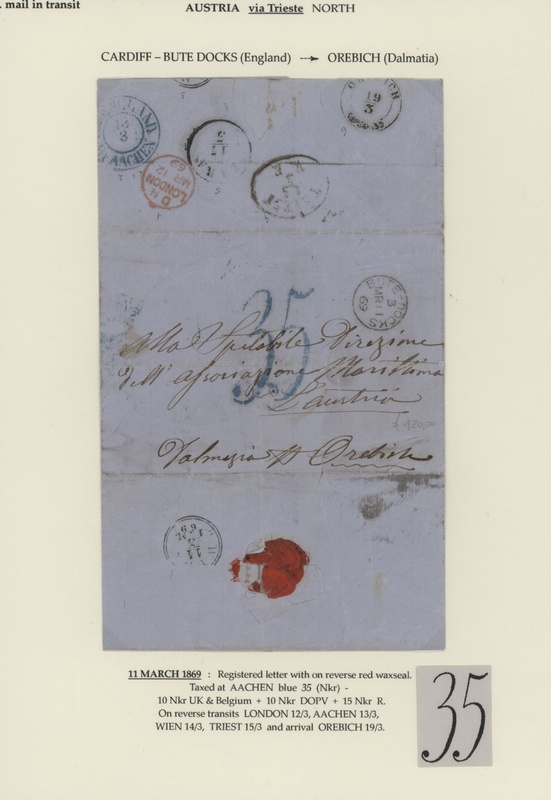 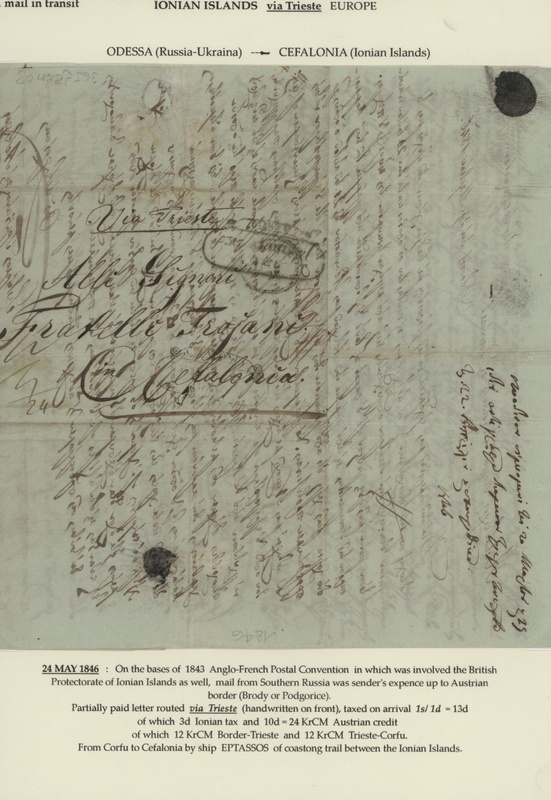 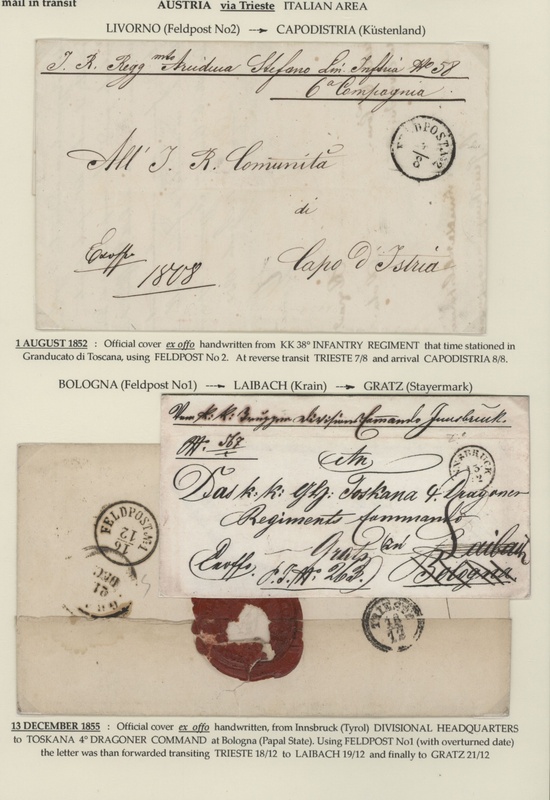 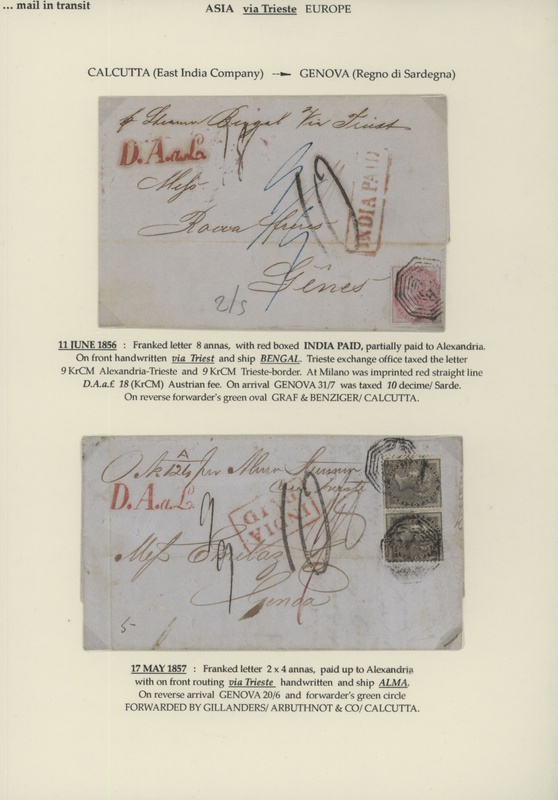 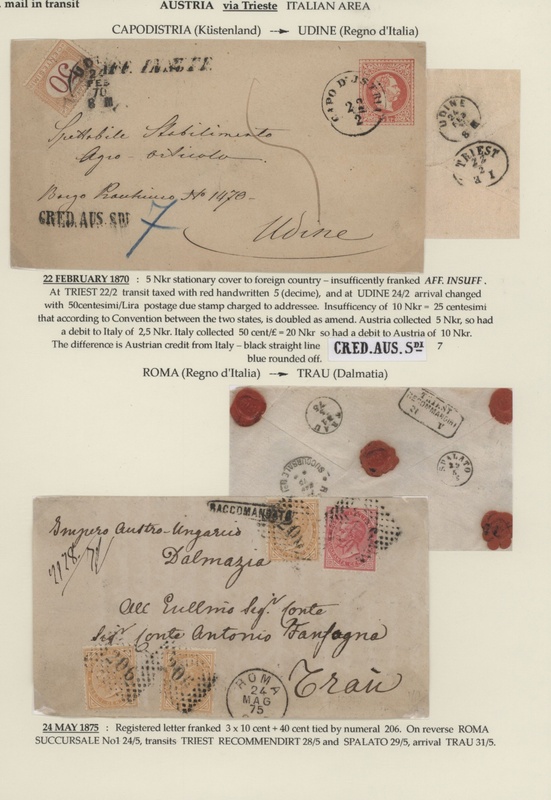 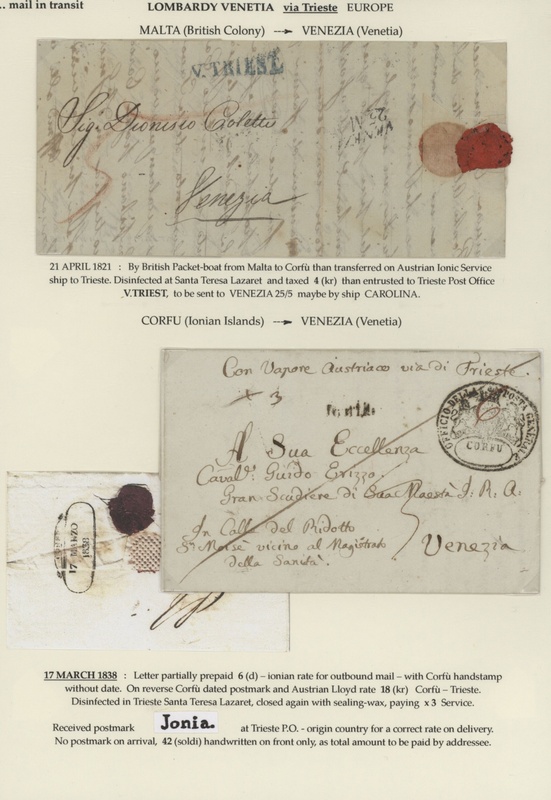 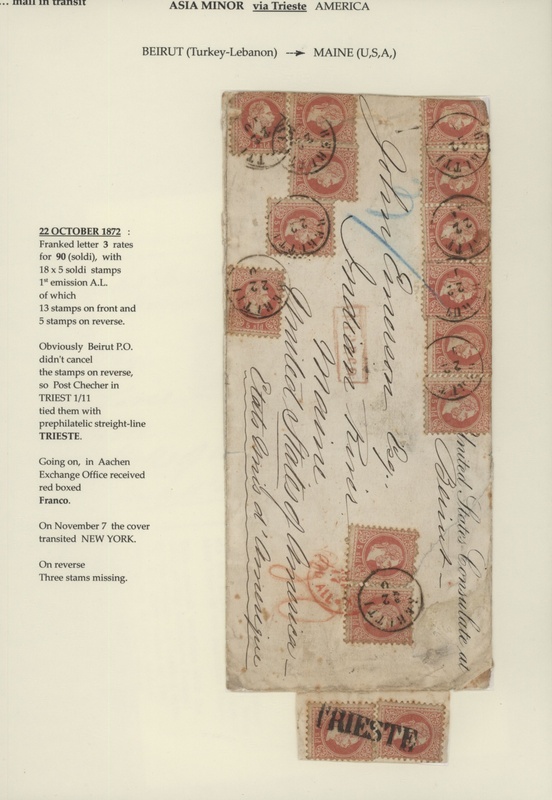 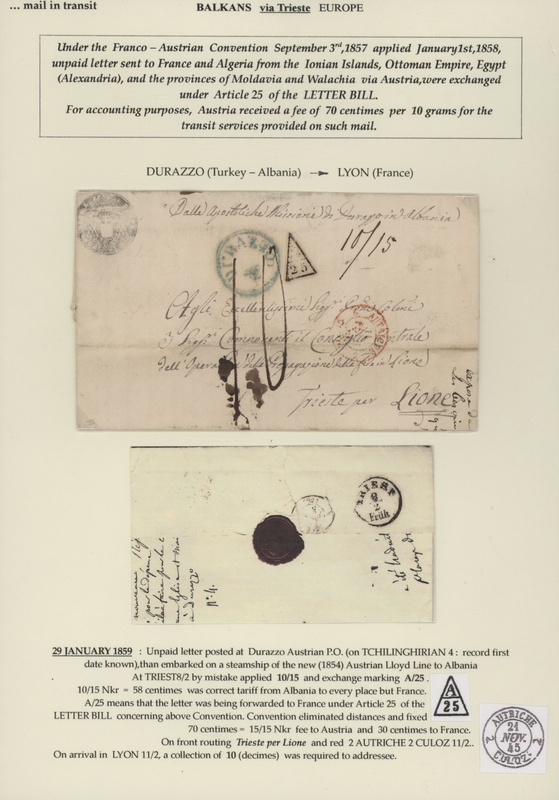 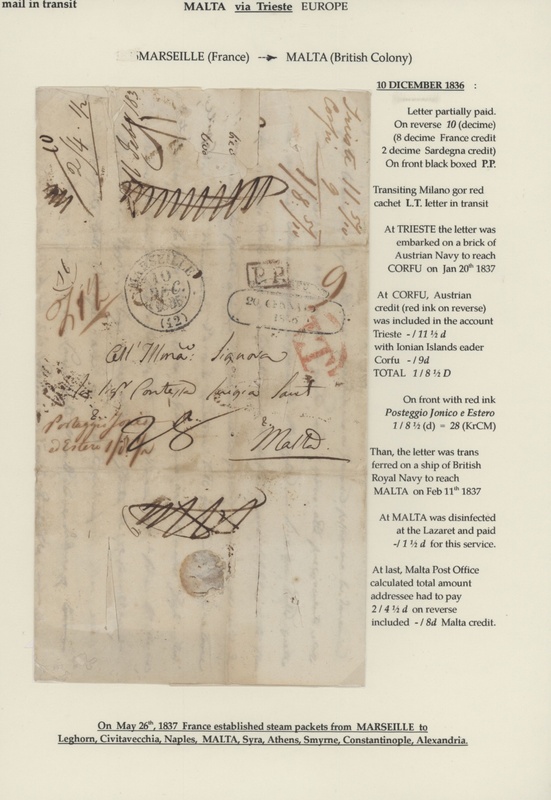 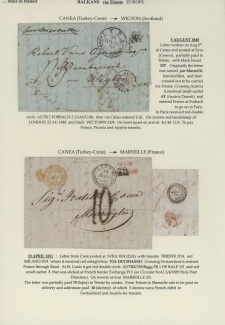 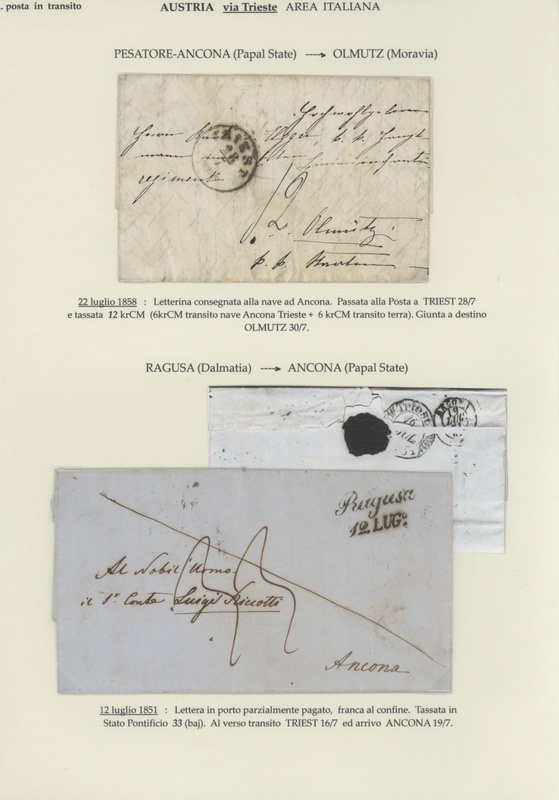 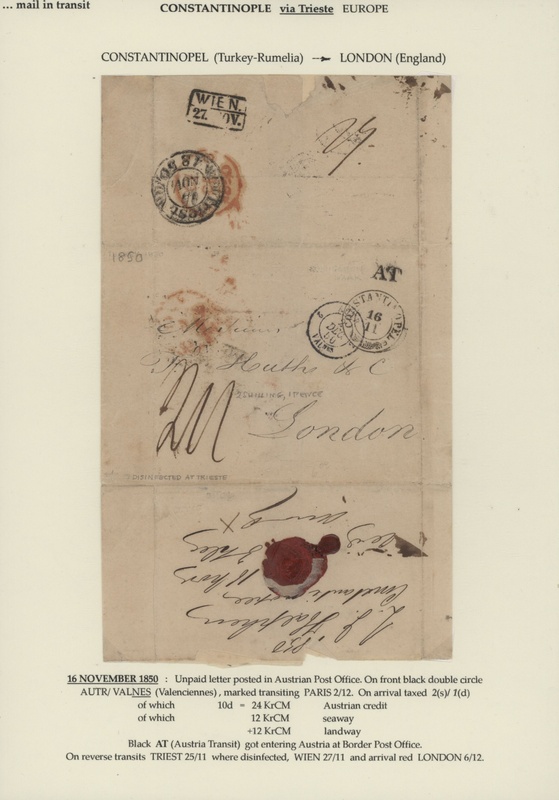 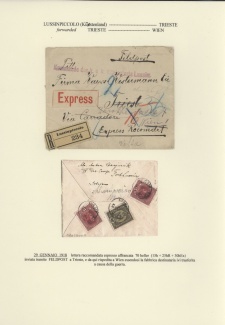 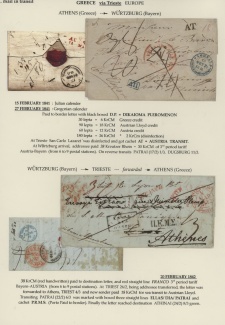 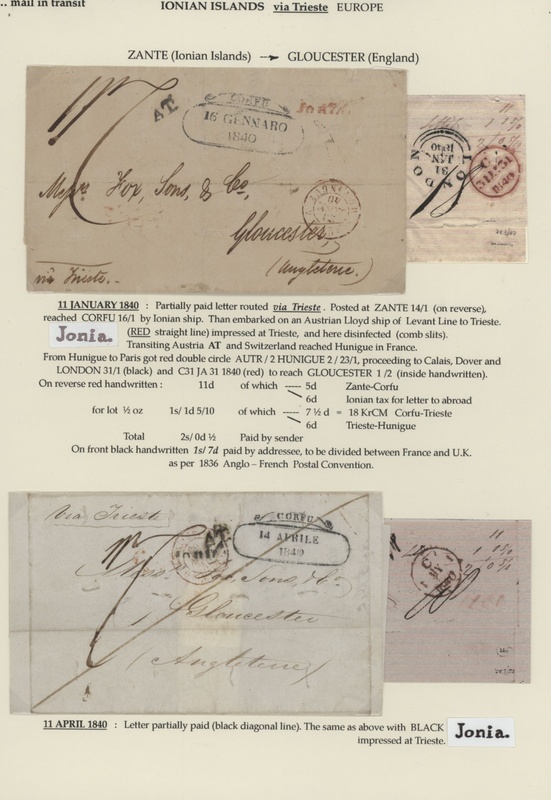 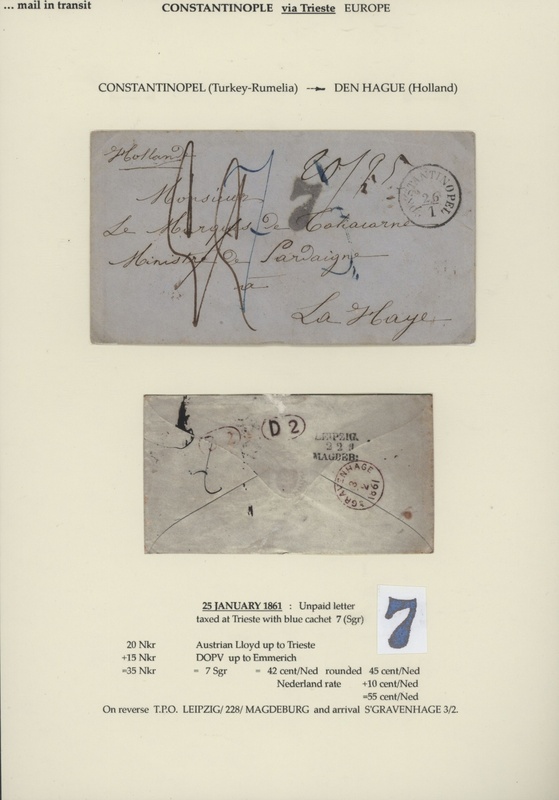 Substantial selection from a remarkable award winning Exhibition Collection ... MAIL IN TRANSIT VIA TRIESTE also exhibited at London Europhilex 2015. 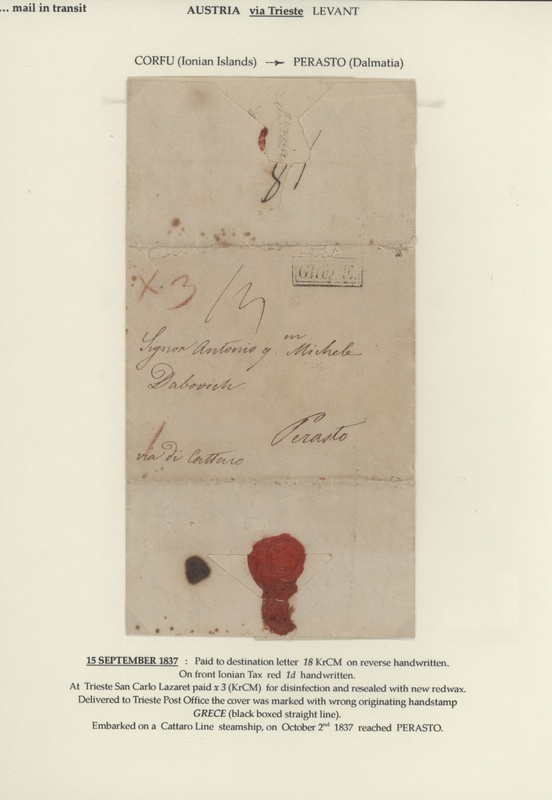 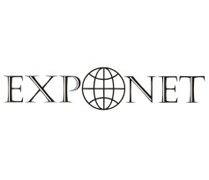 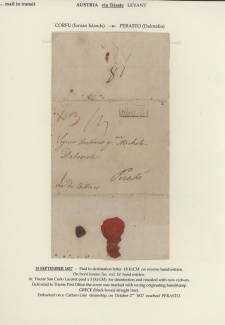 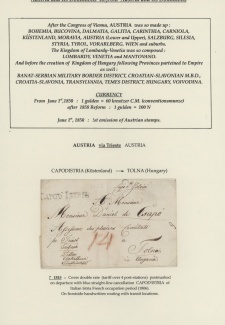 This presentation consists of two parts: the first one from Congress of Vienna (1815) to U.P.U. 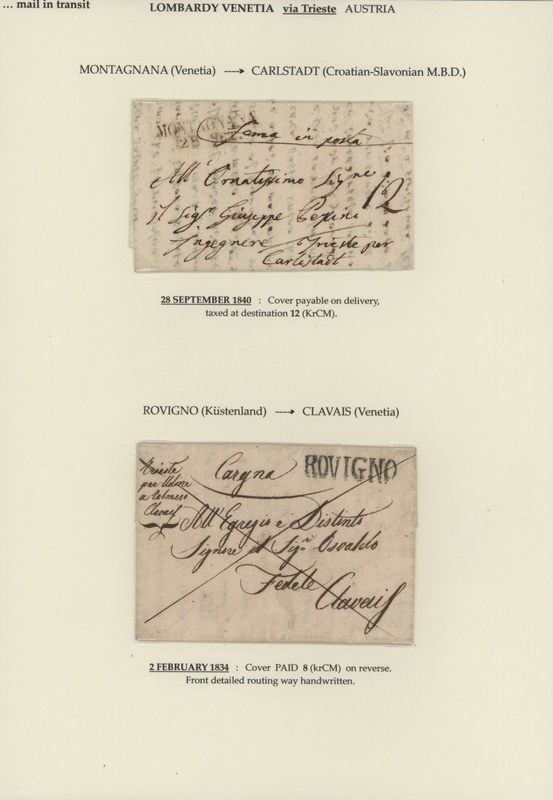 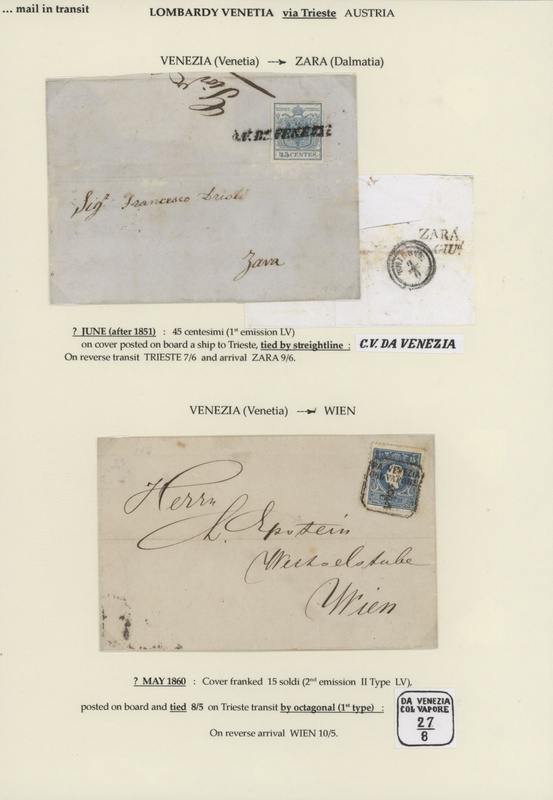 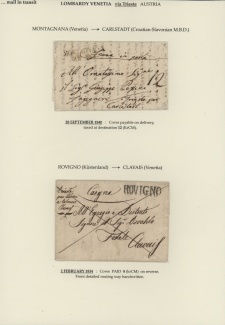 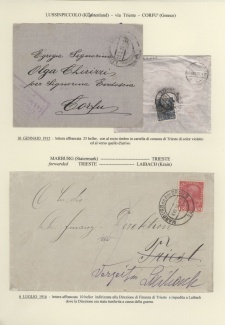 (1879) and the second one related to Trieste from 1778 to 1918. The first part contains mail via Trieste -from and to- including mail from Russia, Ottoman Empire, Transatlantic Route, over Suez route etc. 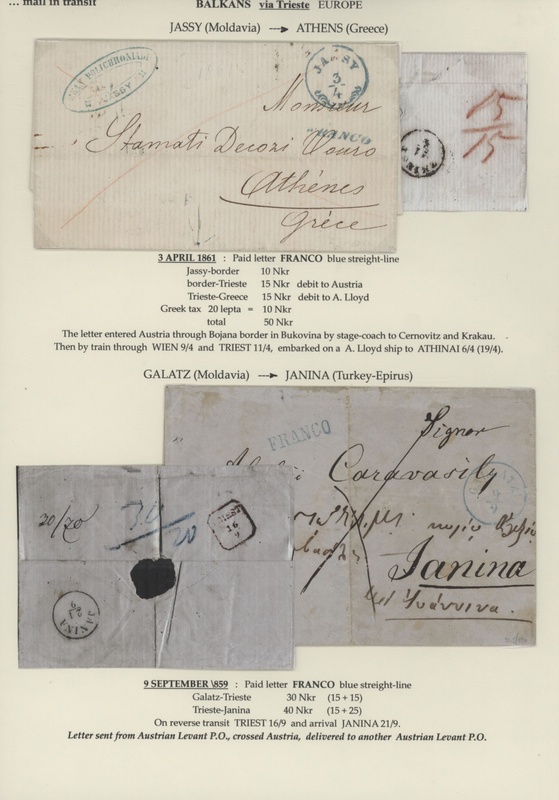 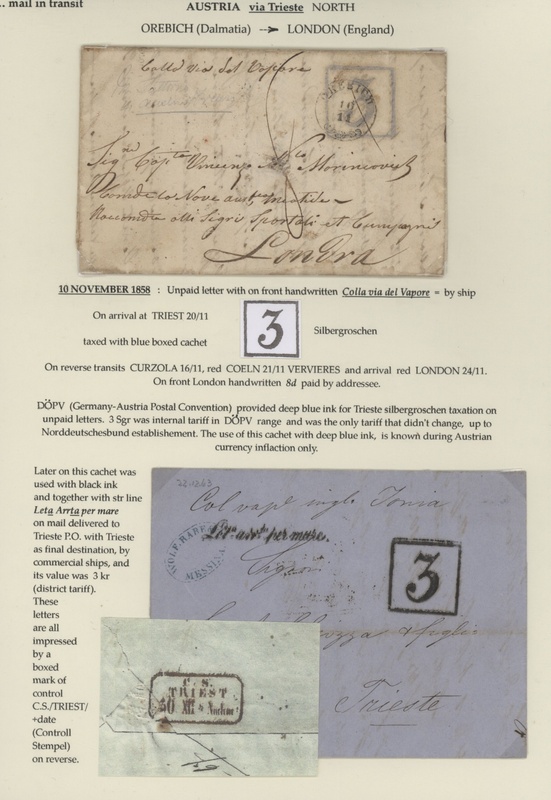 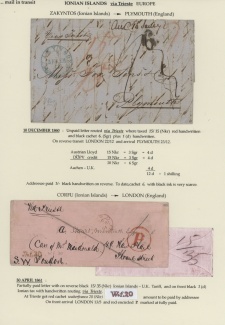 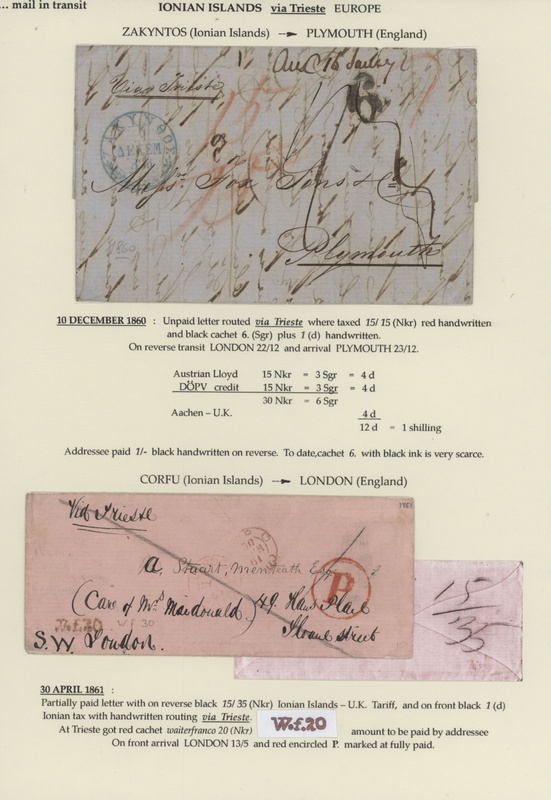 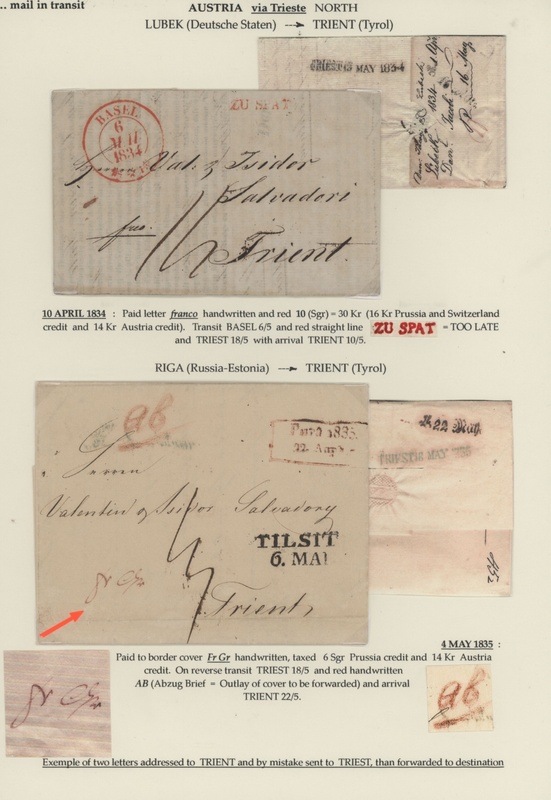 Other than that mentioned you will find some spectacular frankings (including colour-, high- and multiple frankings), scarce datestamps, transit marks, tax marks and other interesting postmarks. 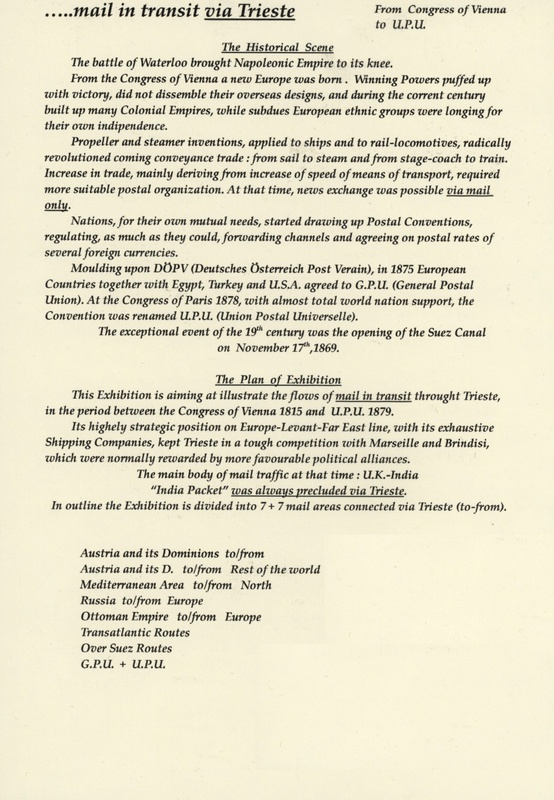 Also good destinations and incoming mail, for example from and to the Ionian Islands, from Australia, India and others. 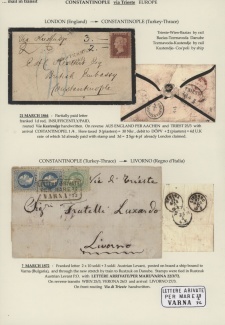 In the second part you will find covers, cards, parcel cards, etc. 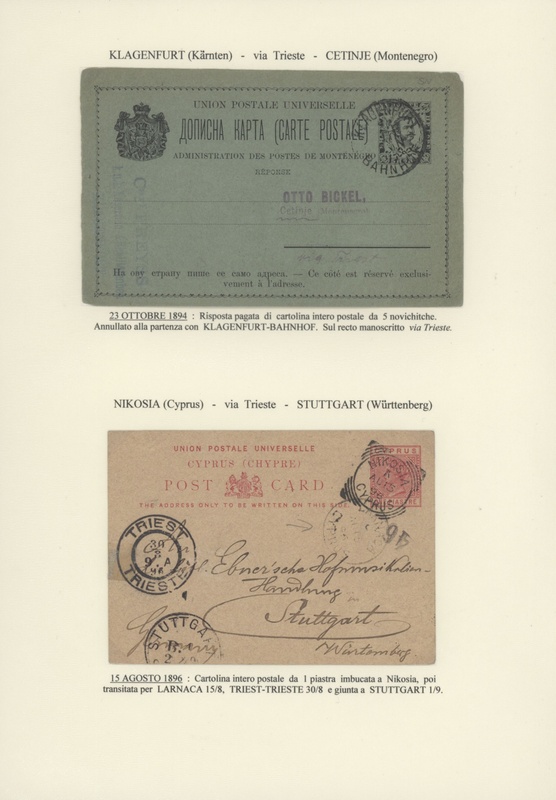 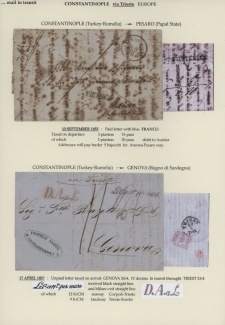 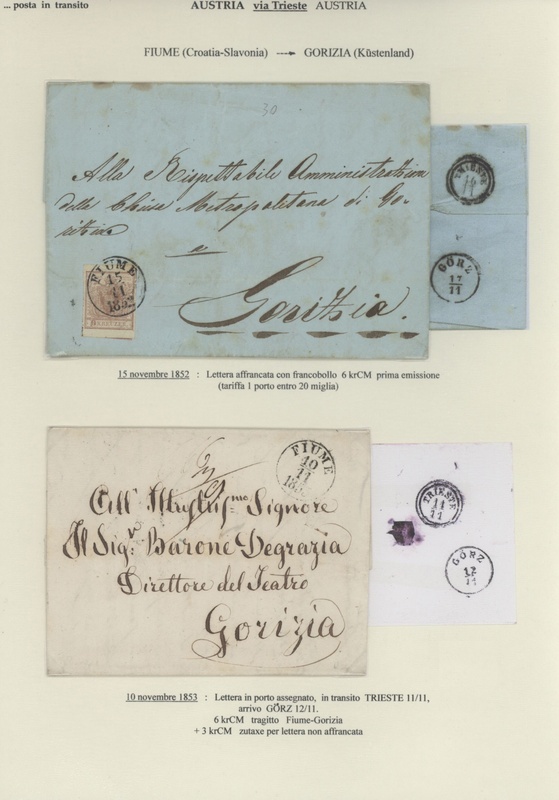 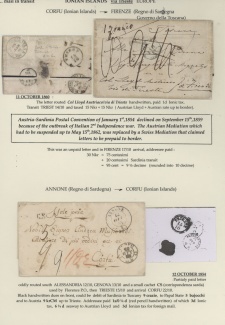 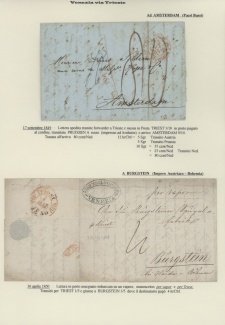 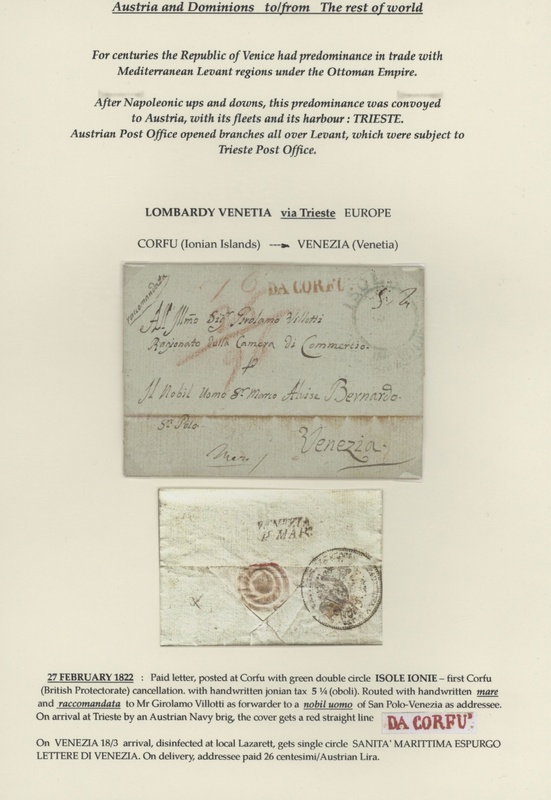 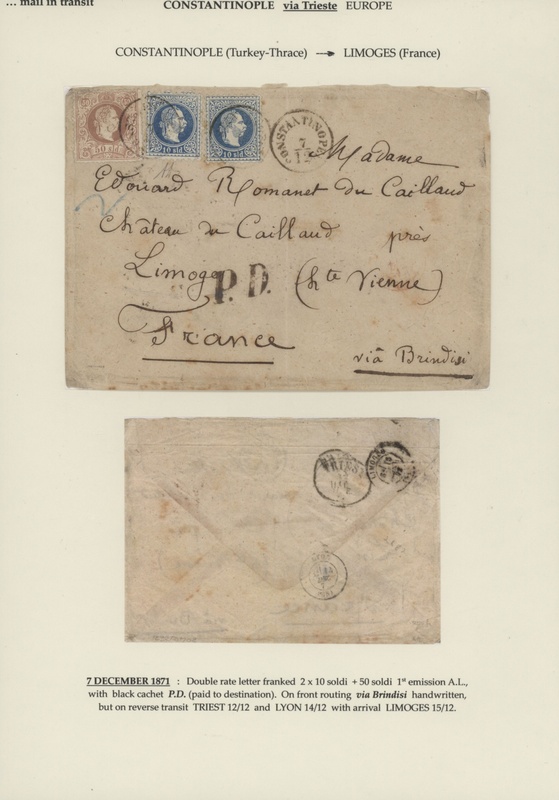 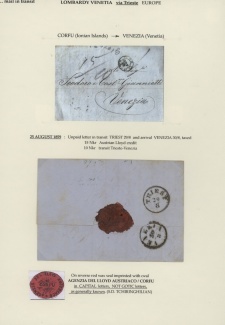 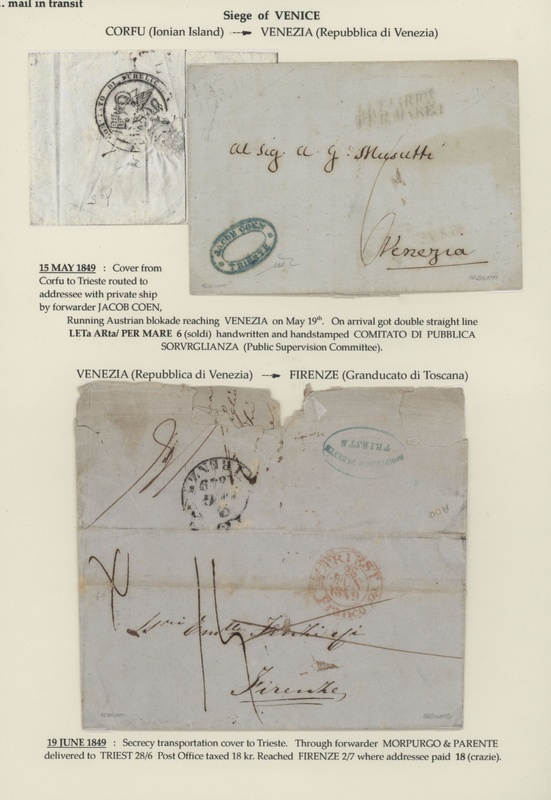 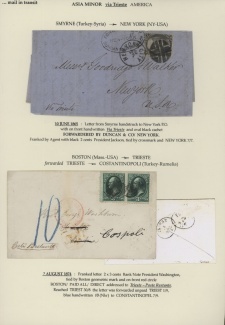 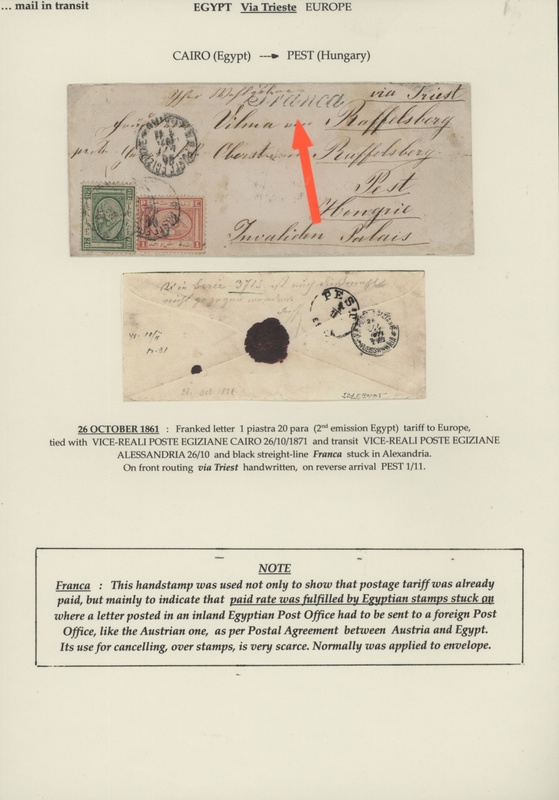 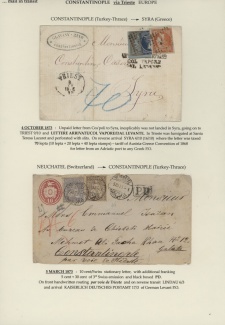 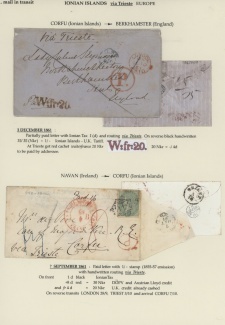 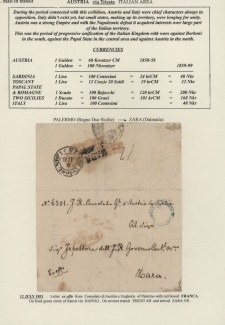 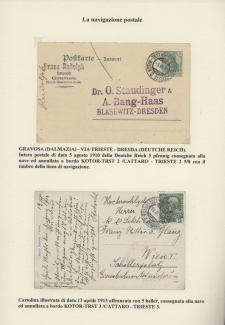 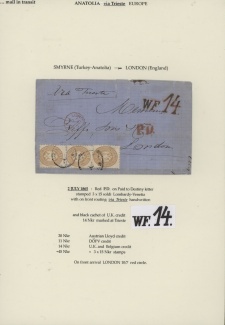 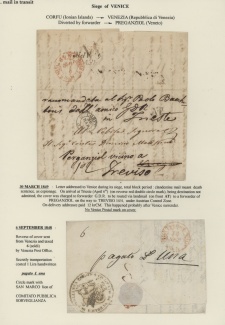 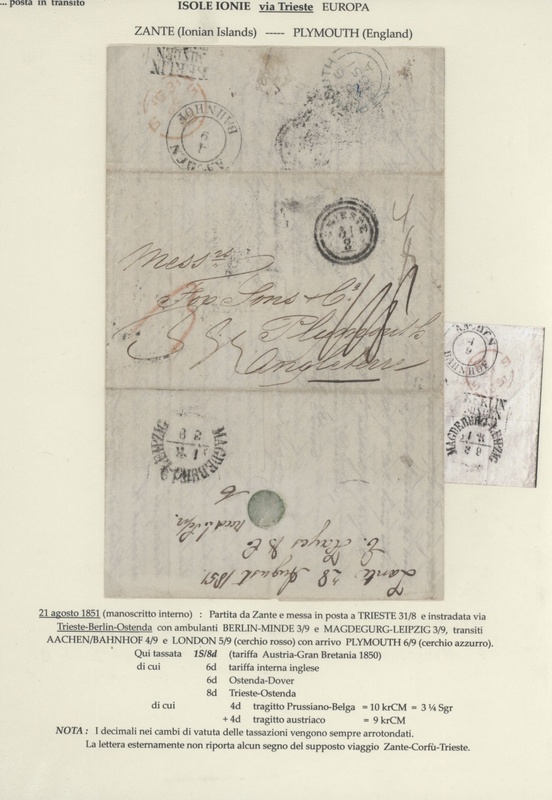 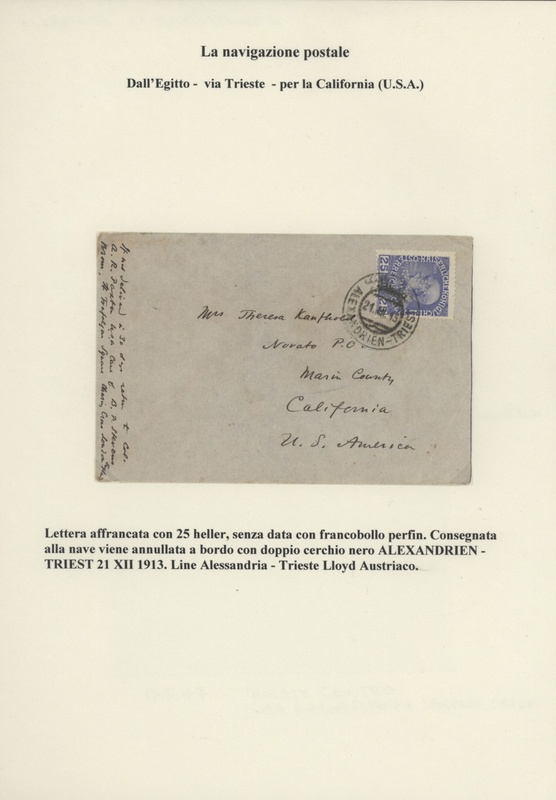 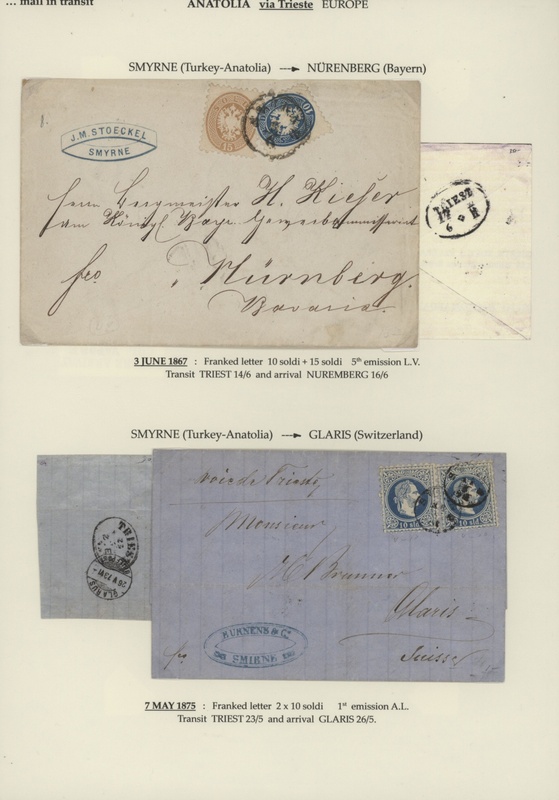 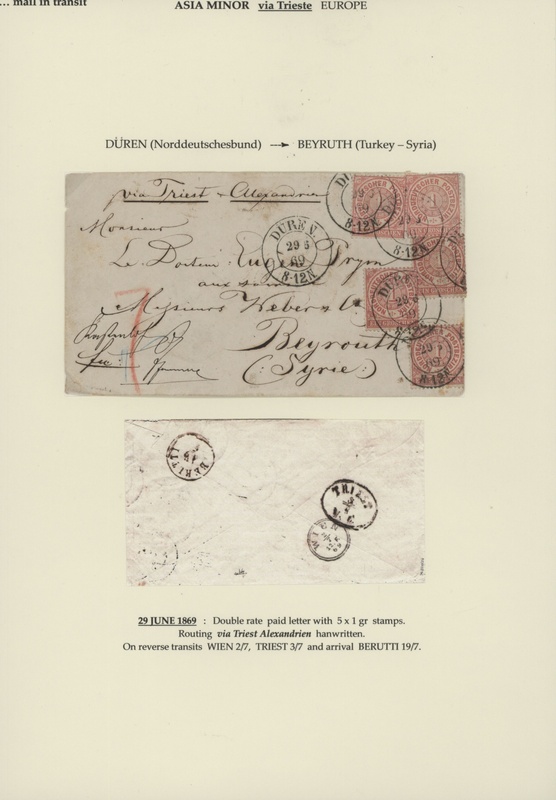 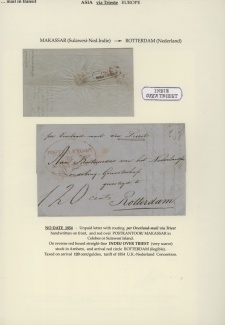 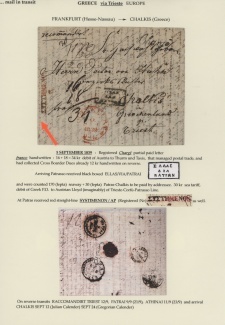 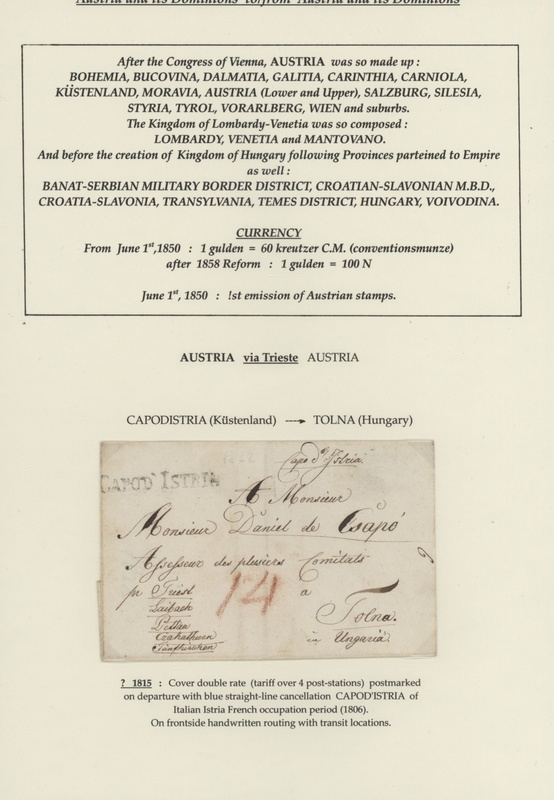 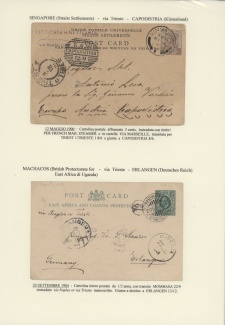 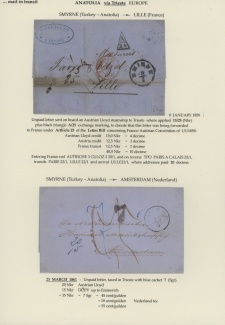 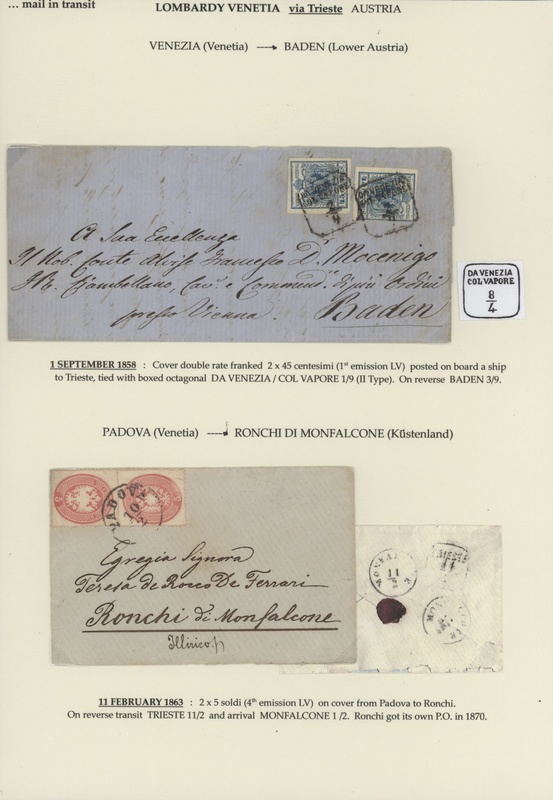 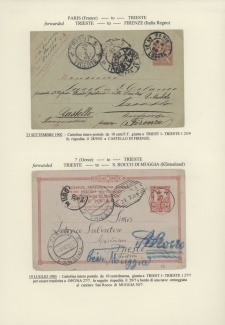 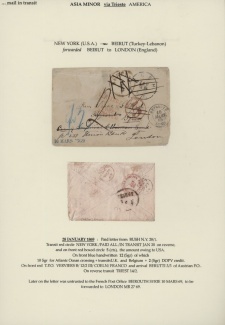 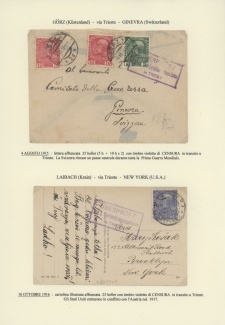 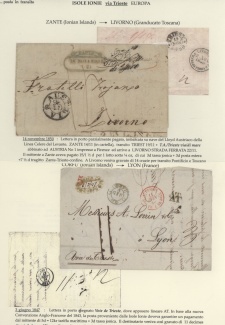 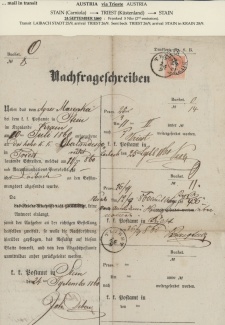 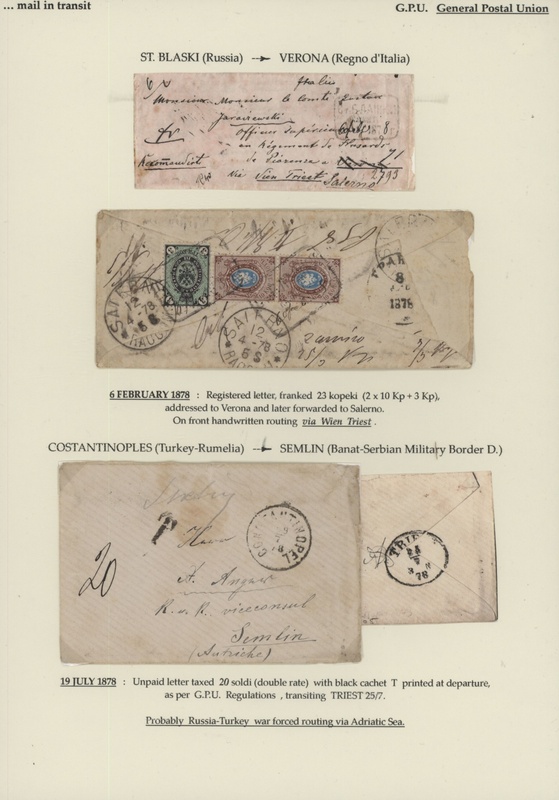 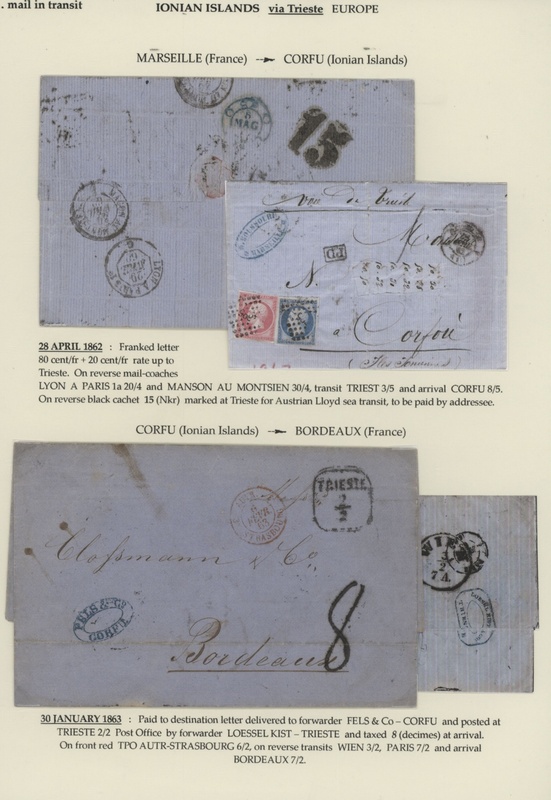 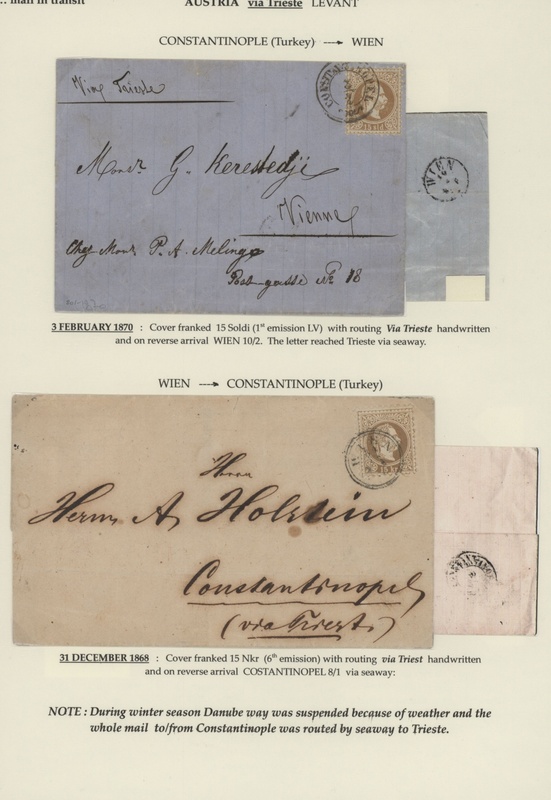 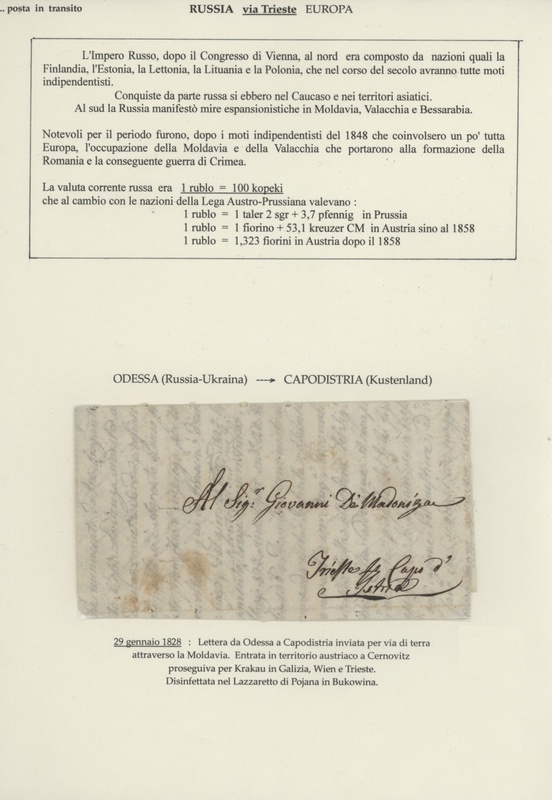 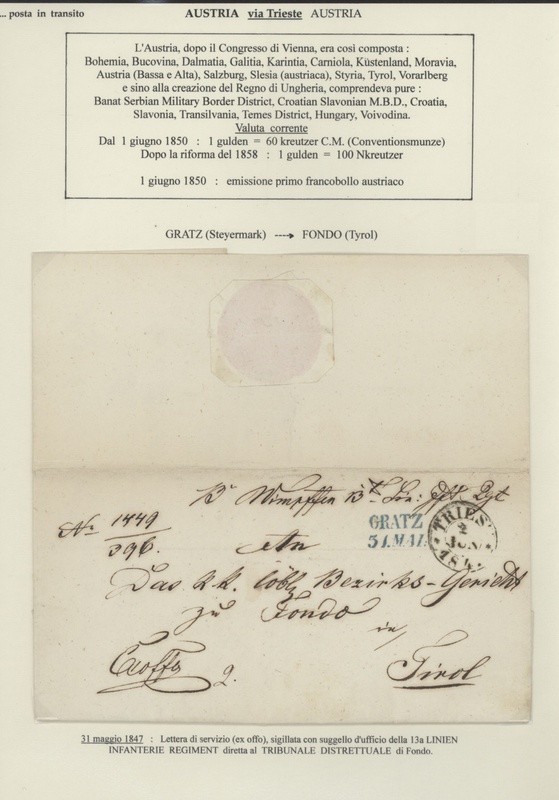 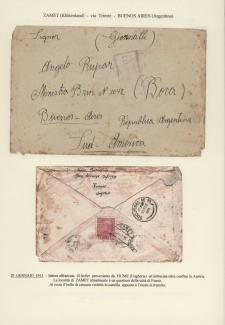 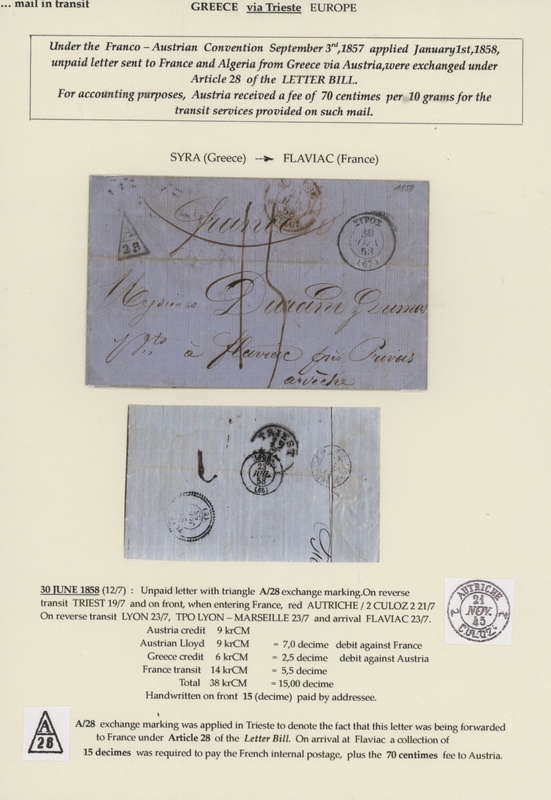 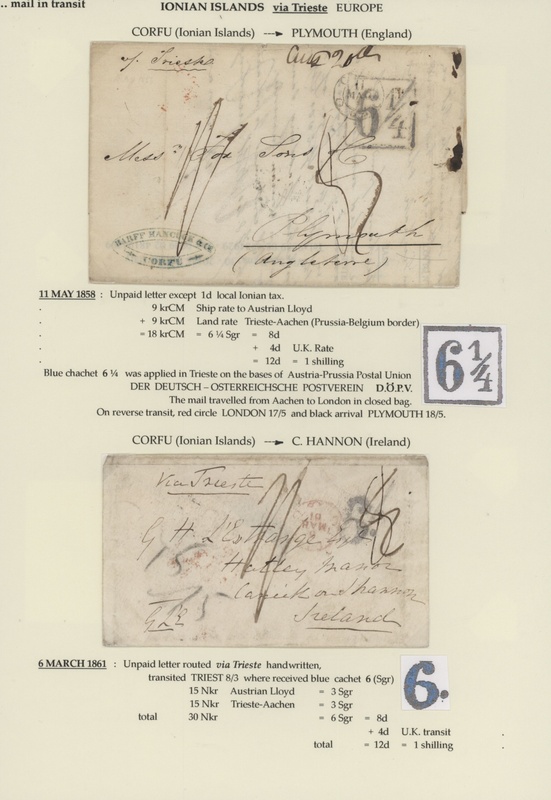 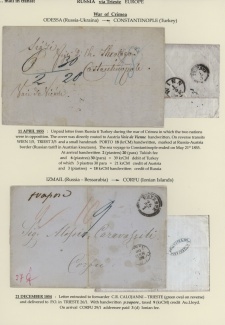 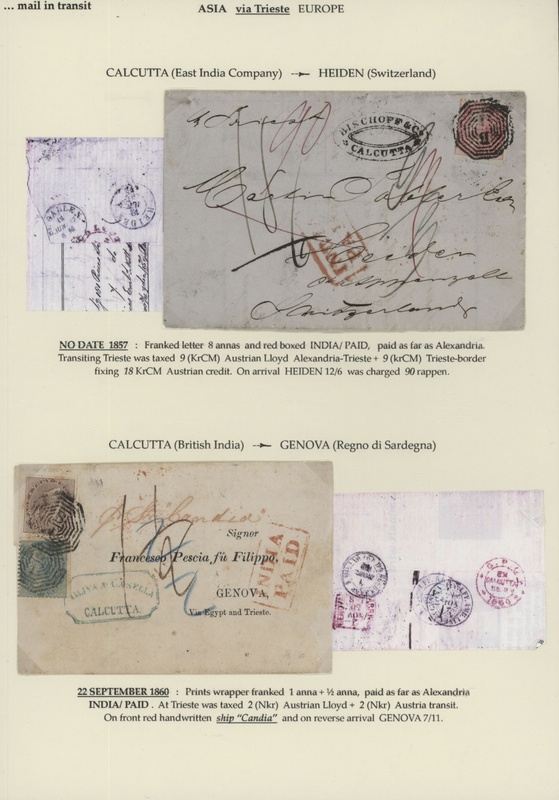 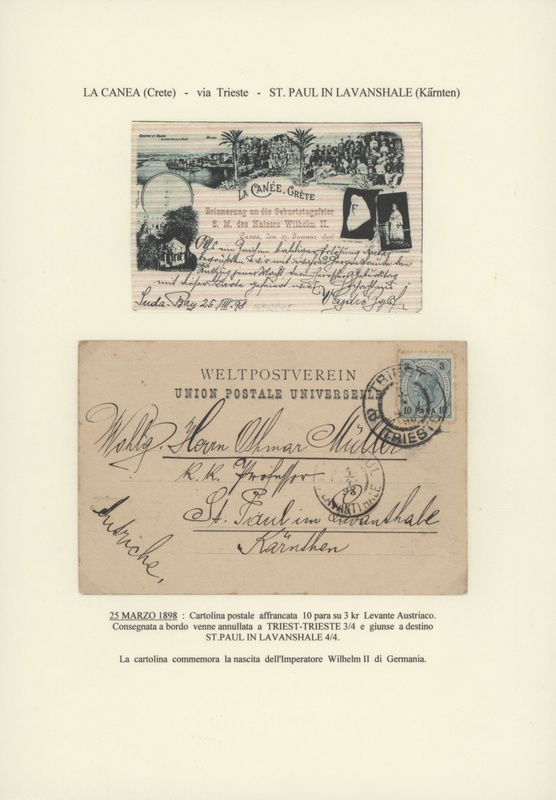 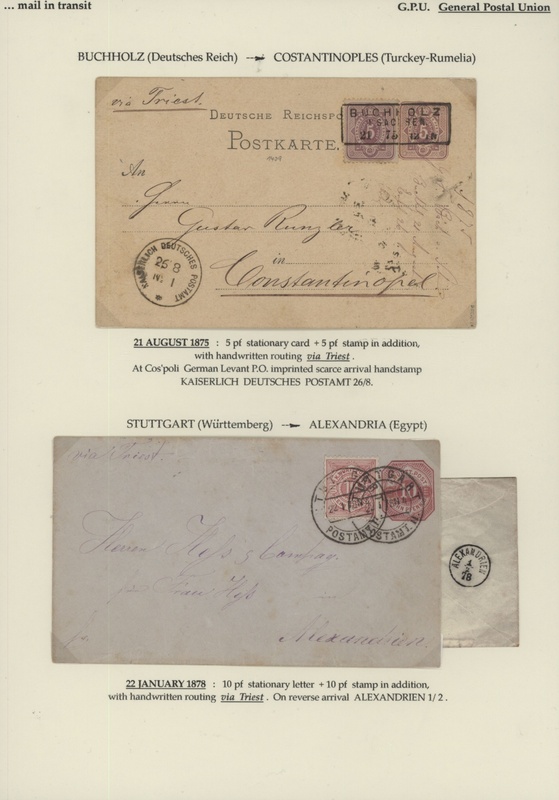 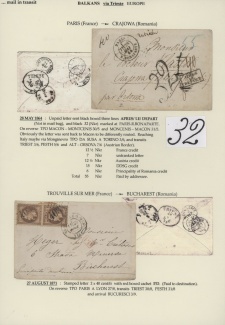 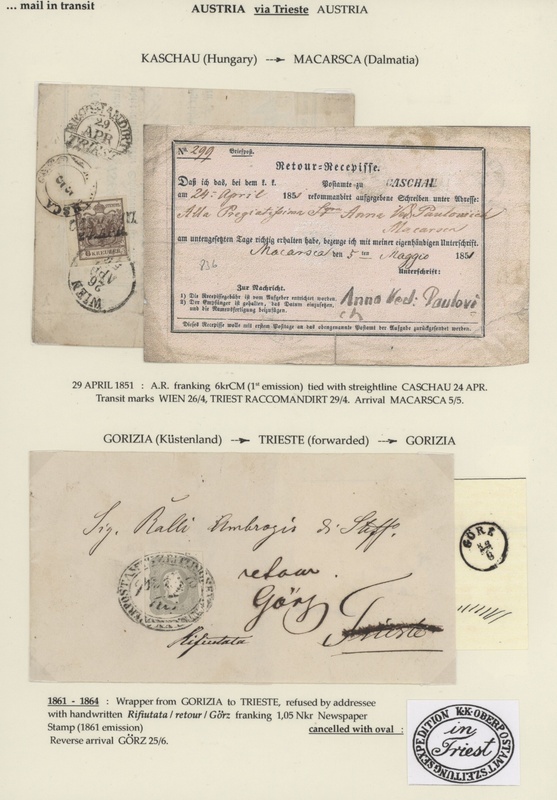 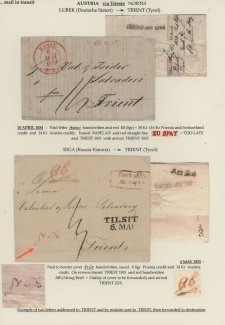 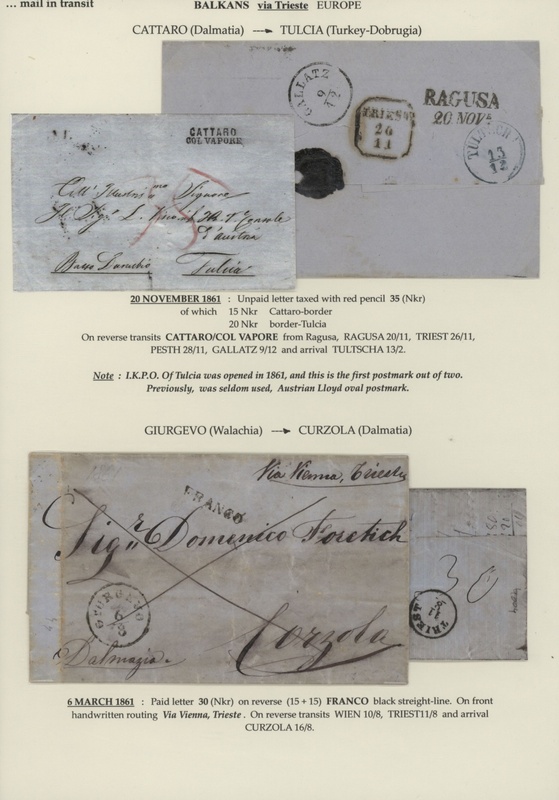 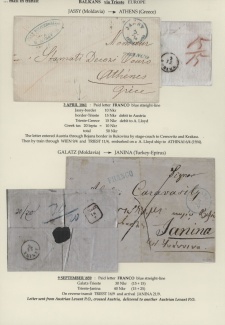 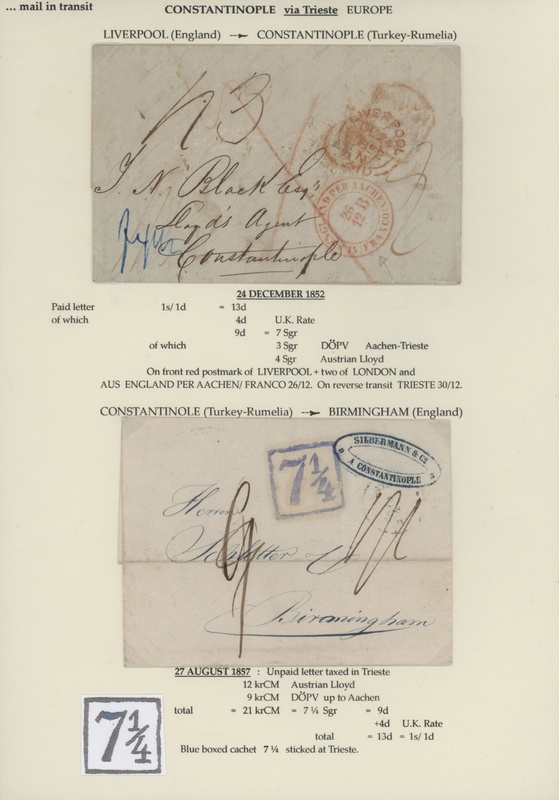 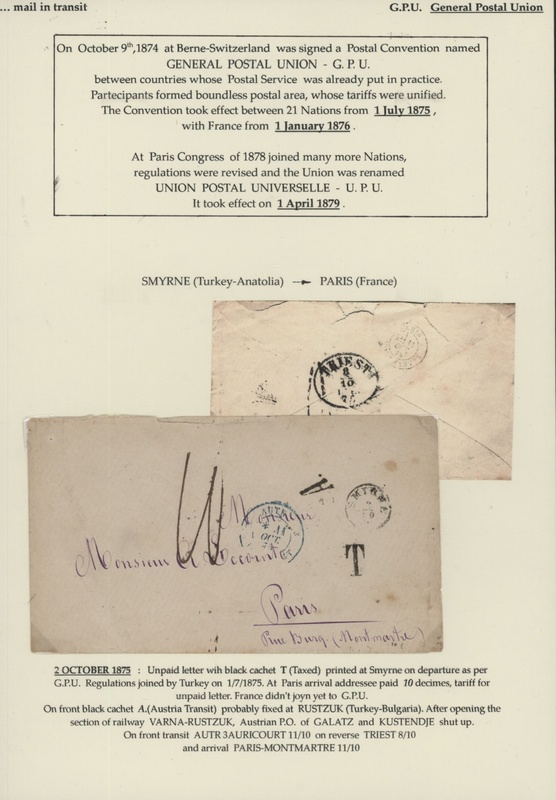 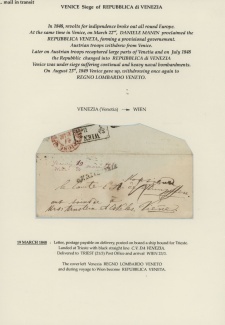 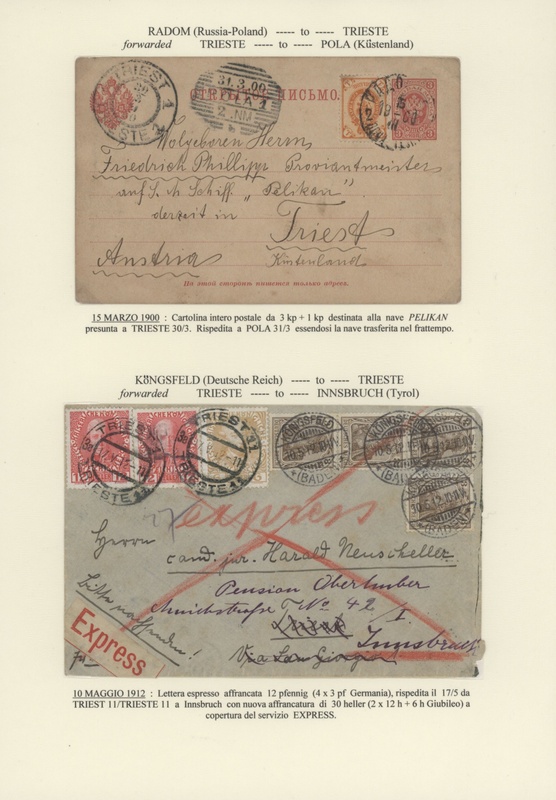 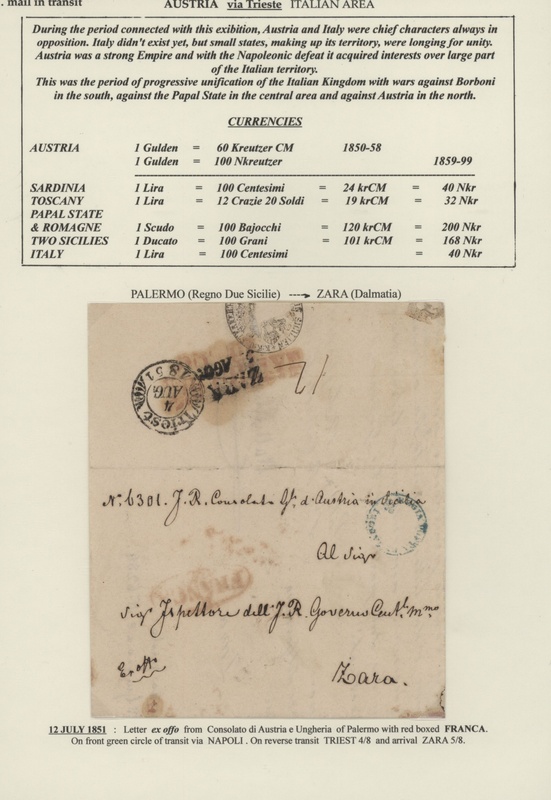 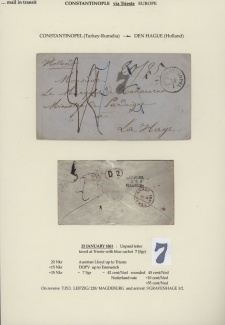 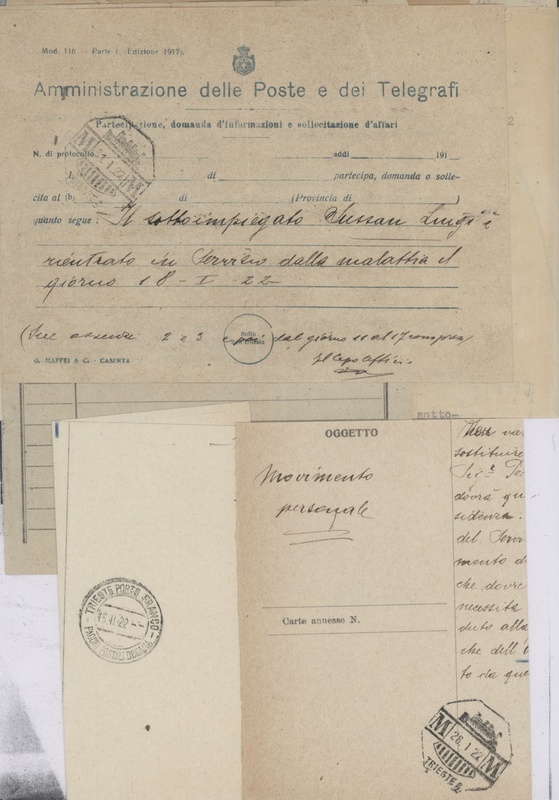 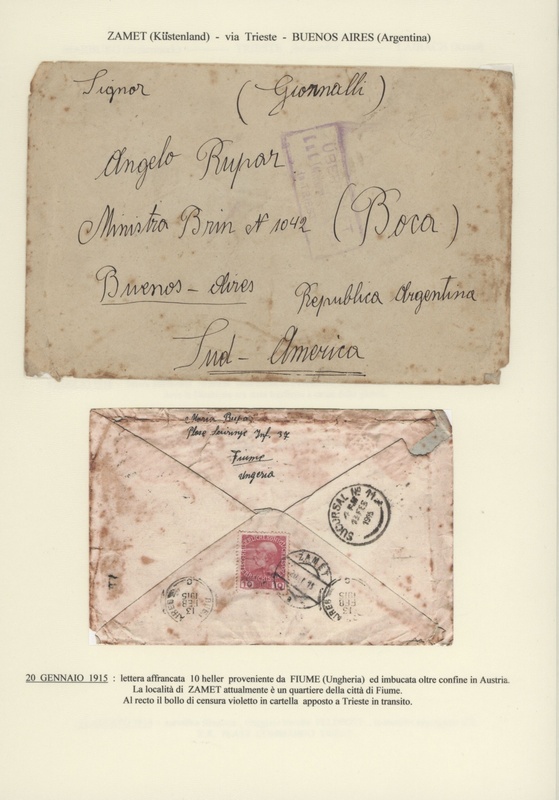 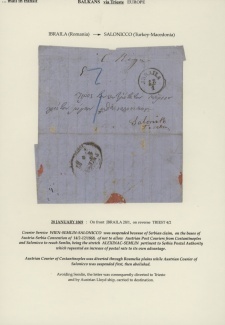 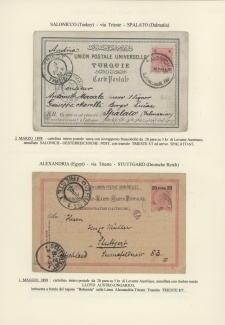 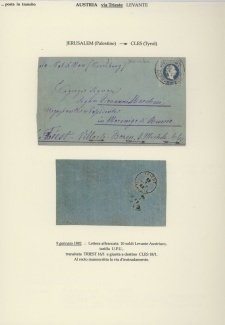 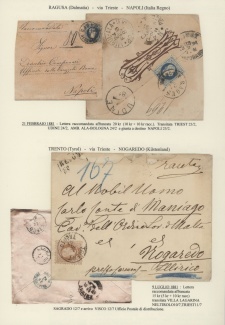 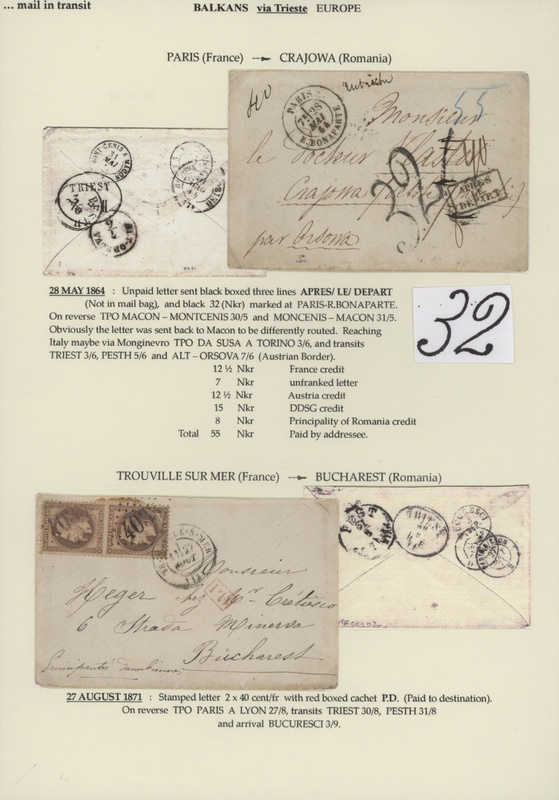 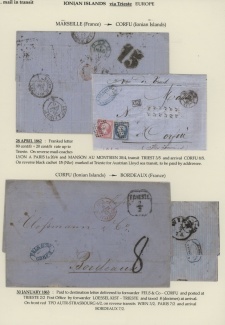 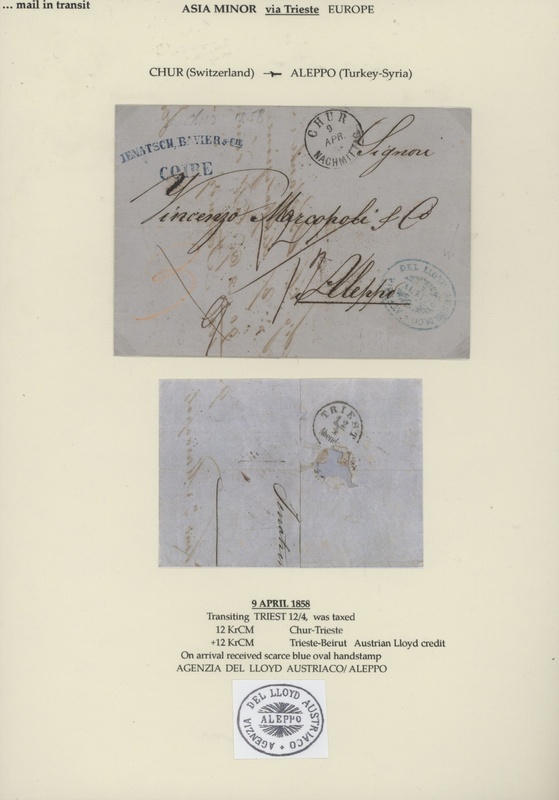 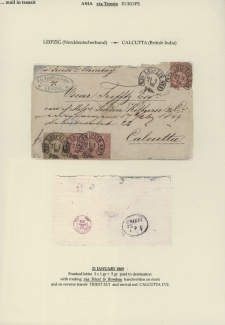 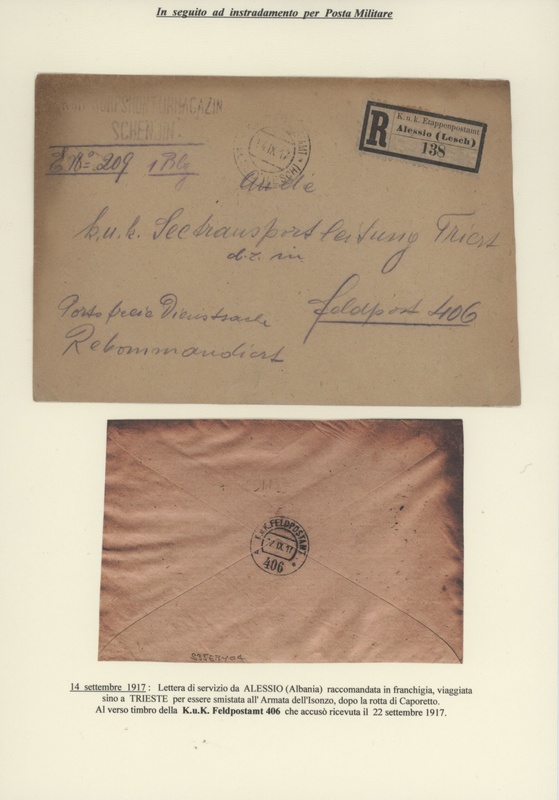 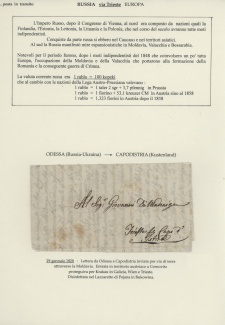 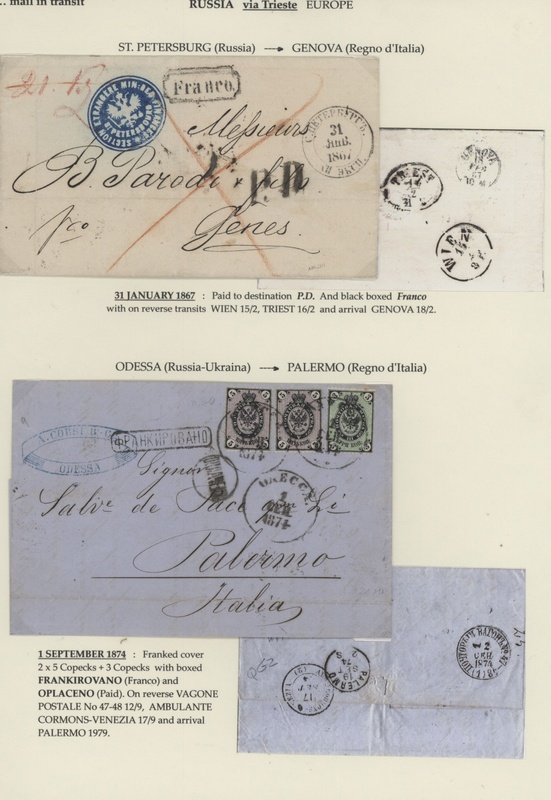 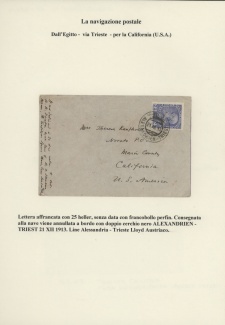 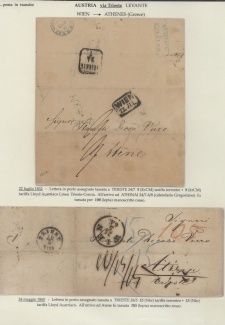 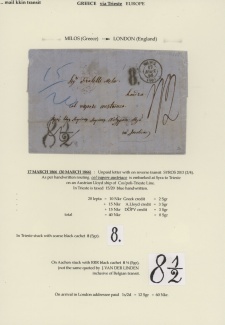 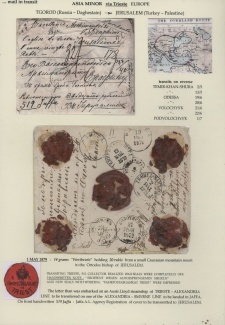 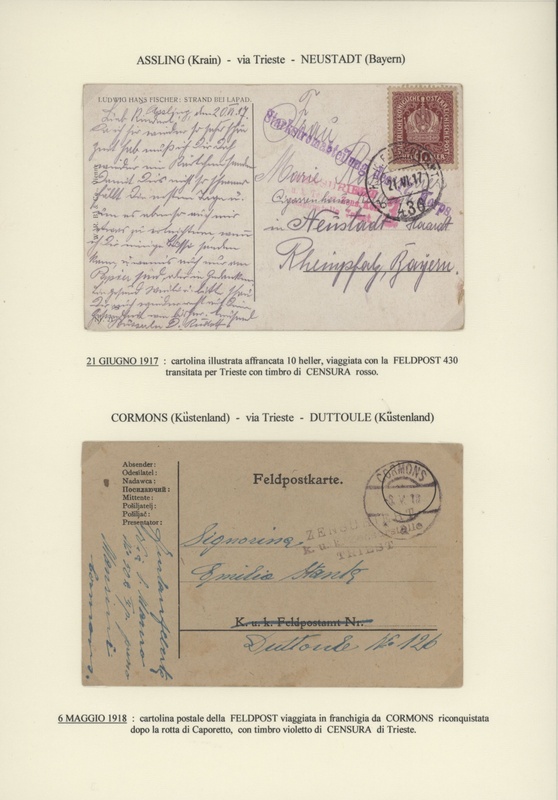 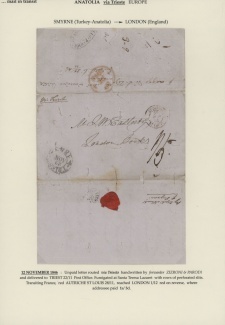 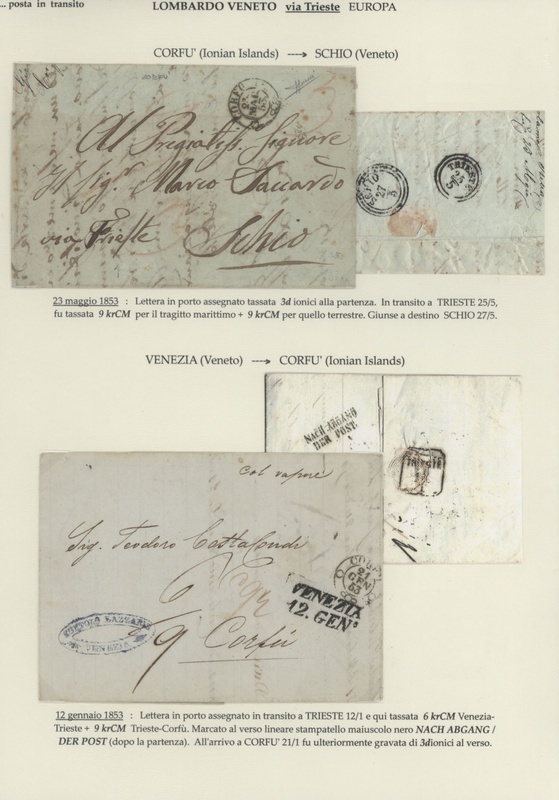 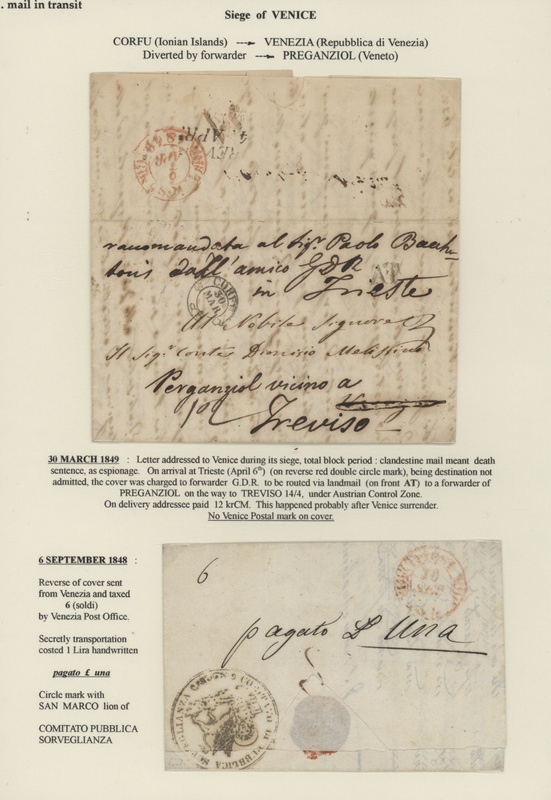 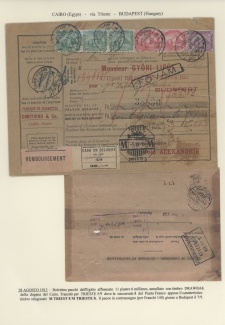 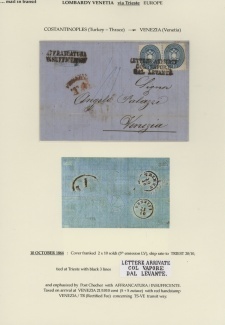 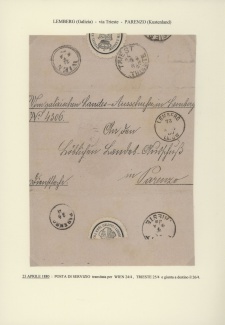 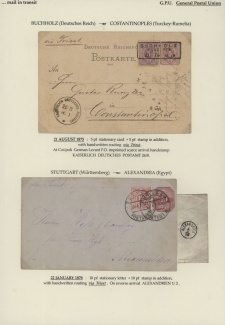 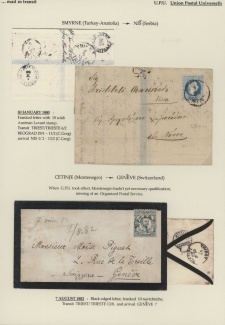 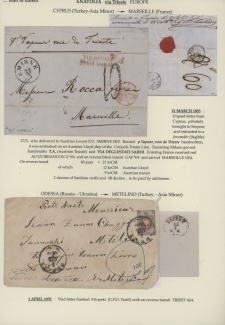 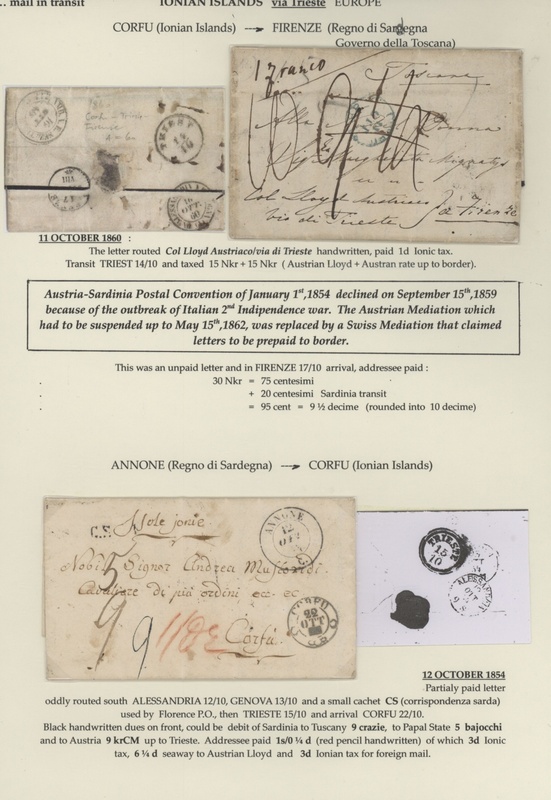 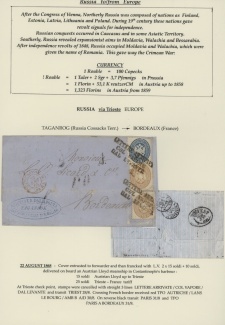 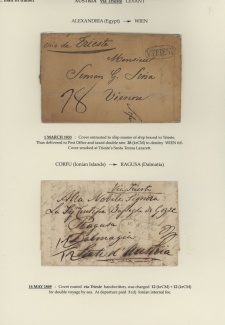 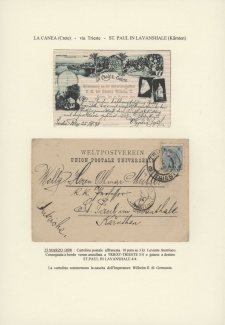 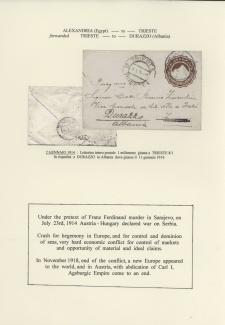 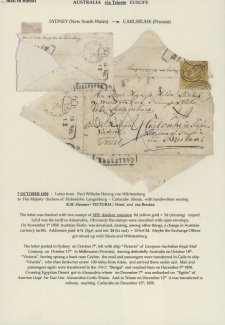 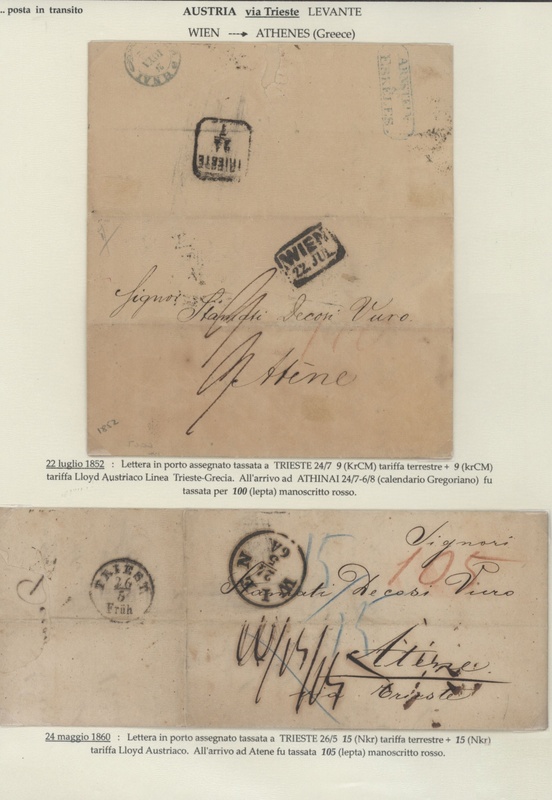 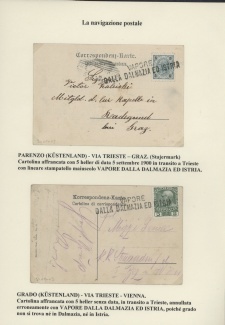 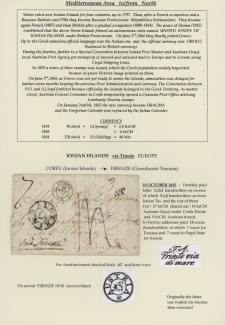 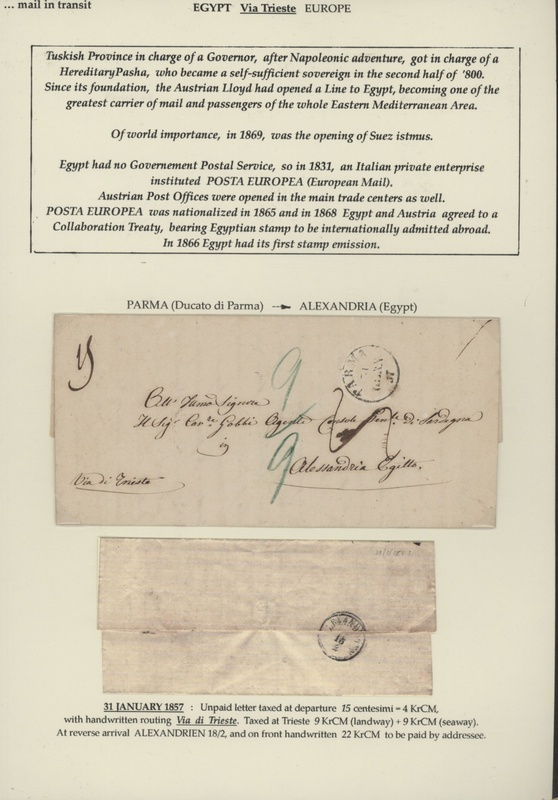 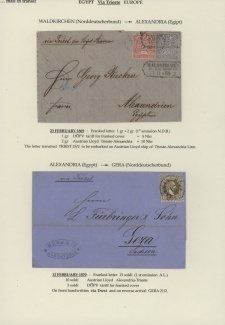 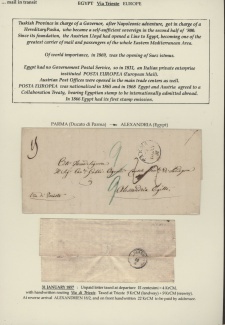 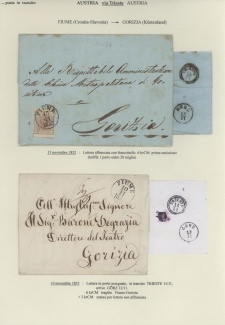 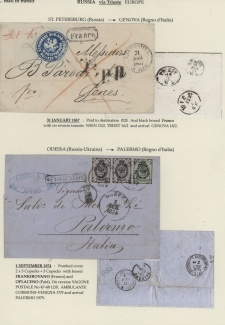 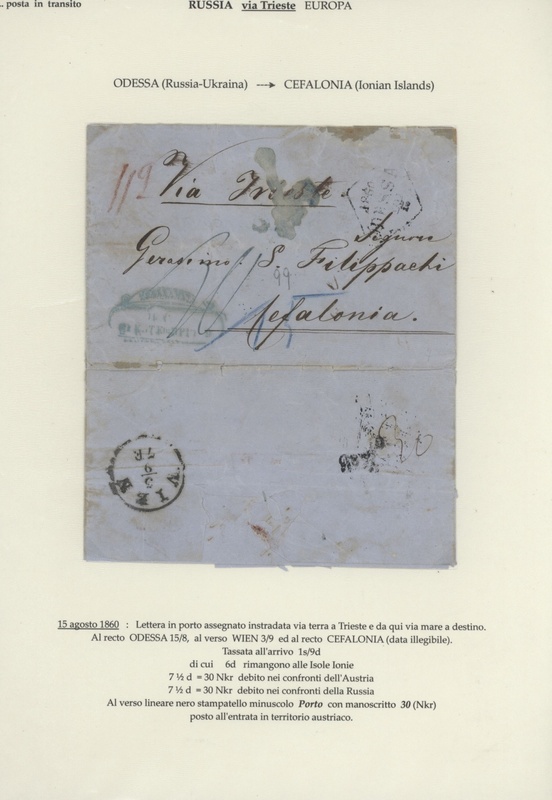 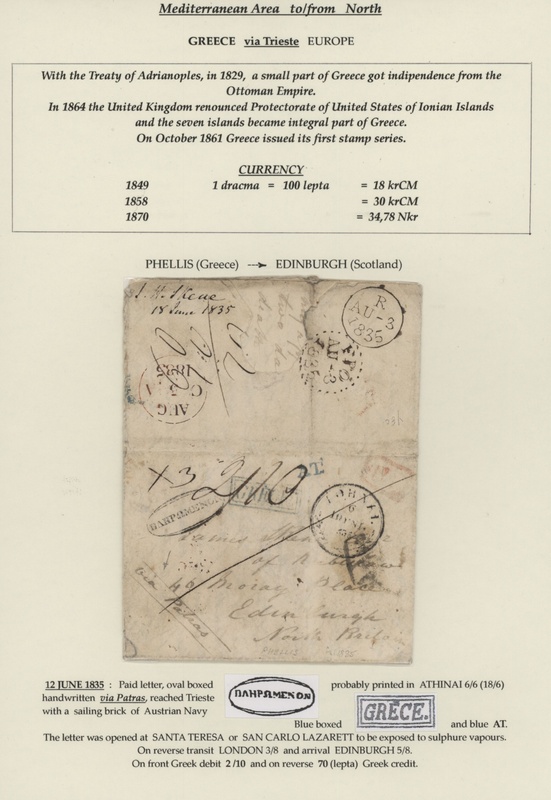 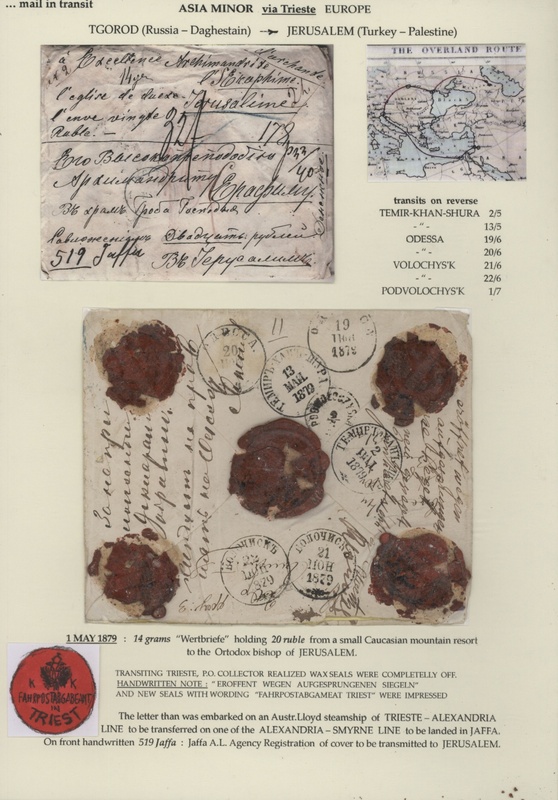 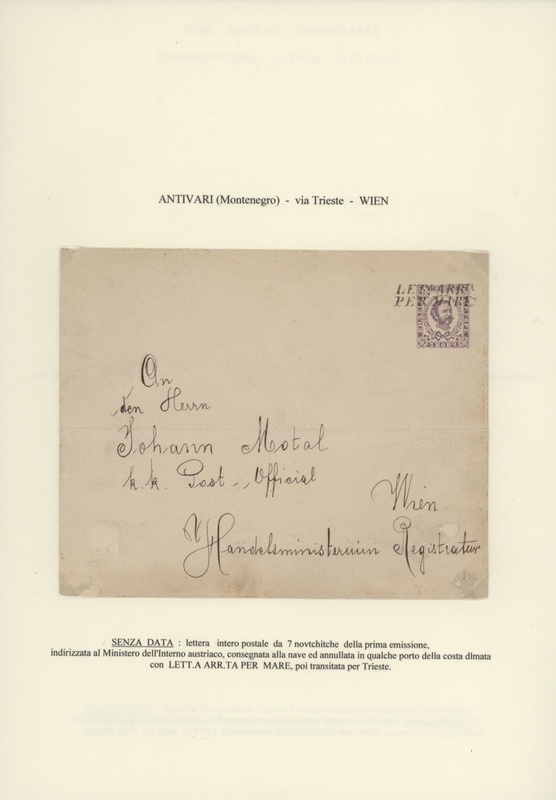 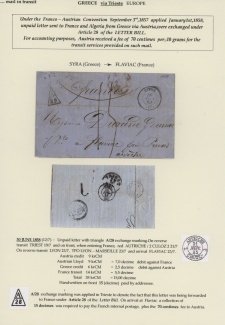 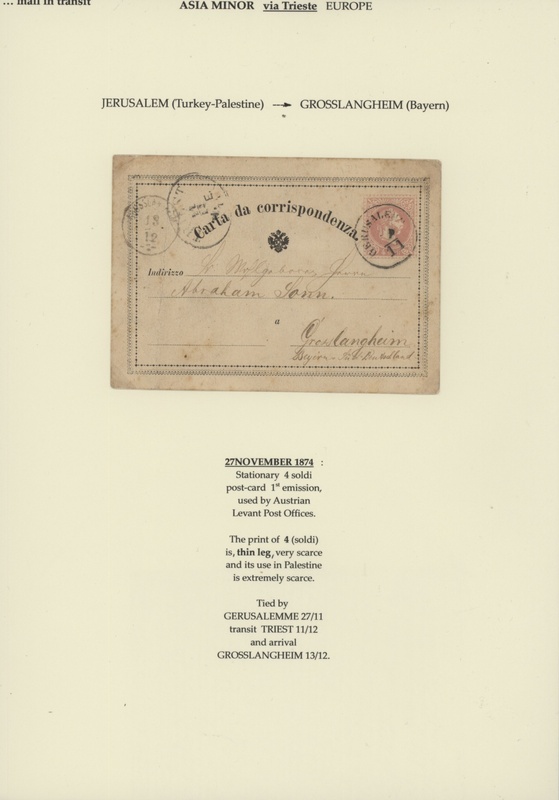 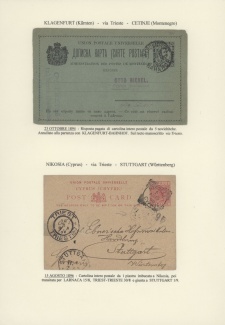 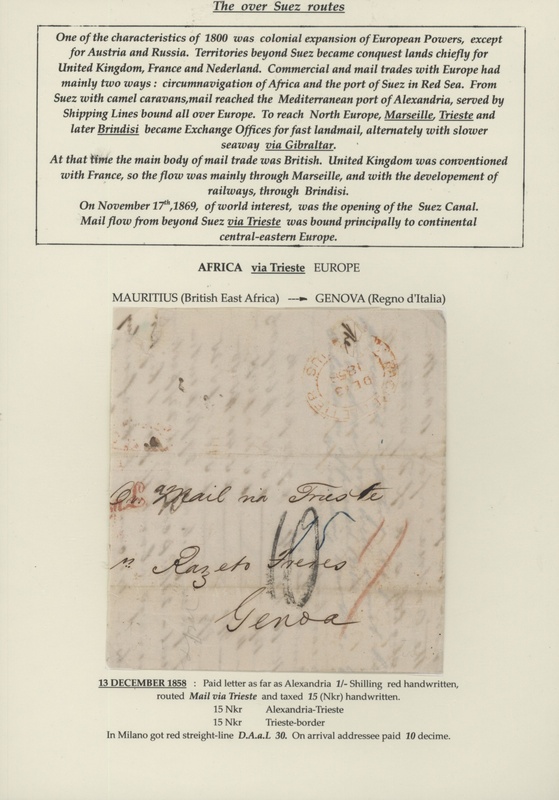 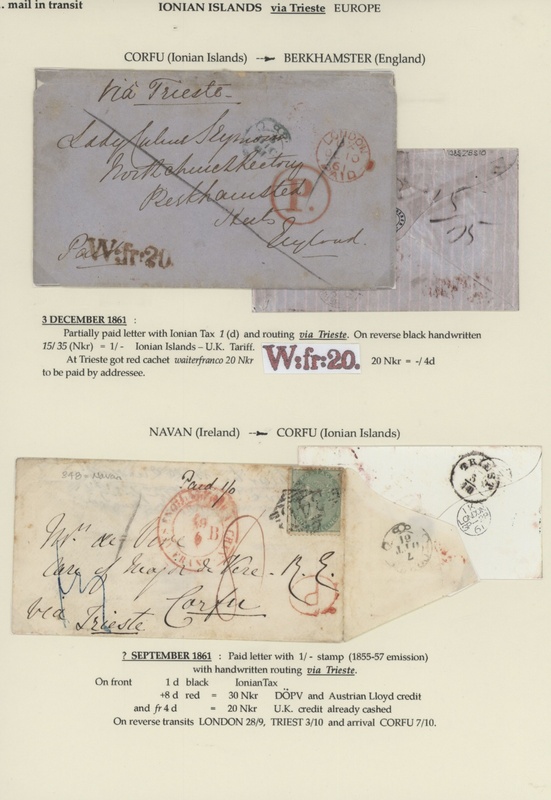 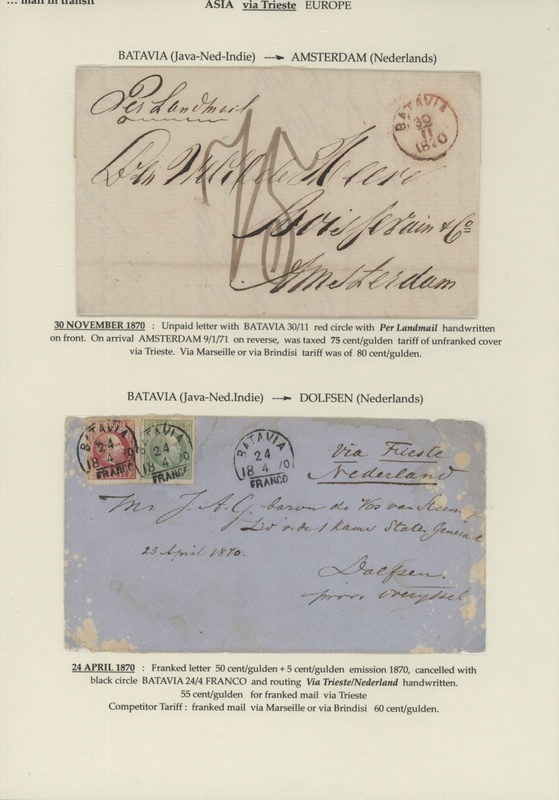 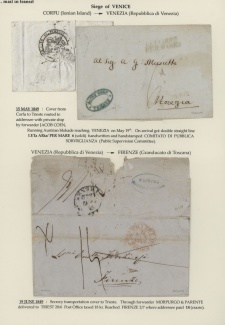 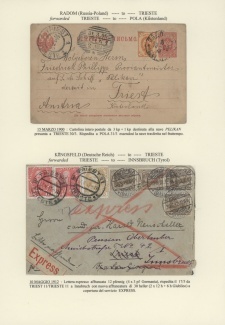 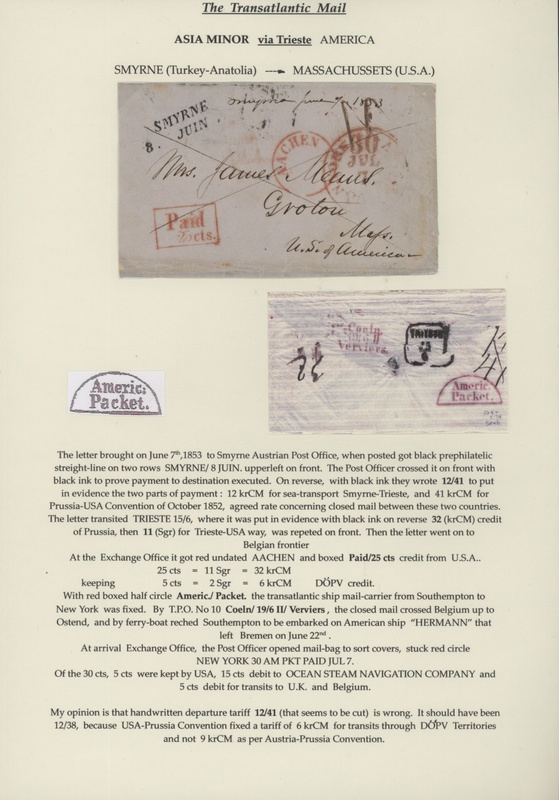 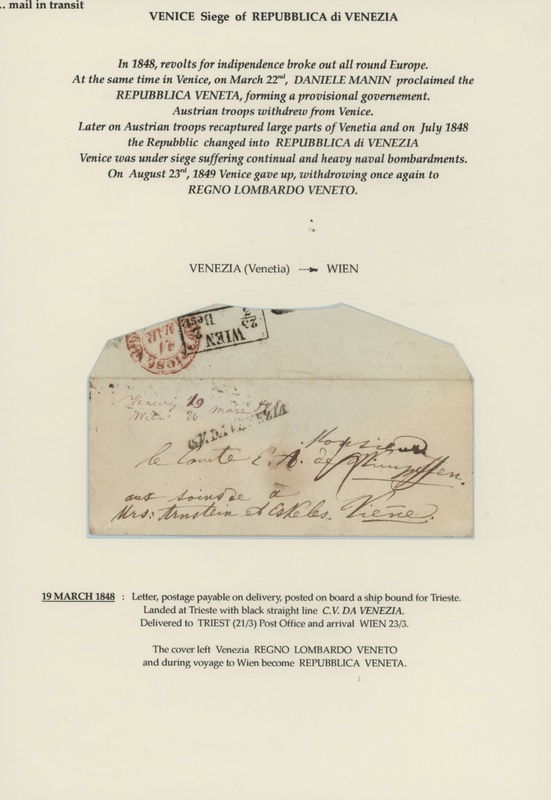 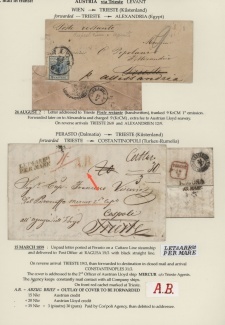 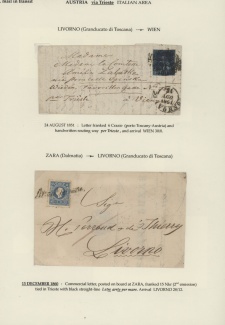 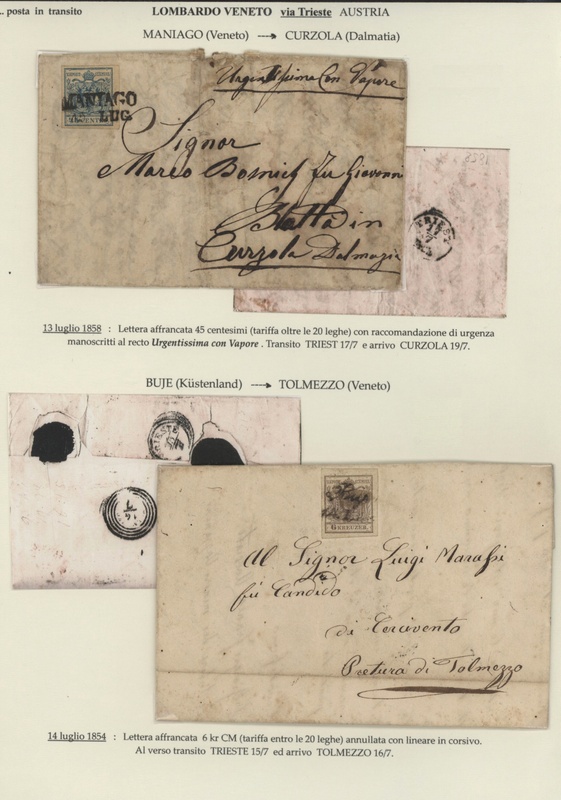 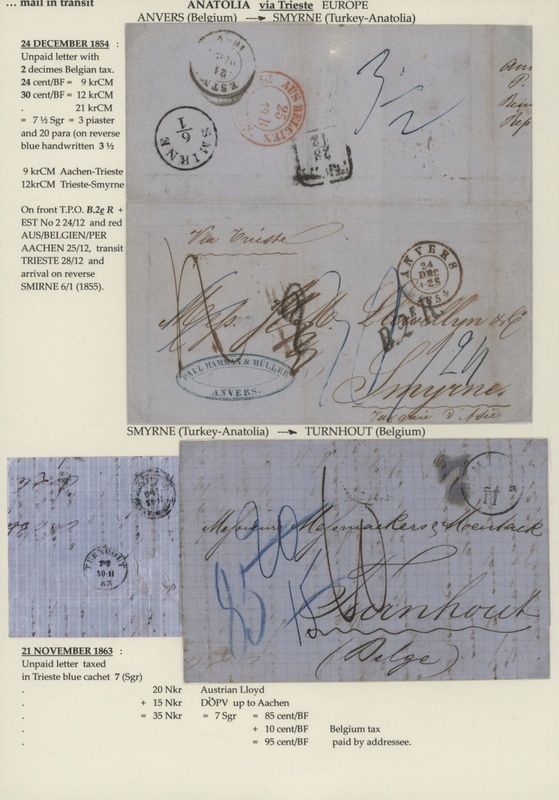 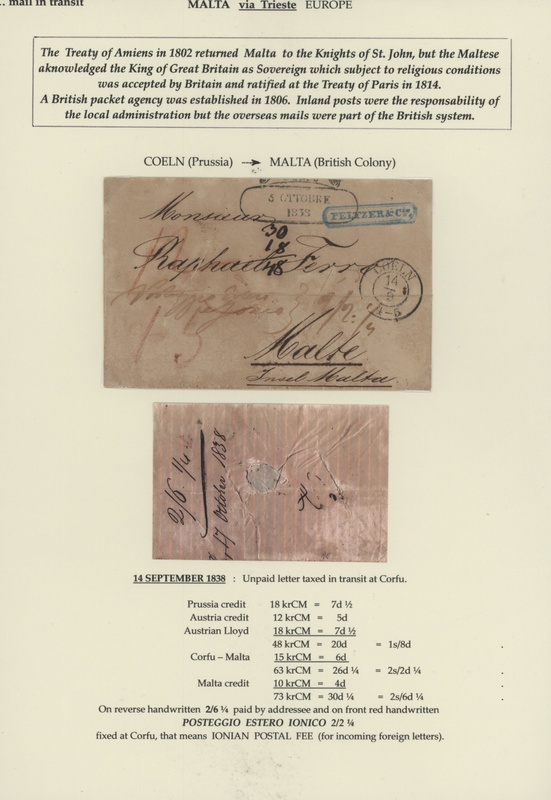 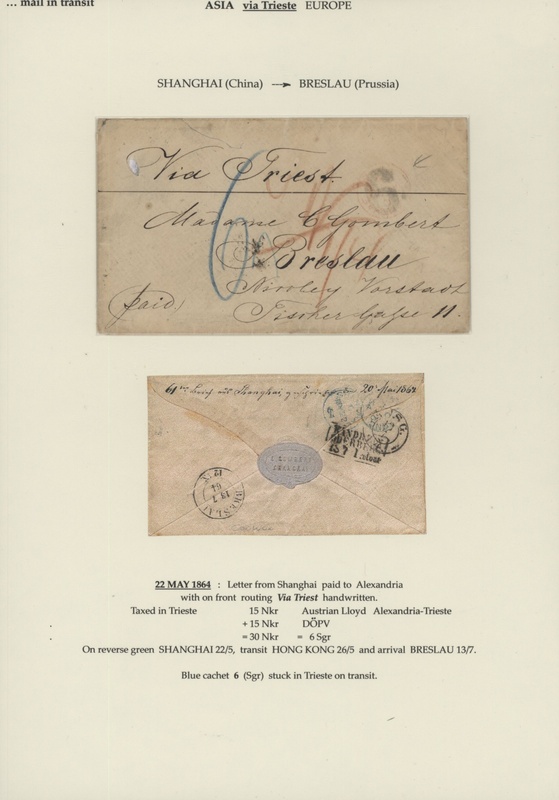 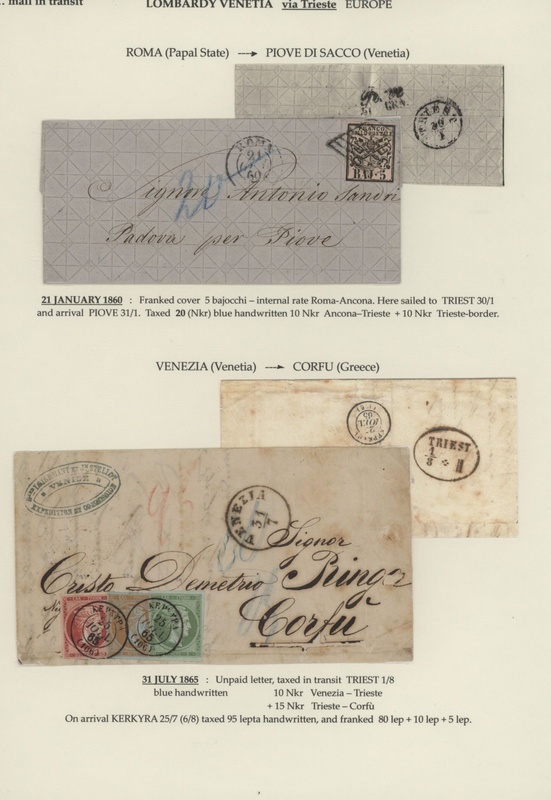 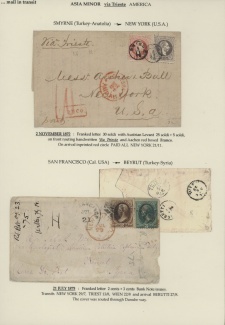 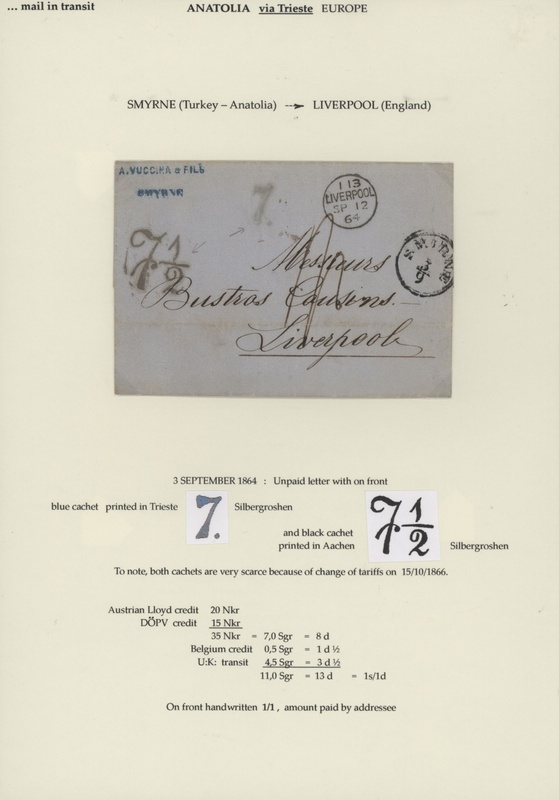 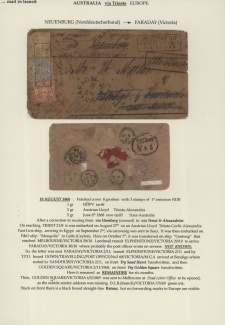 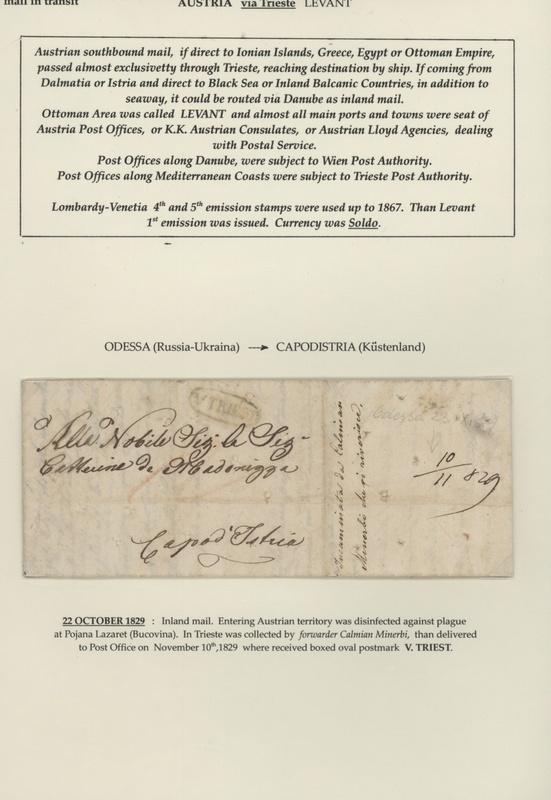 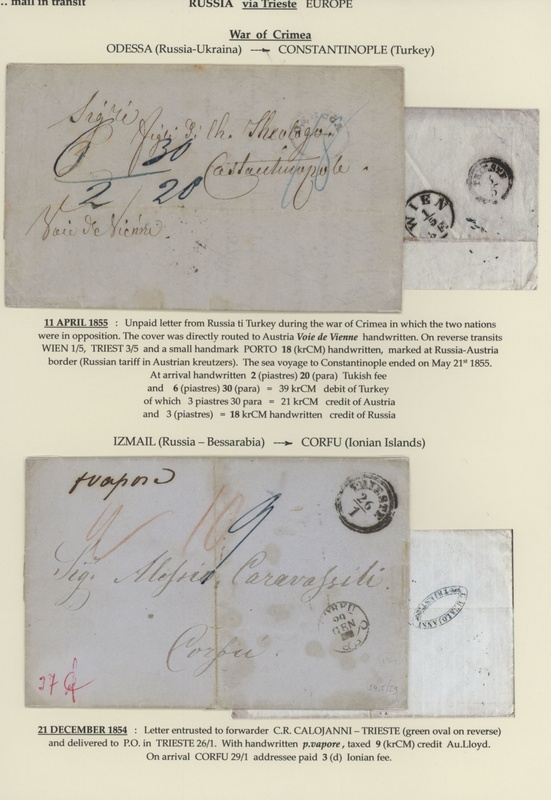 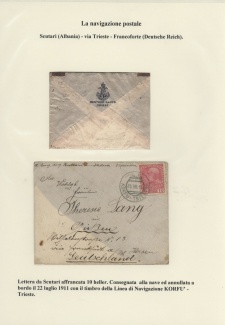 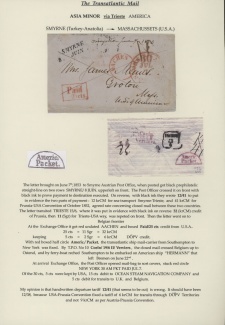 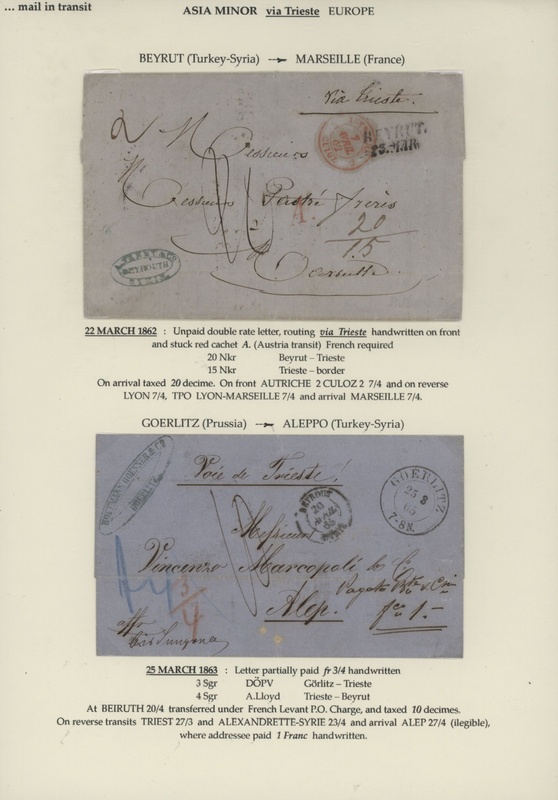 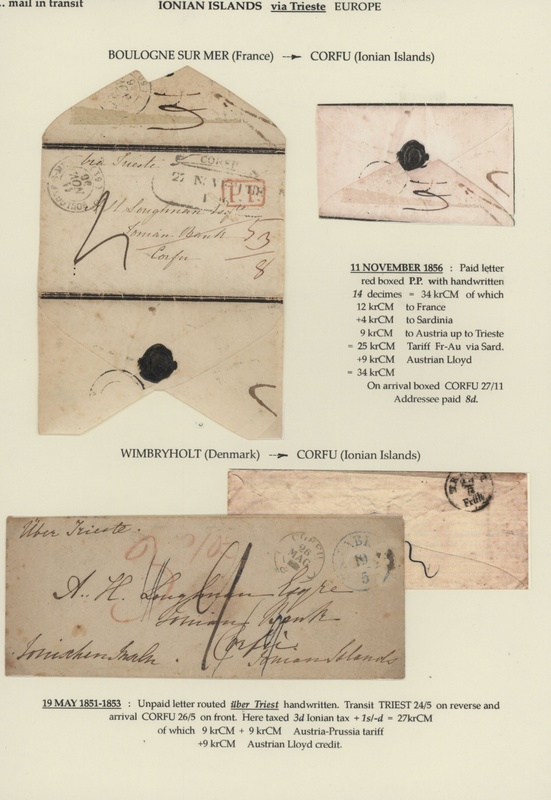 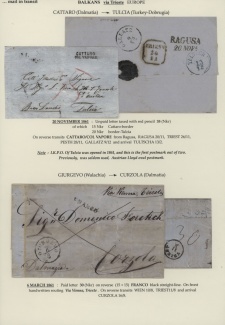 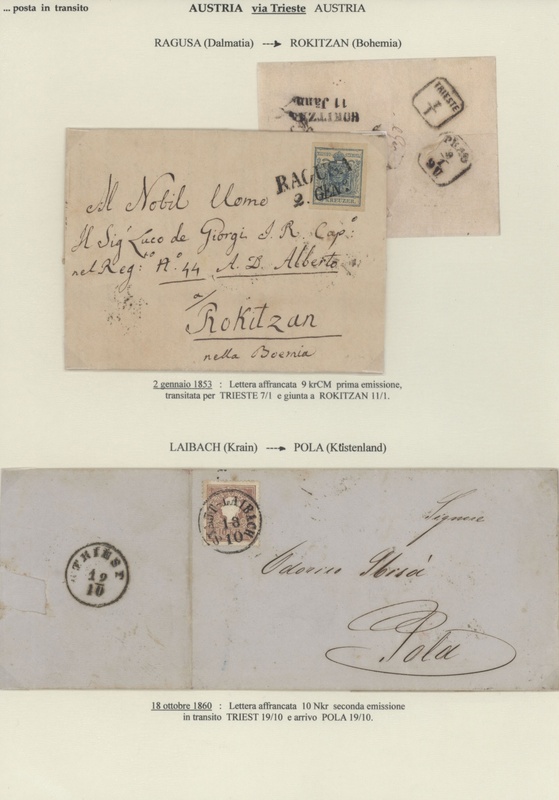 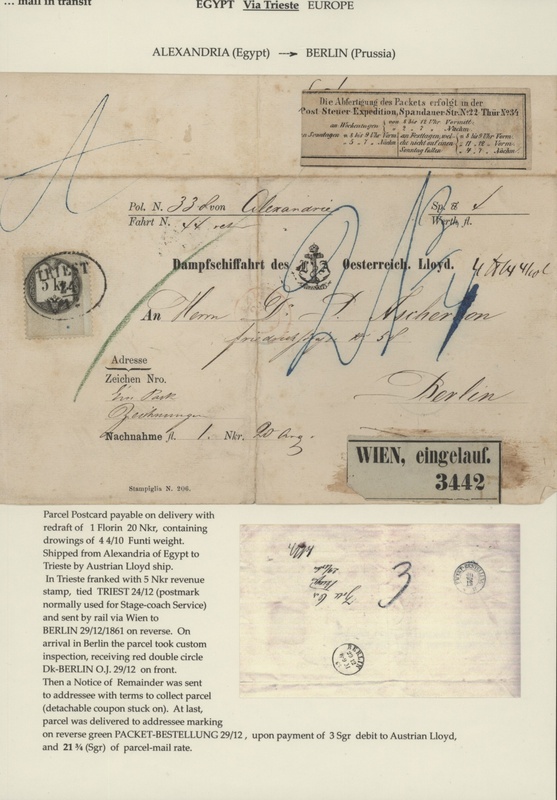 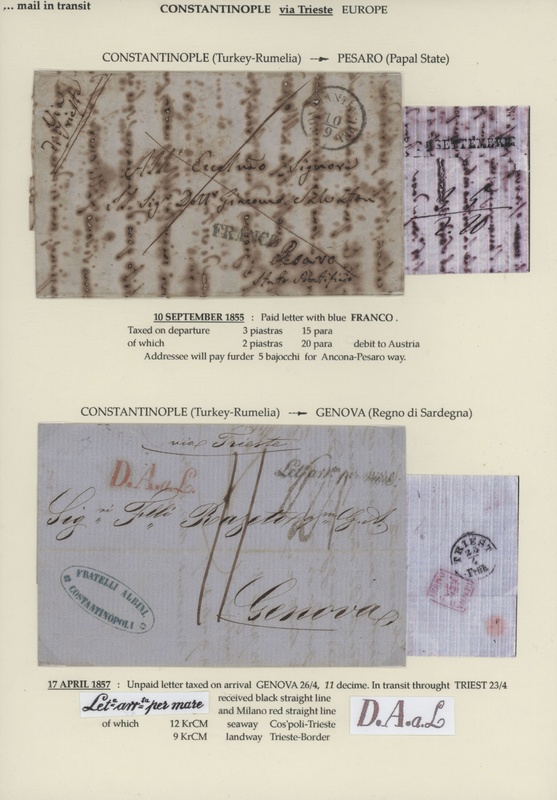 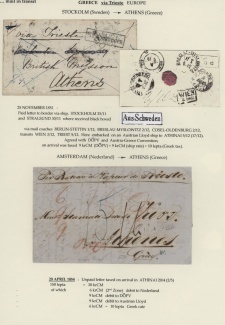 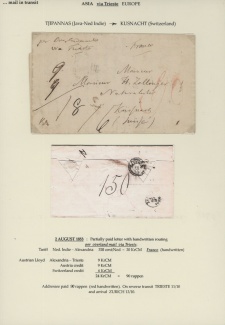 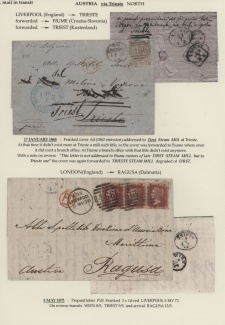 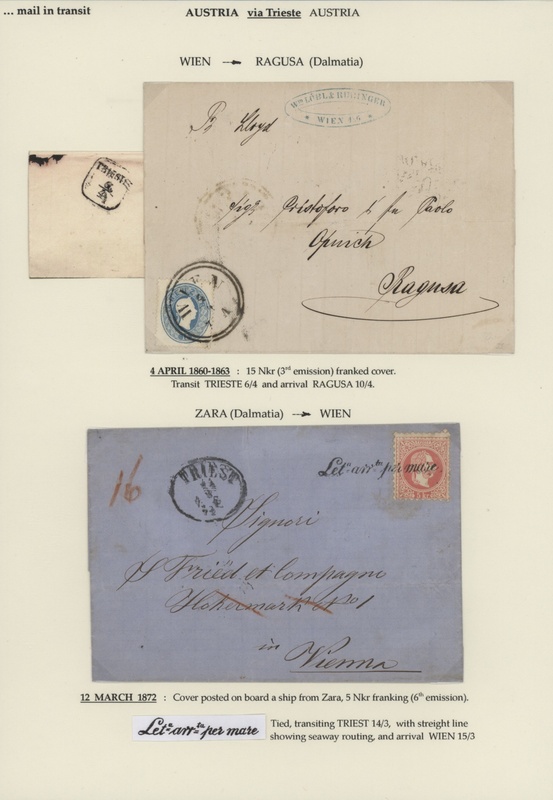 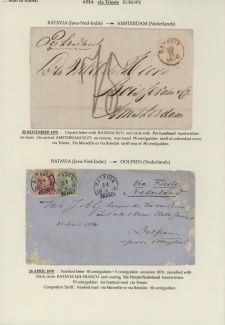 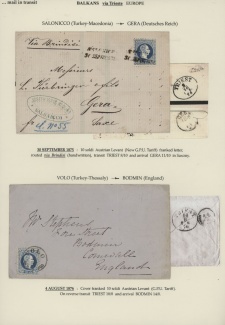 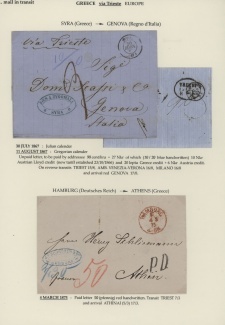 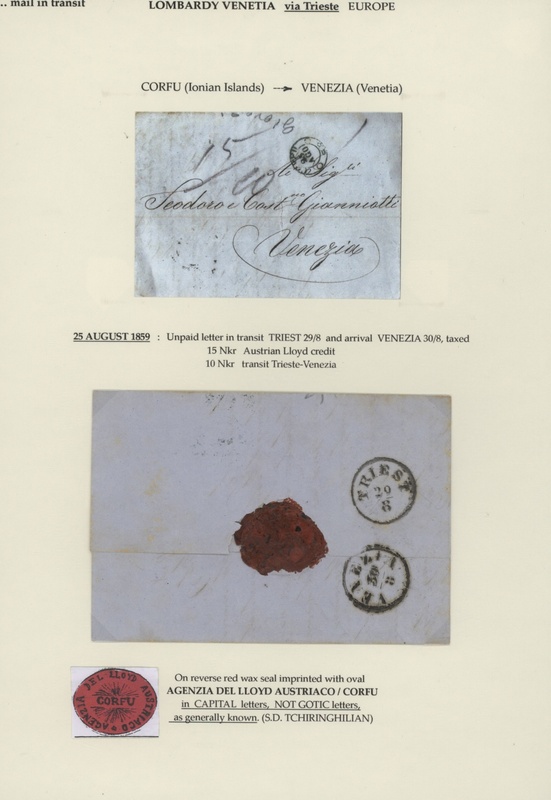 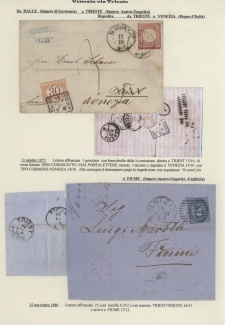 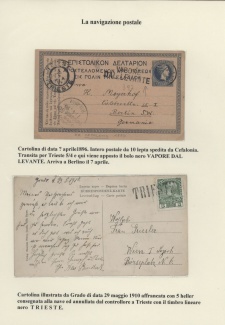 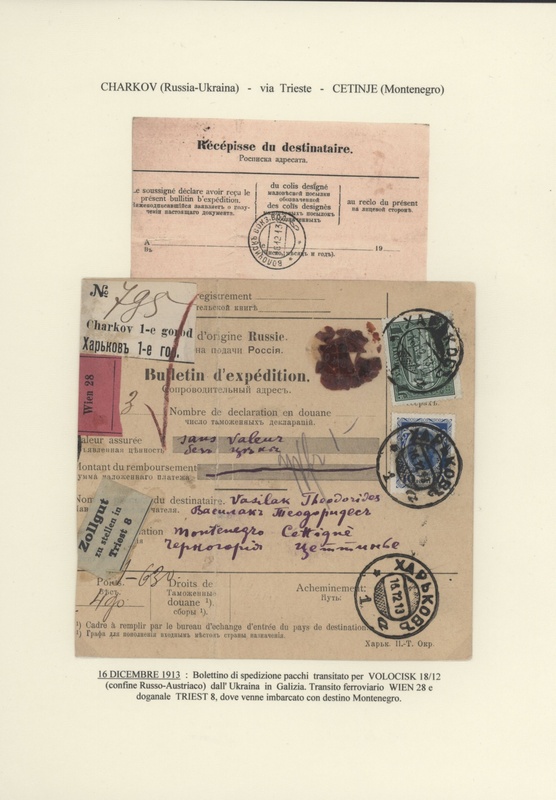 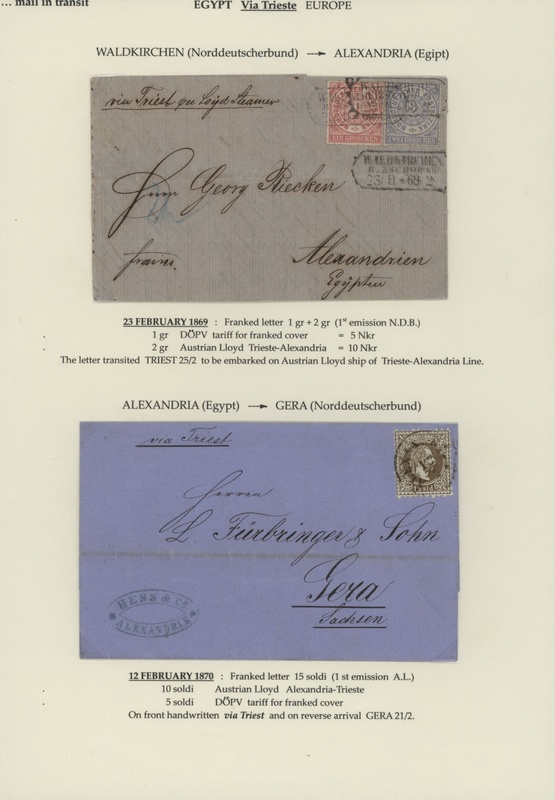 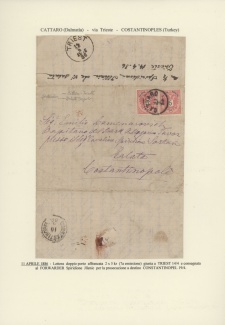 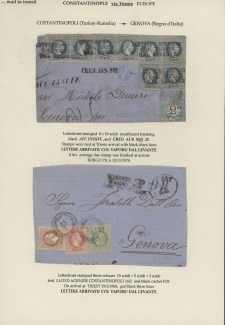 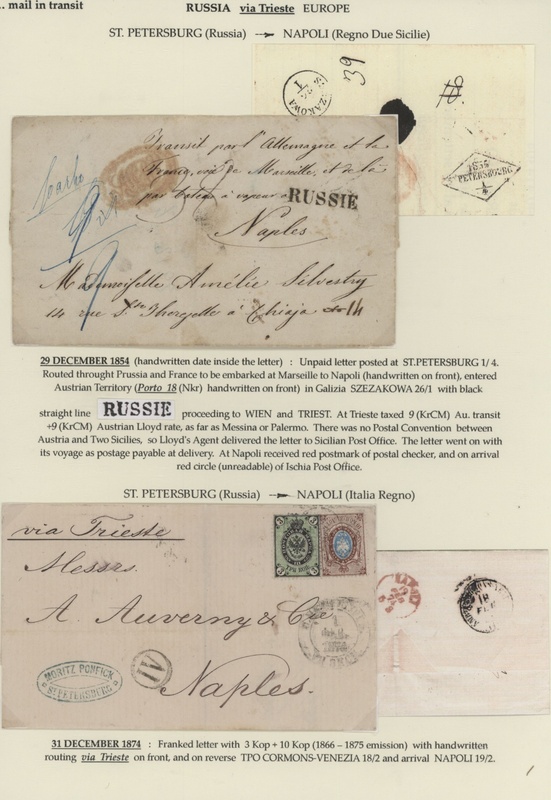 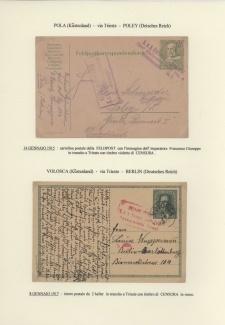 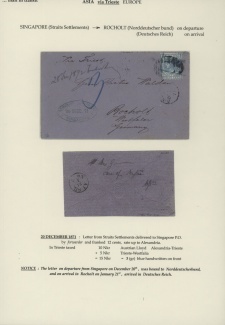 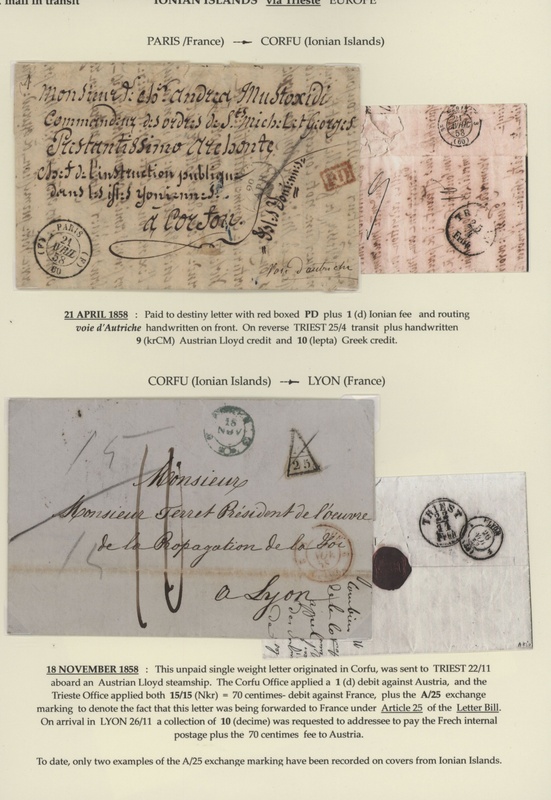 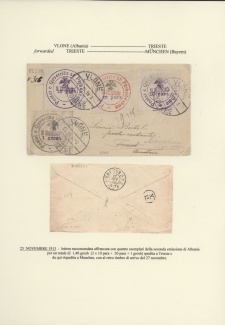 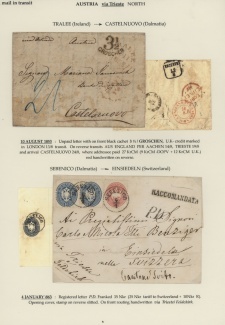 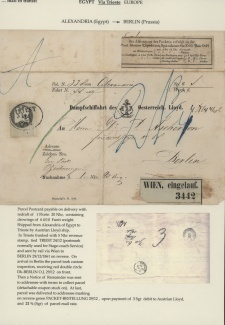 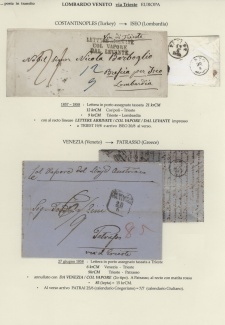 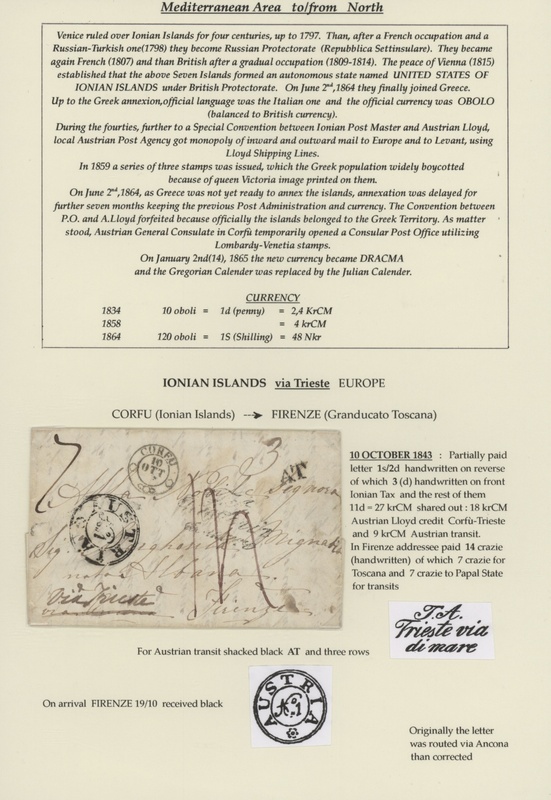 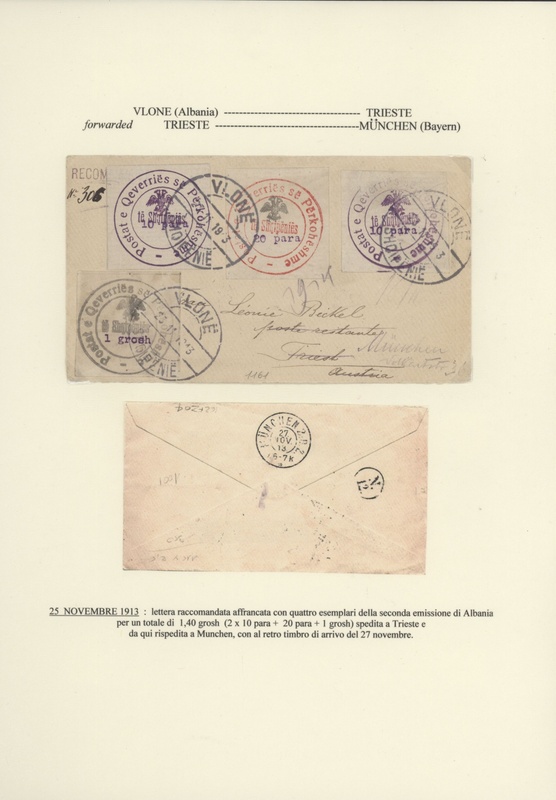 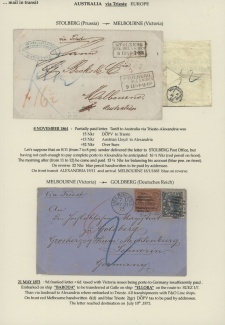 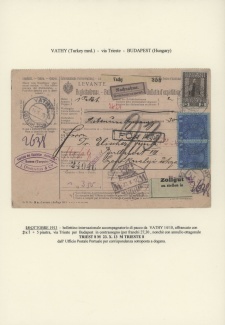 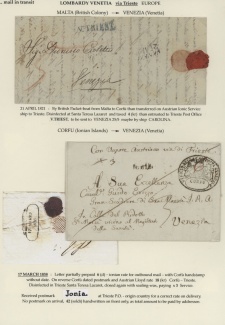 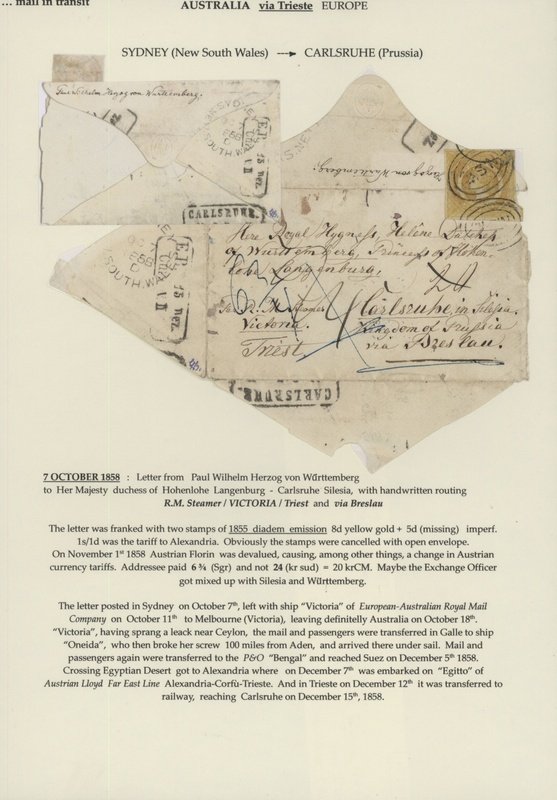 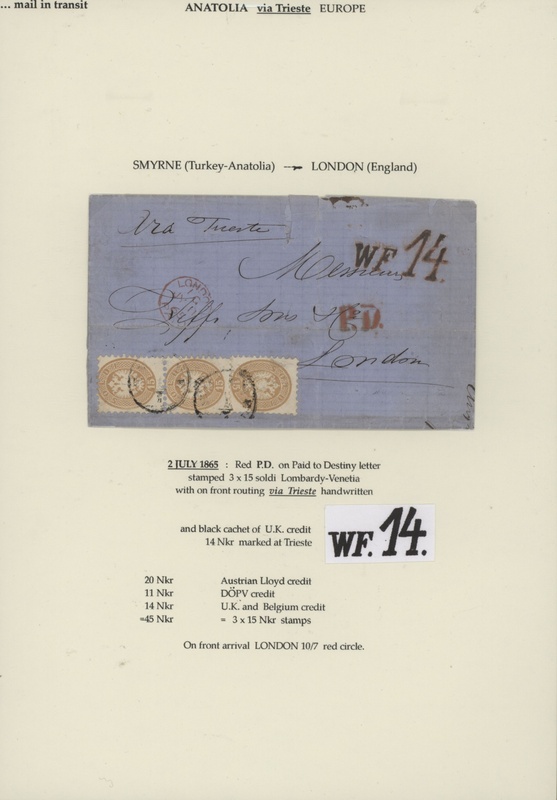 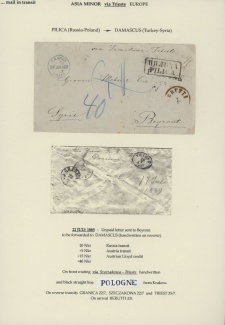 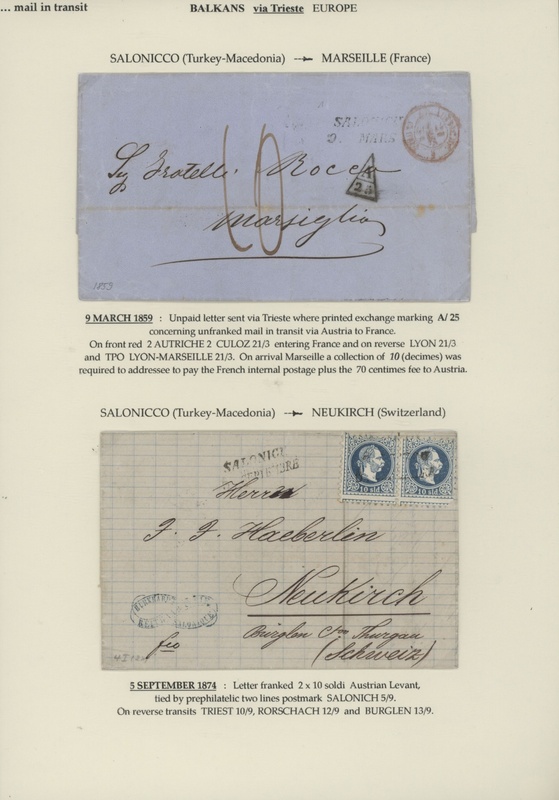 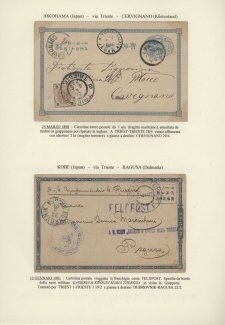 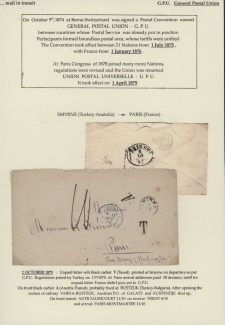 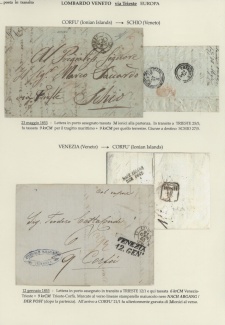 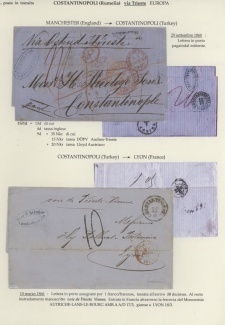 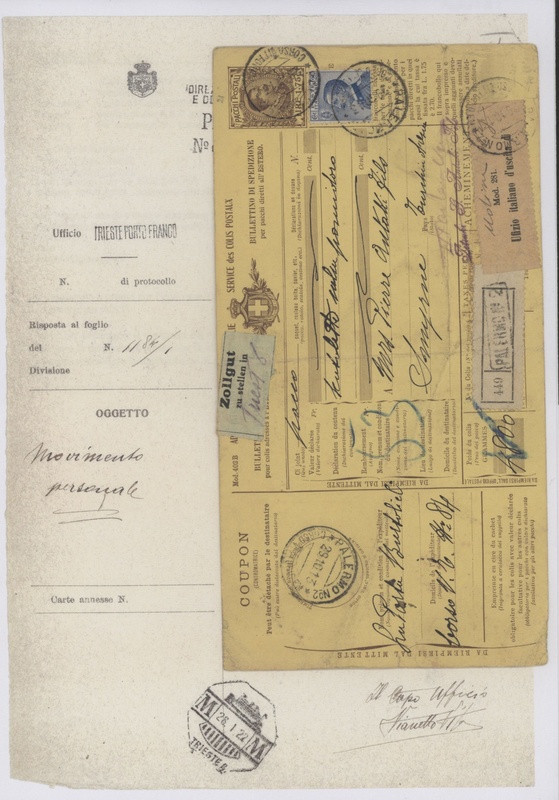 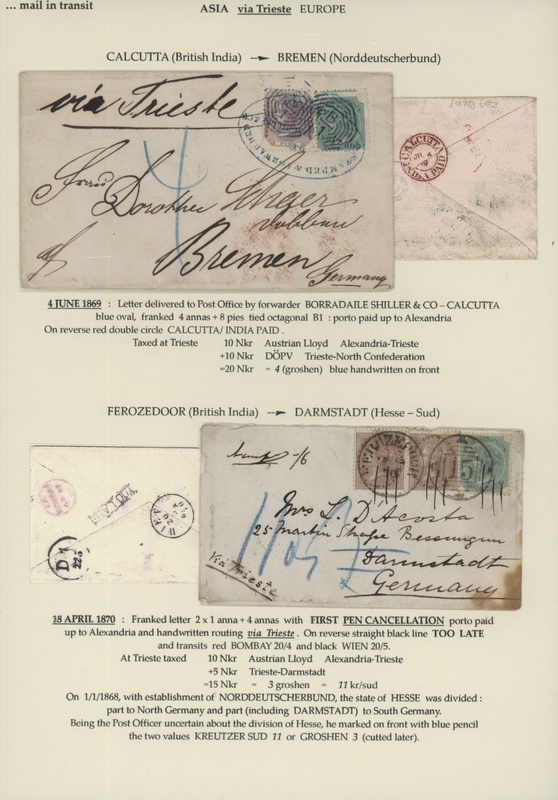 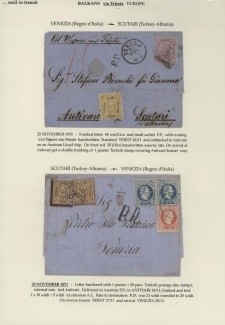 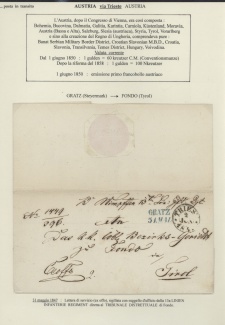 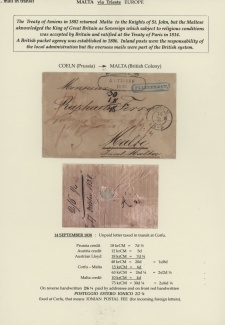 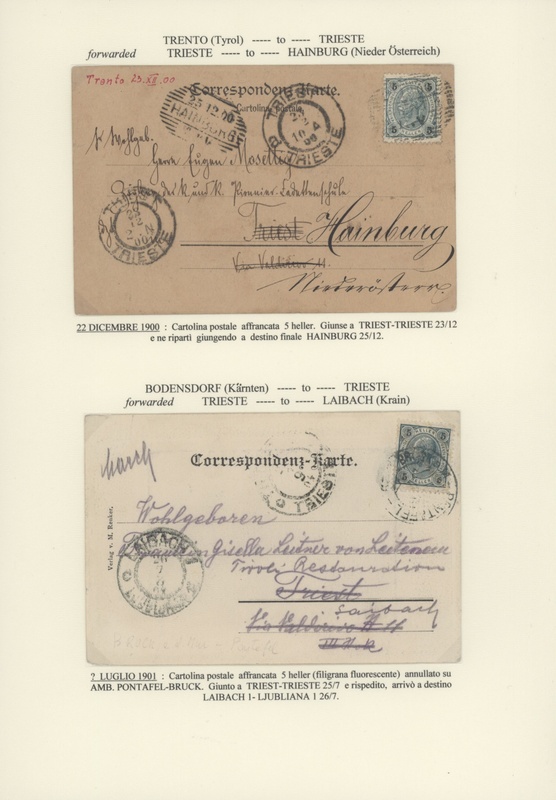 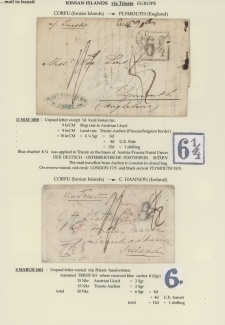 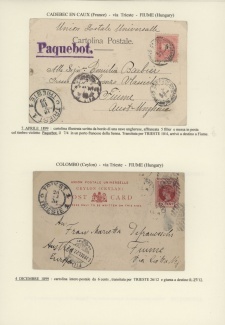 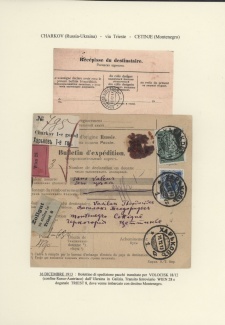 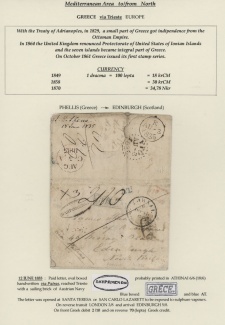 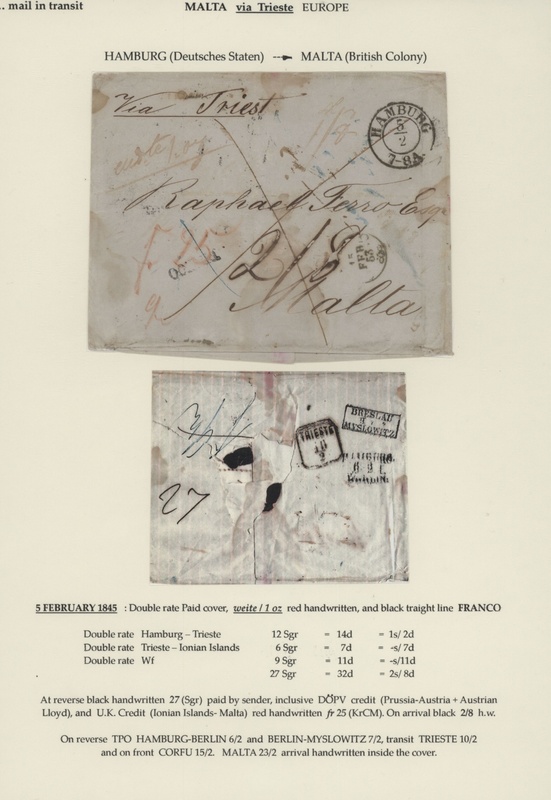 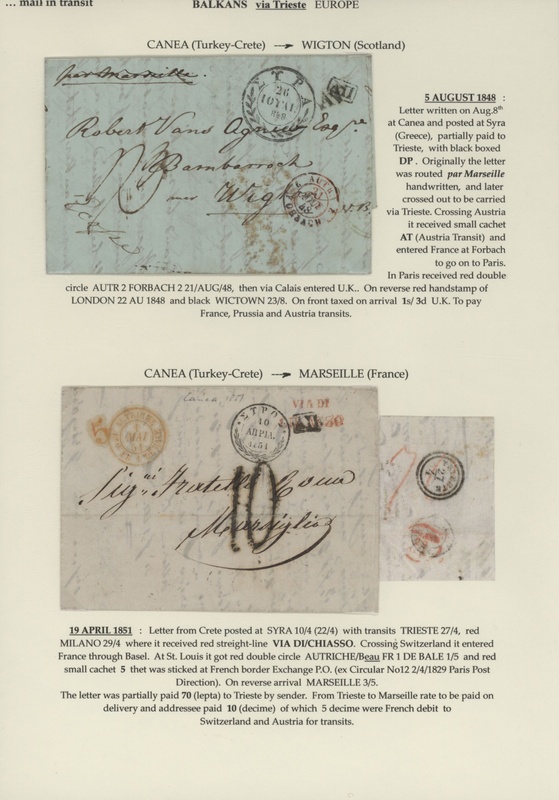 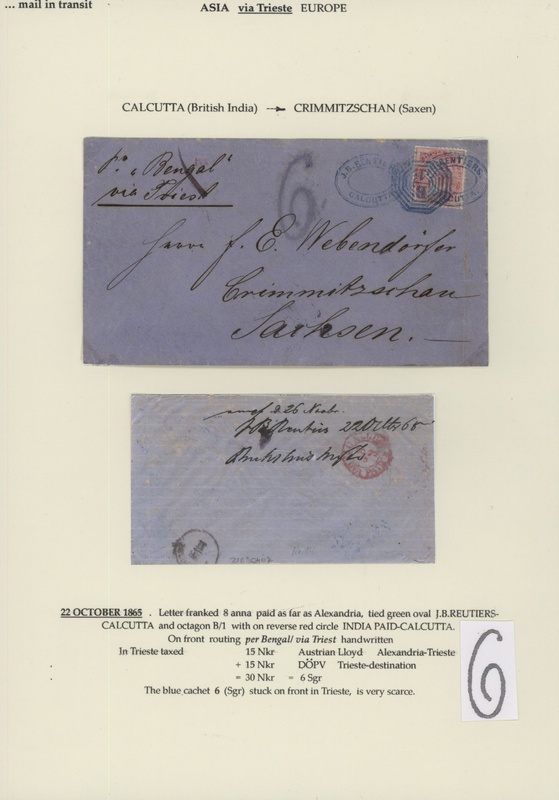 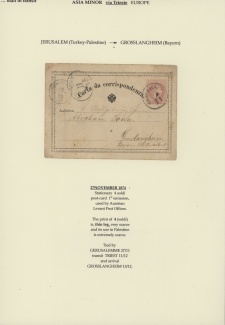 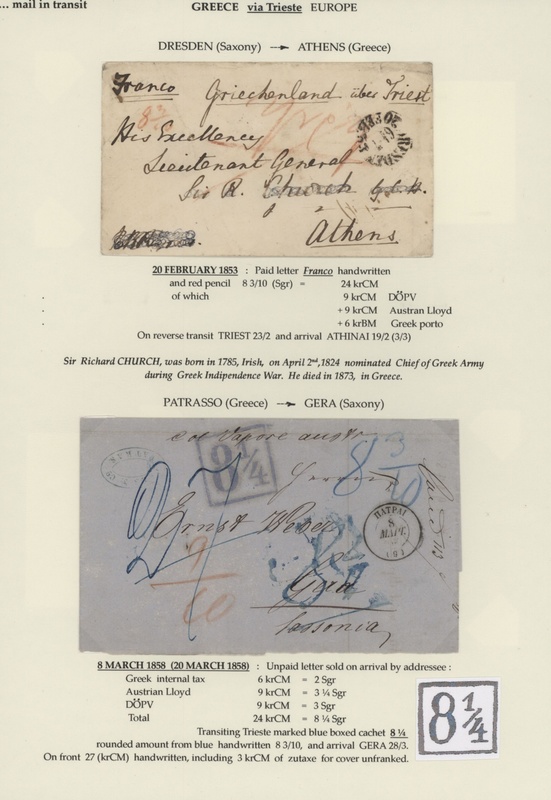 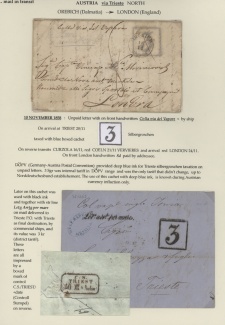 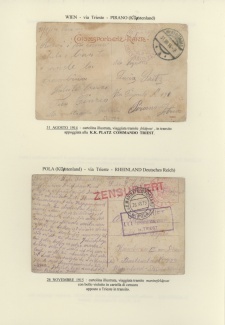 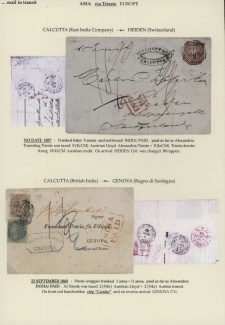 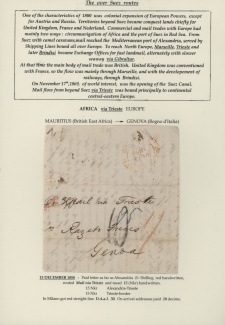 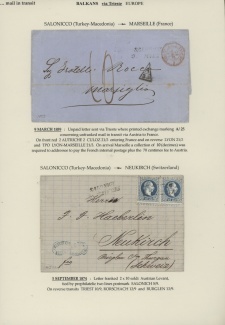 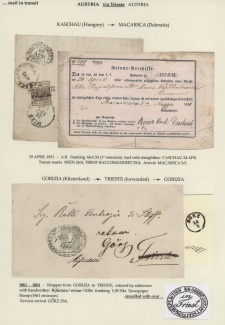 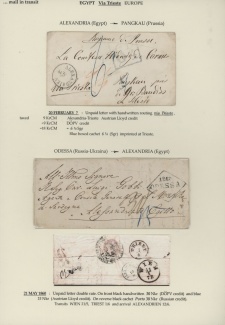 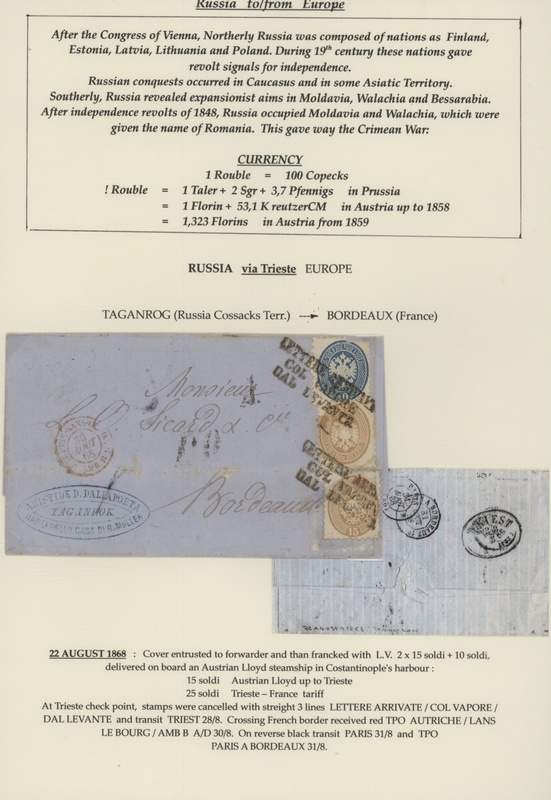 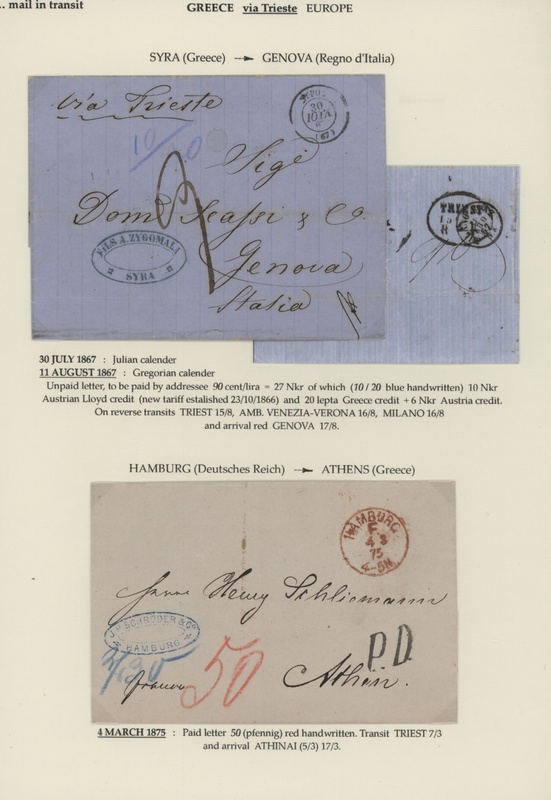 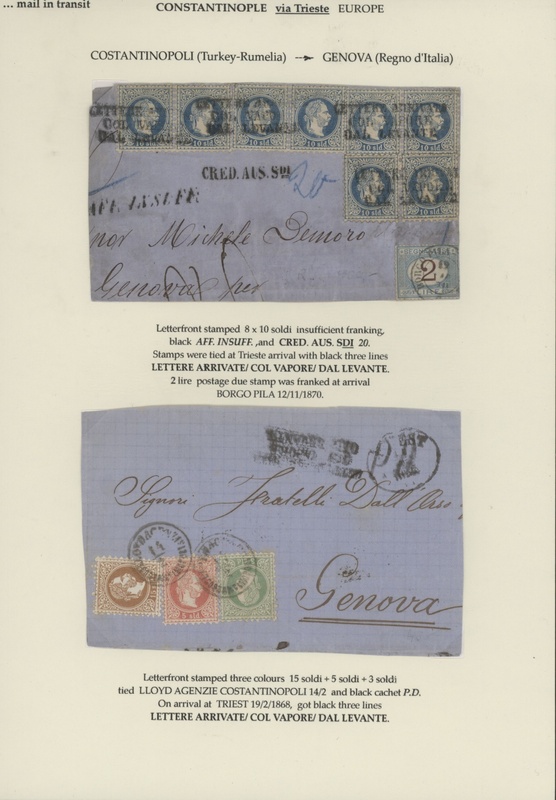 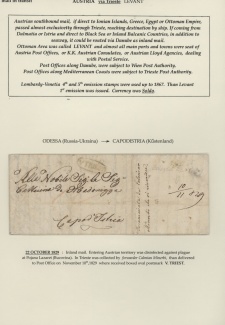 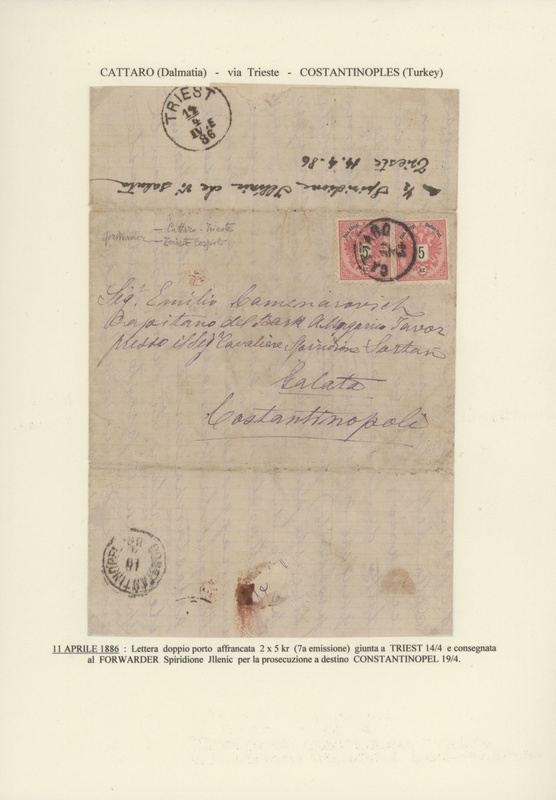 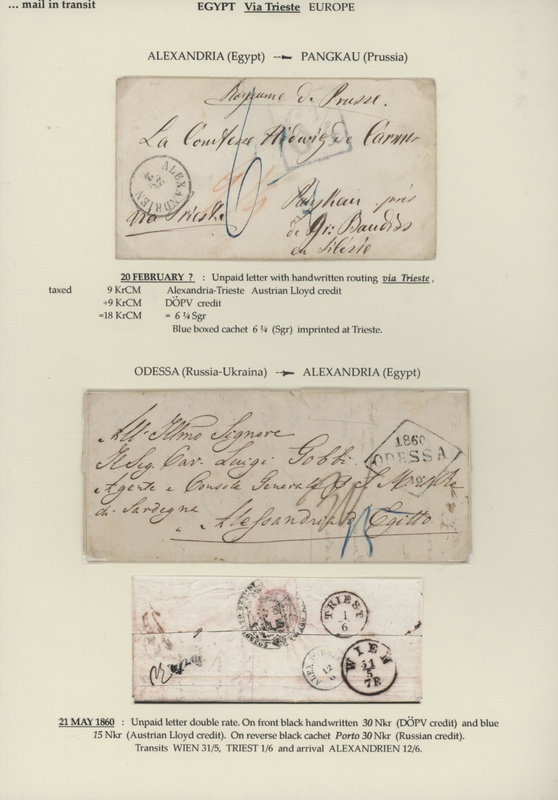 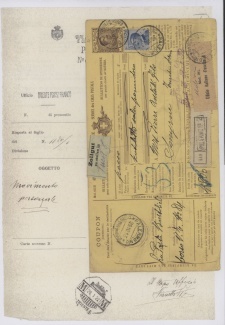 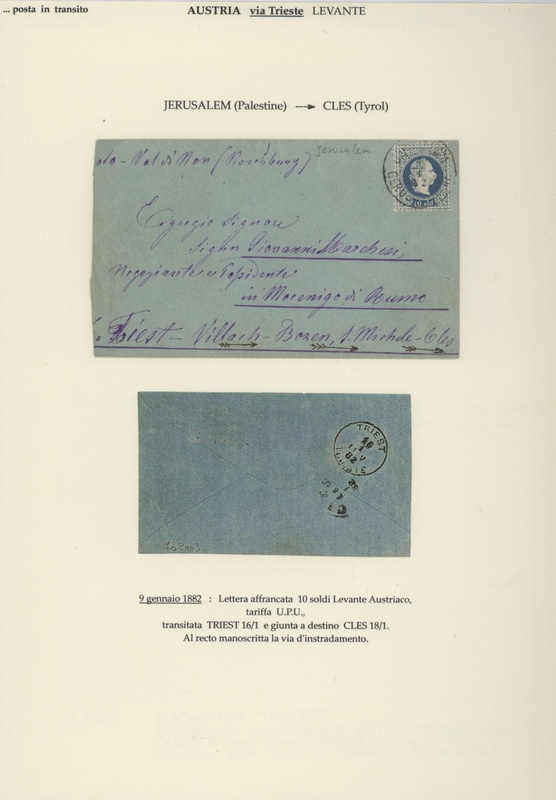 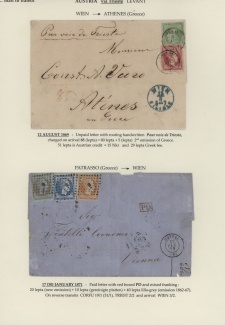 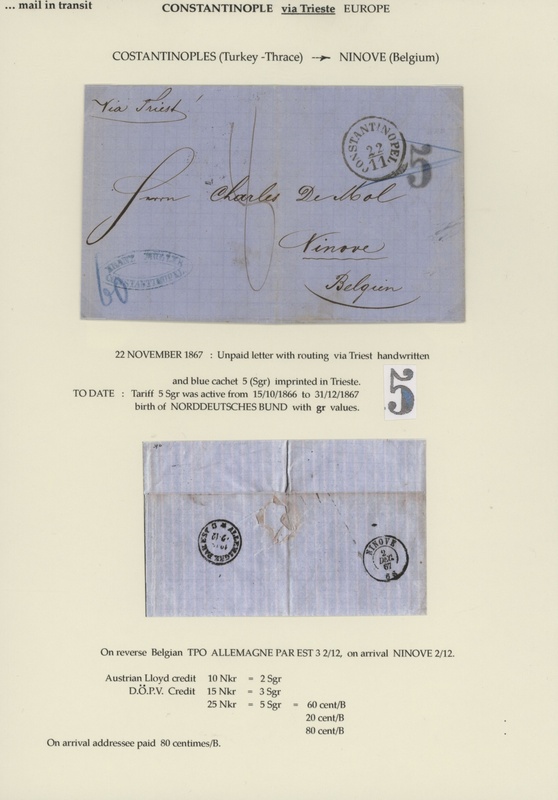 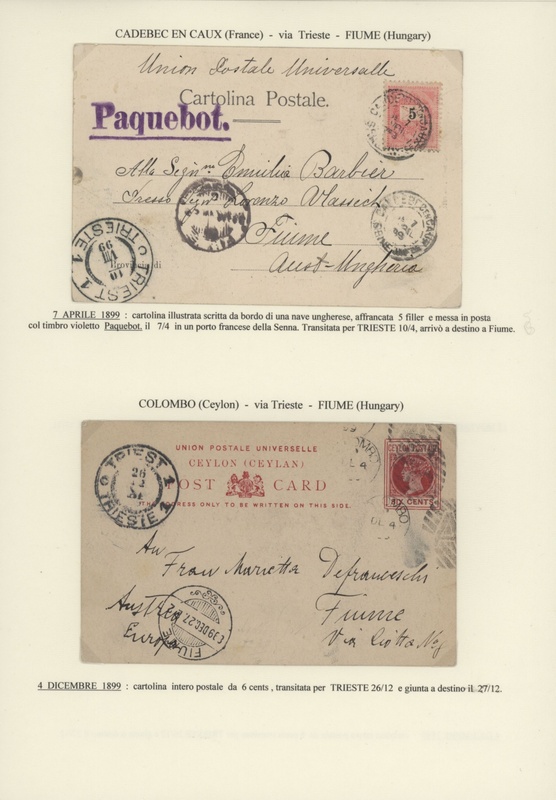 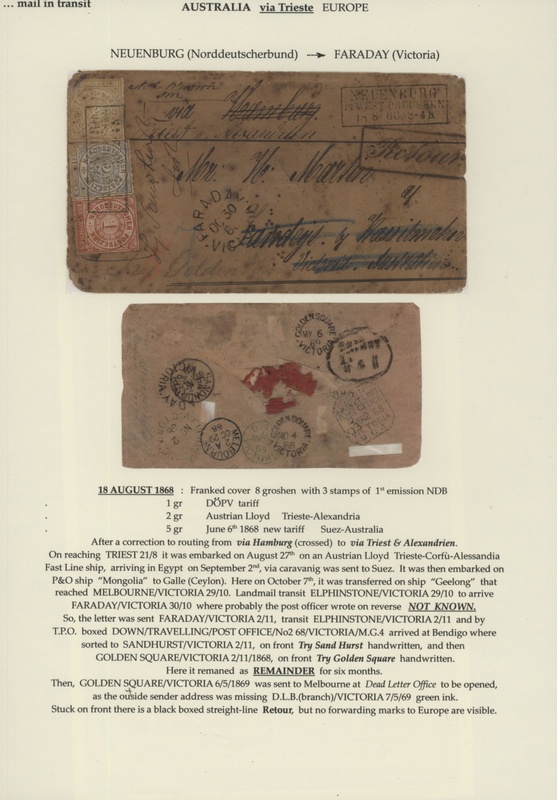 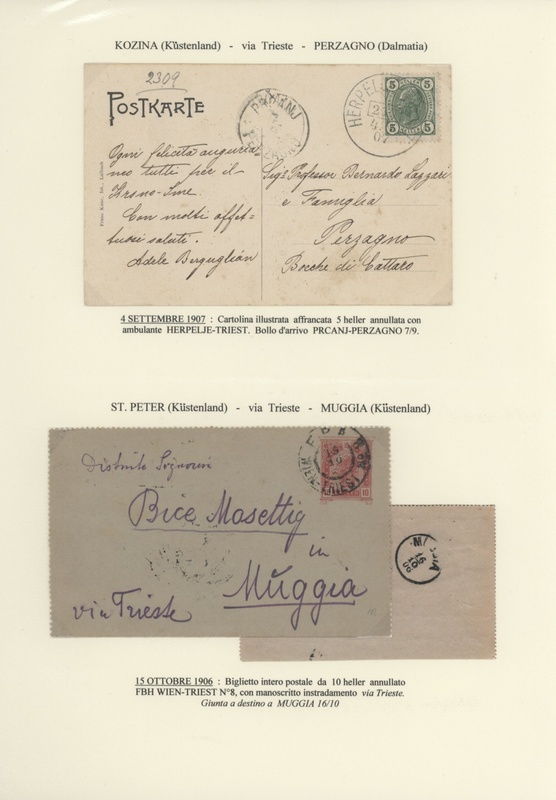 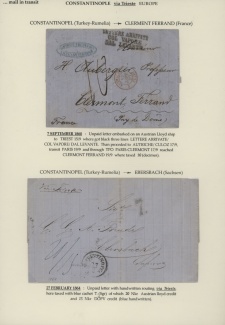 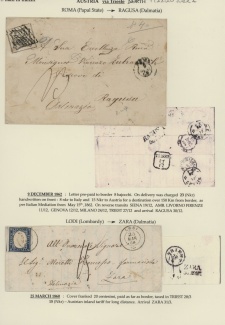 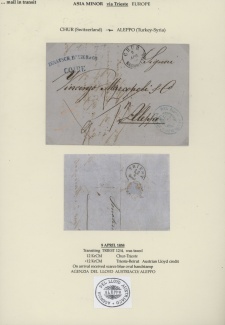 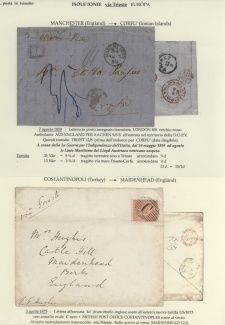 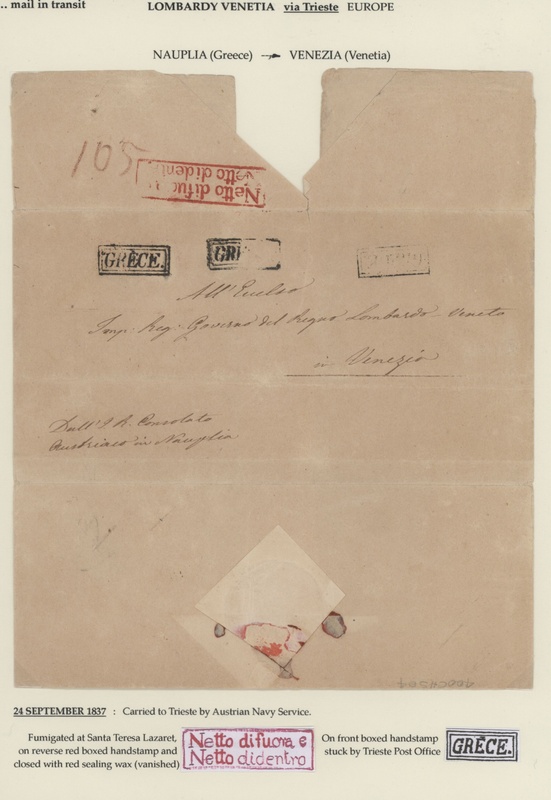 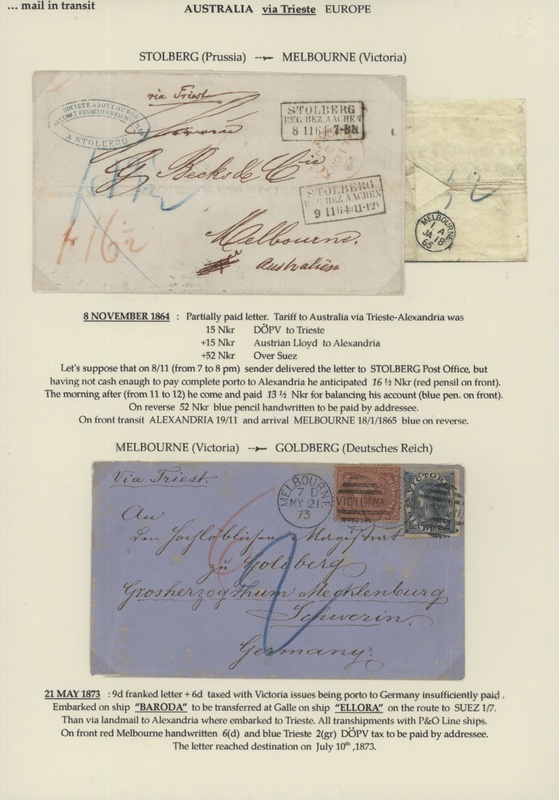 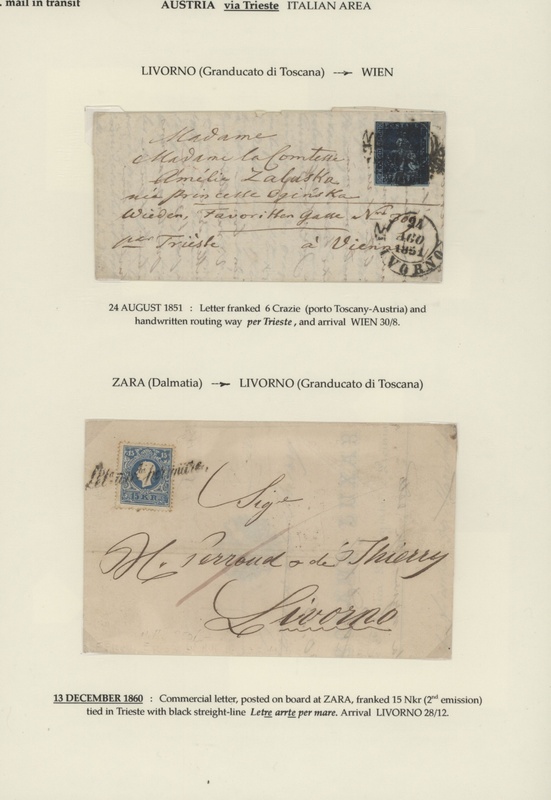 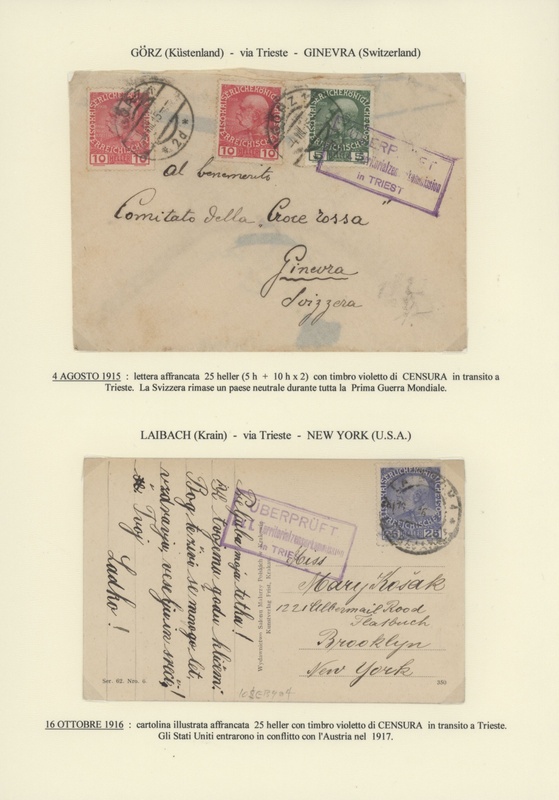 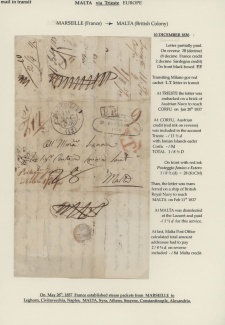 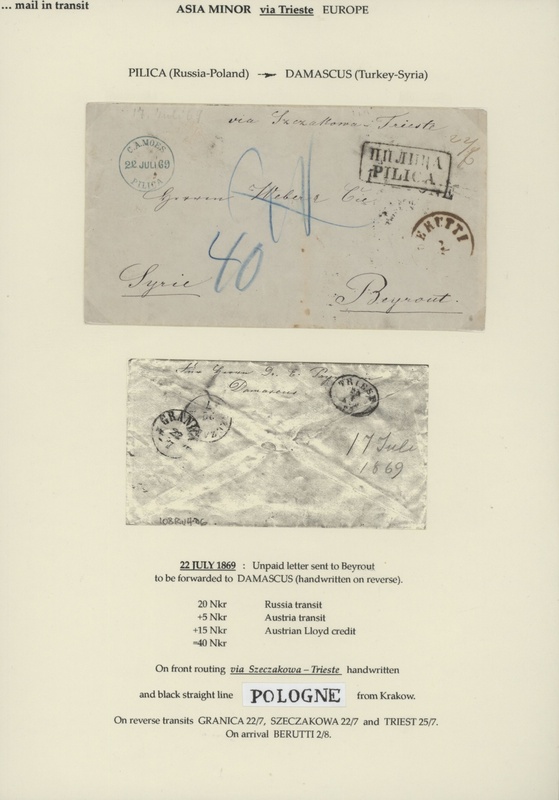 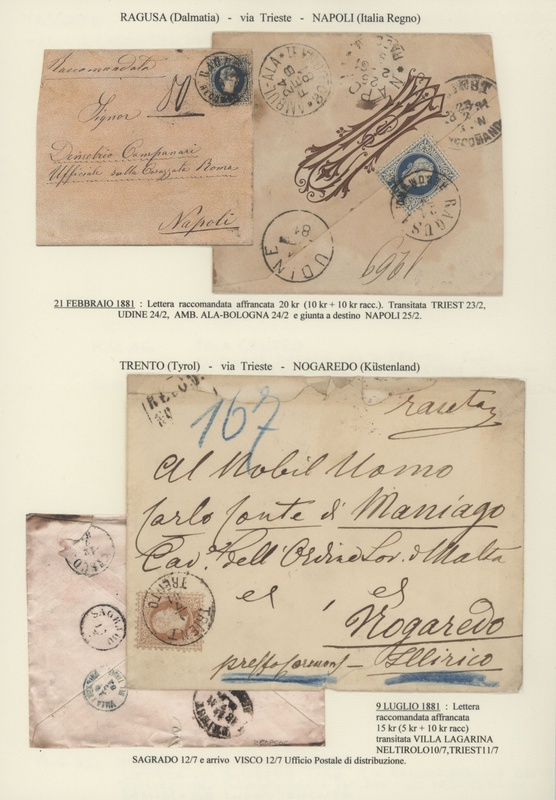 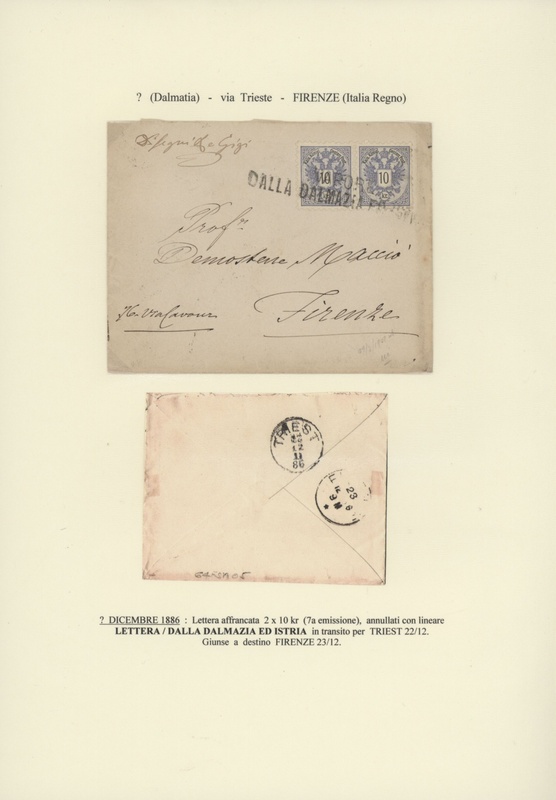 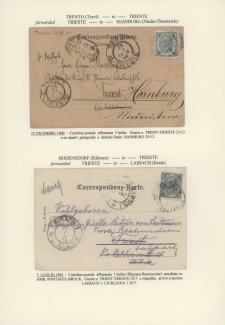 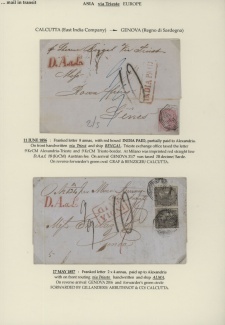 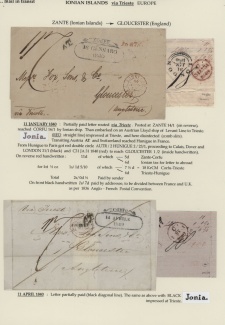 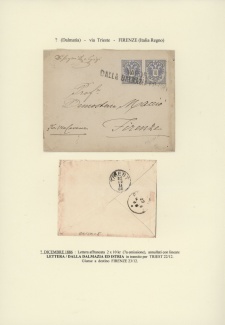 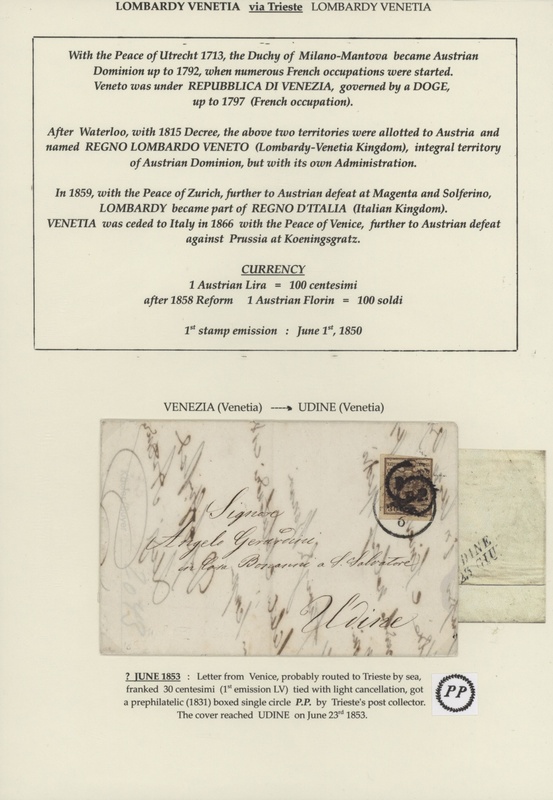 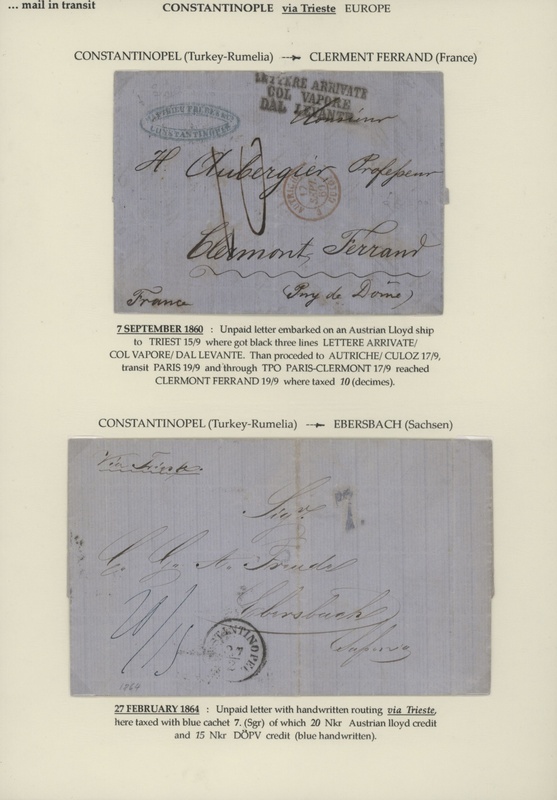 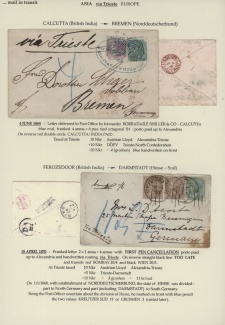 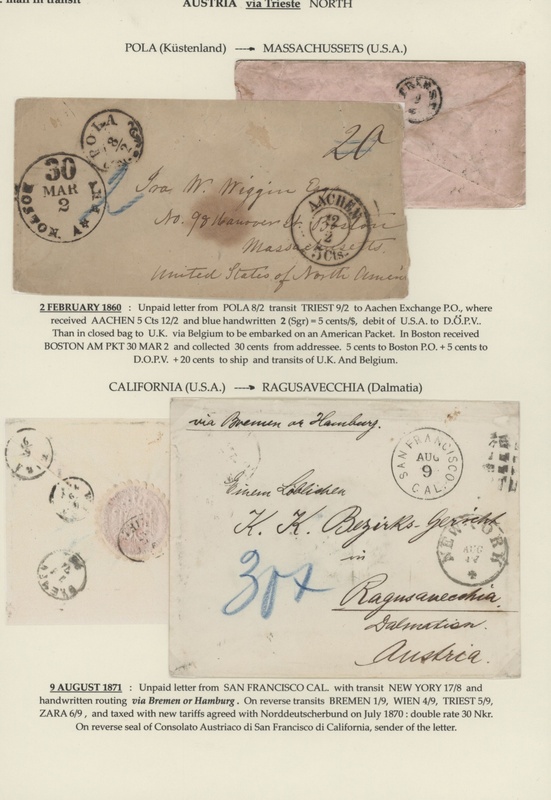 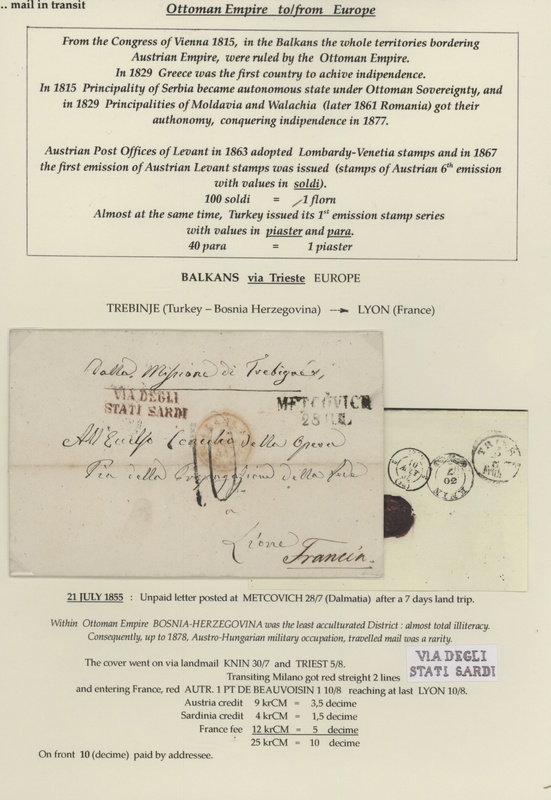 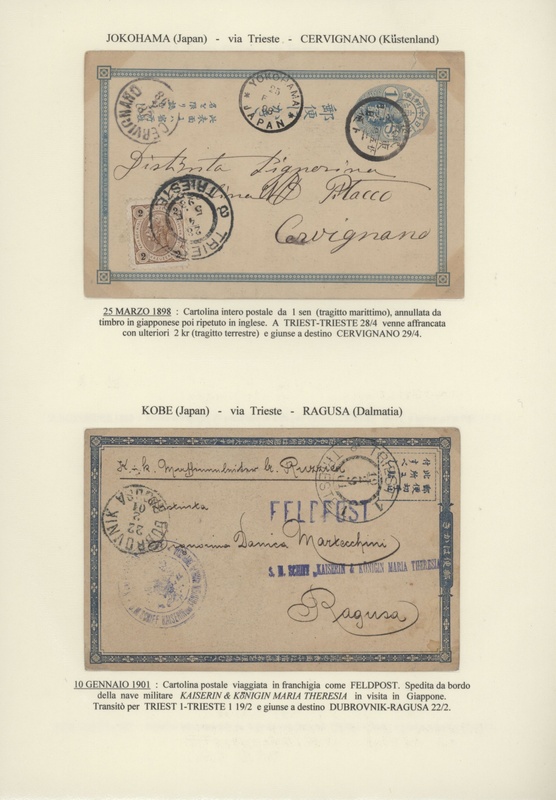 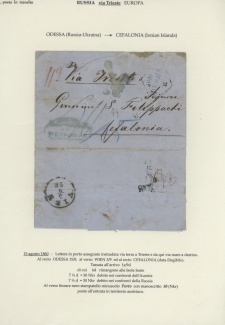 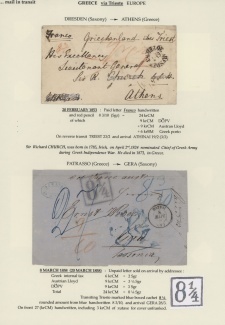 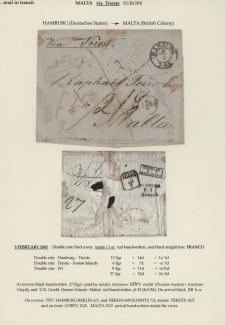 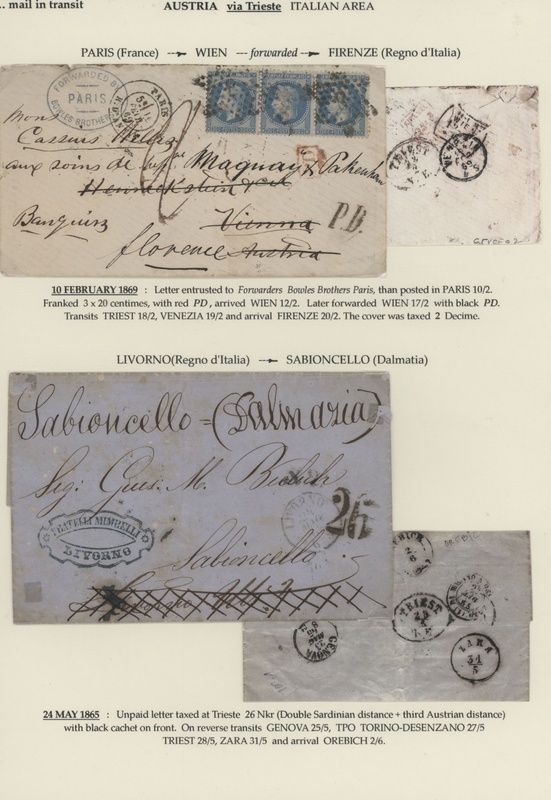 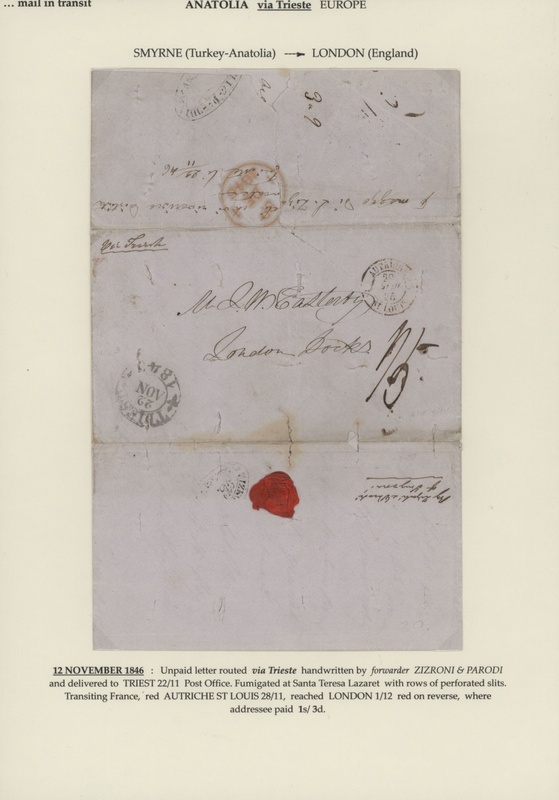 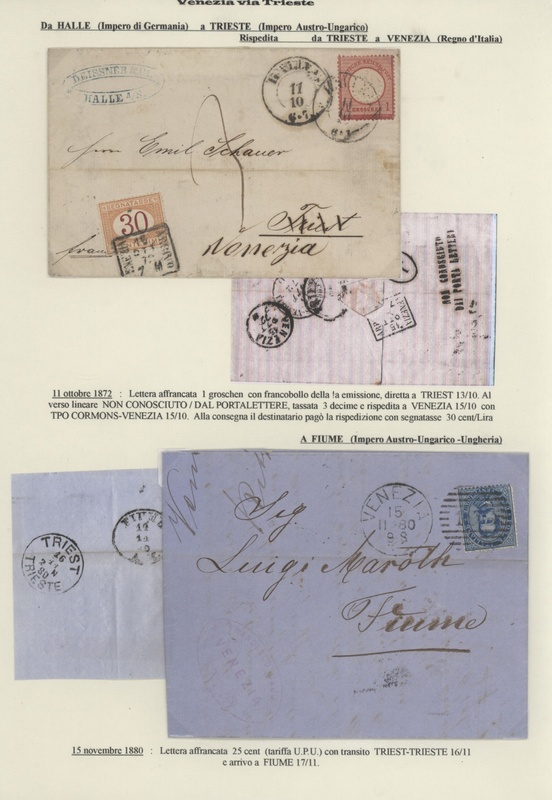 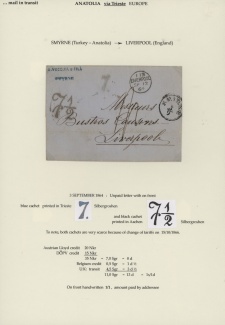 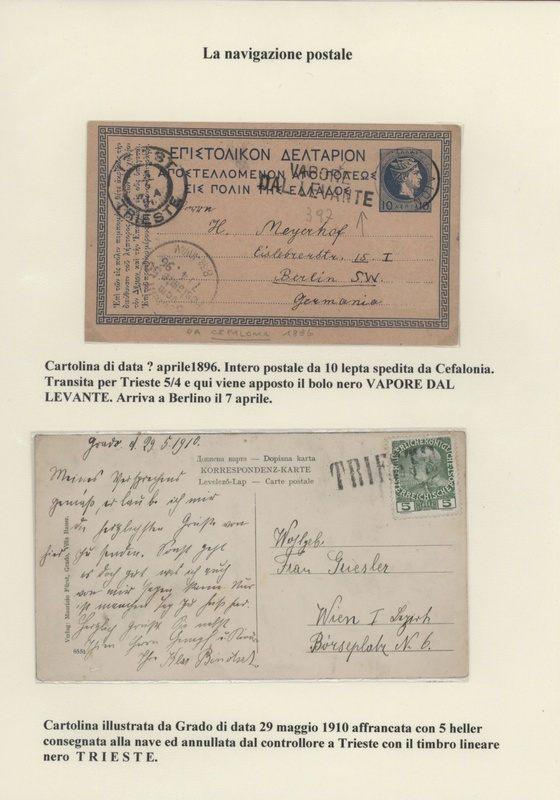 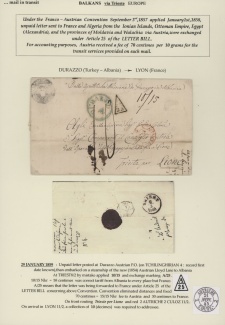 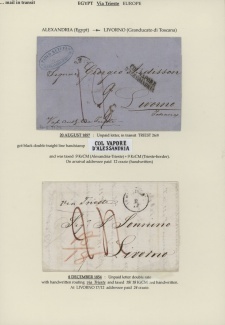 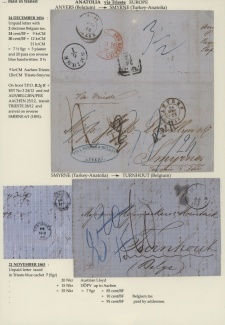 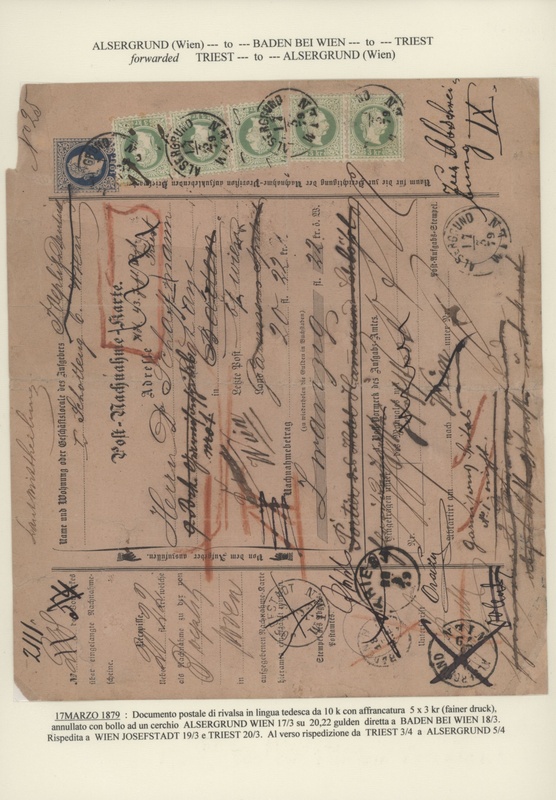 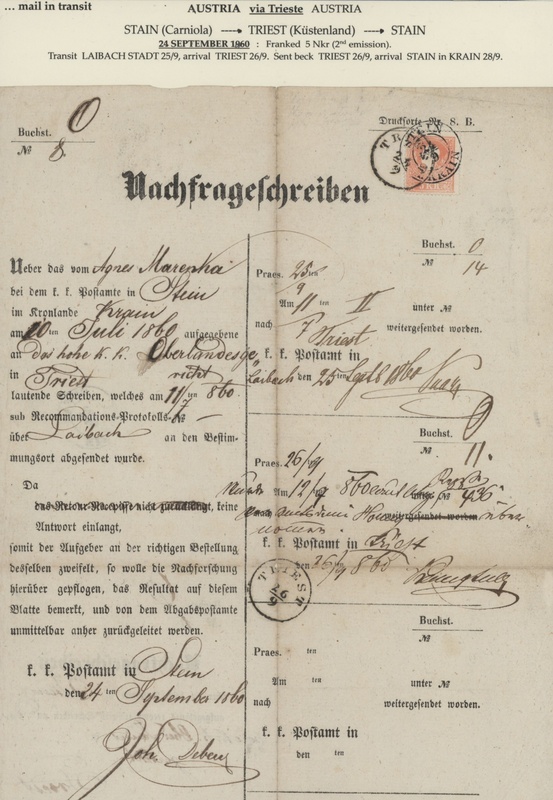 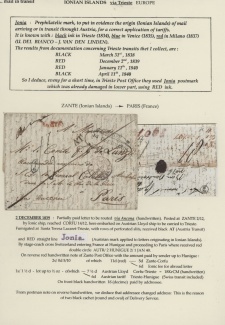 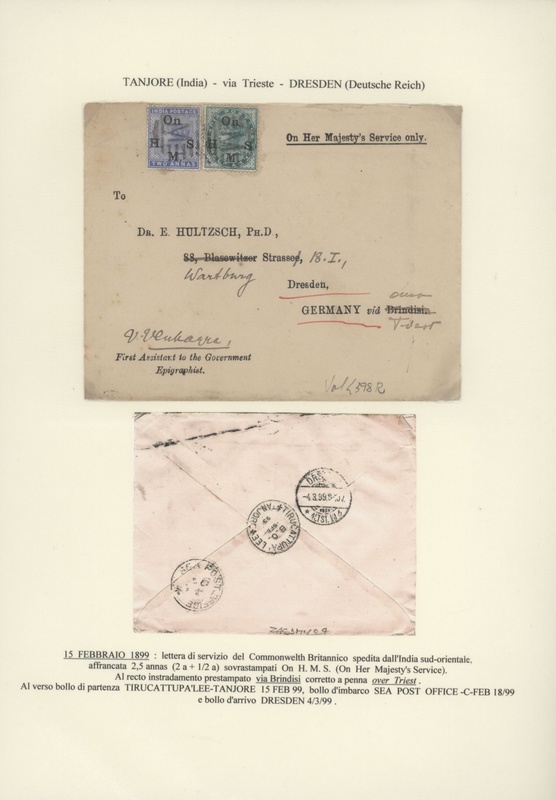 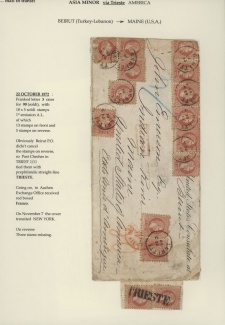 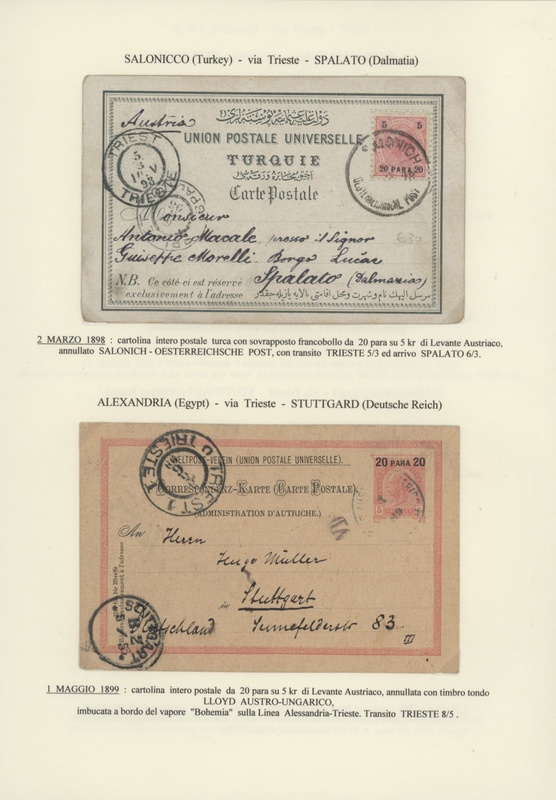 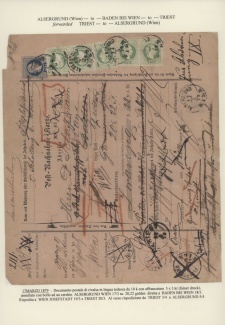 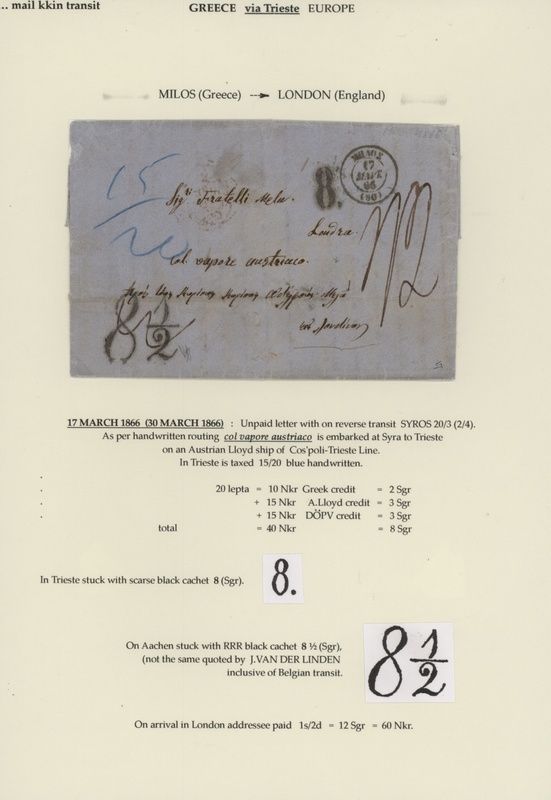 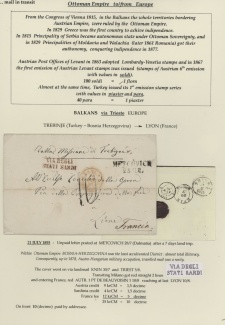 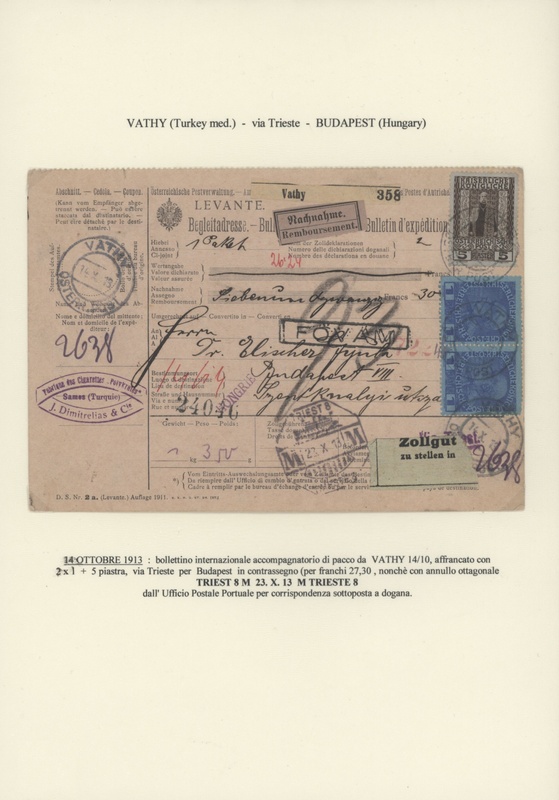 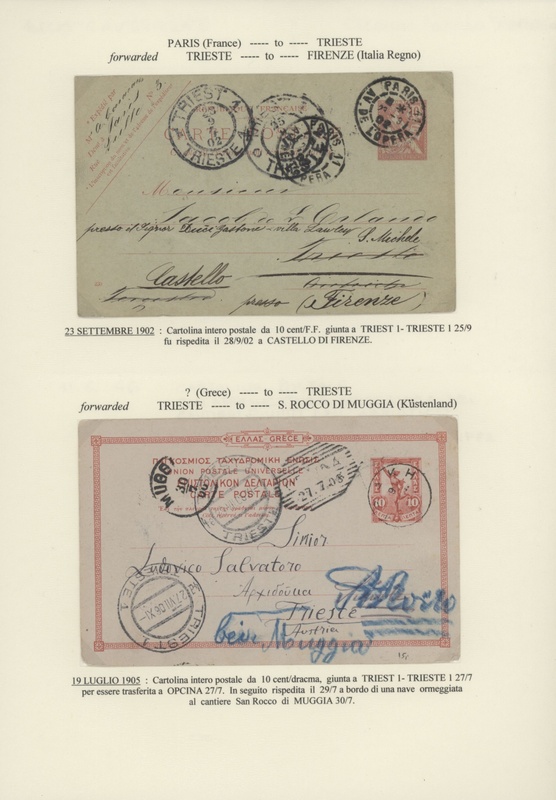 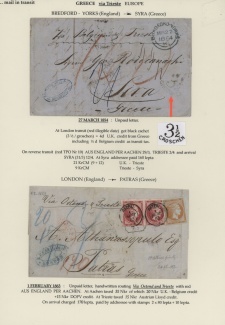 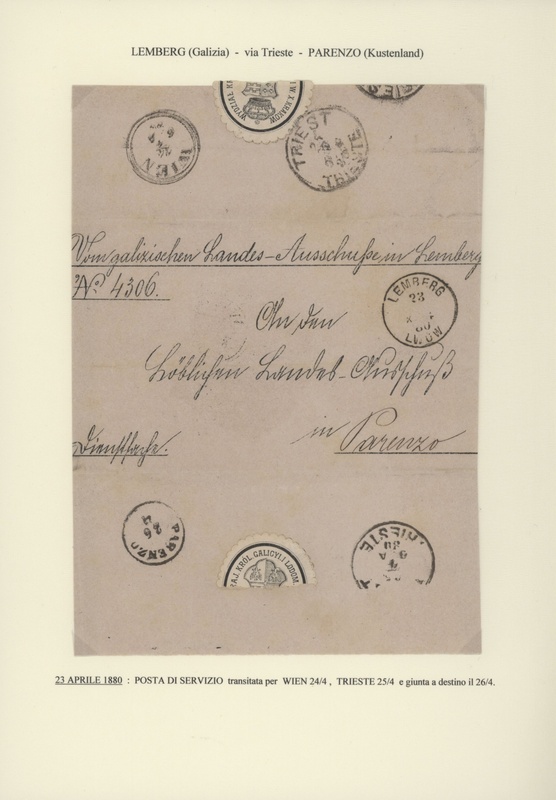 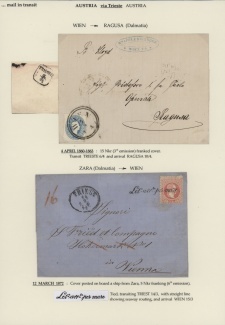 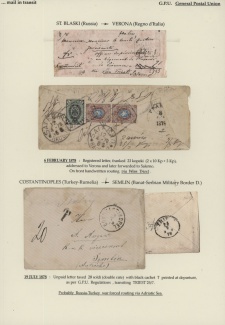 related to Trieste from 1778 to 1918 including ship mail, military and censored mail, special items like postal stationeries from Japan, Russia or German East Africa, 1919 cover from Vlone, Albania, or a late usage of the octagonal M M ship depicting datestamp on a parcel card from Egypt and some other items.